Sounds very explorer-ish, does it not? 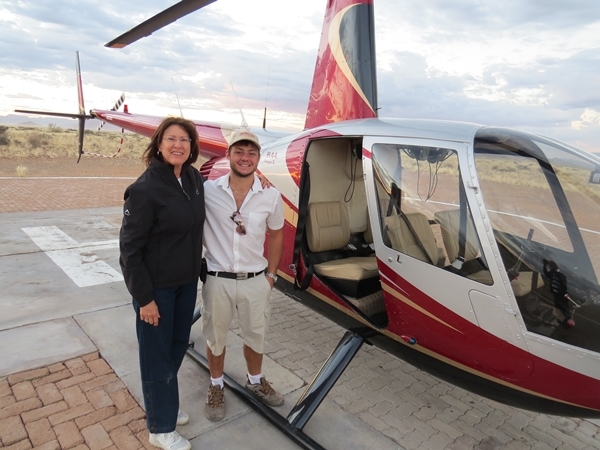 Off to the Kalahari. It conjures up images of the Innkeeper striding grandly into the bush, his trusty Mauser over his shoulder. Followed by Anna fanning herself with a hanky and a phalanx of bearers bearing stuff on their heads, chanting old tribal bearer songs. Sort of 50's Cary Grant. Nothing can, of course, be further from the truth. We will drive in air-conditioned comfort. Not a bearer in sight. 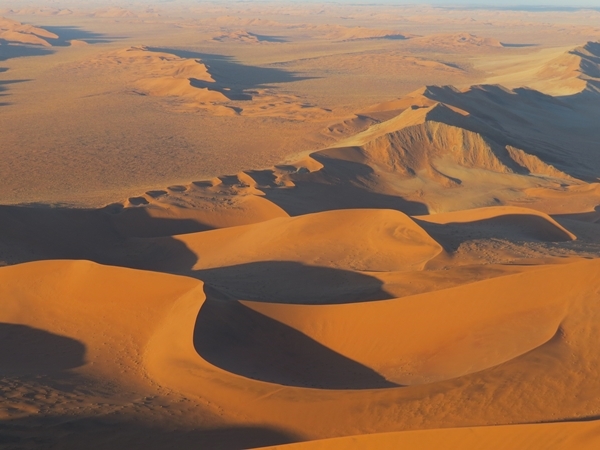 The Kalahari bit is true, though. 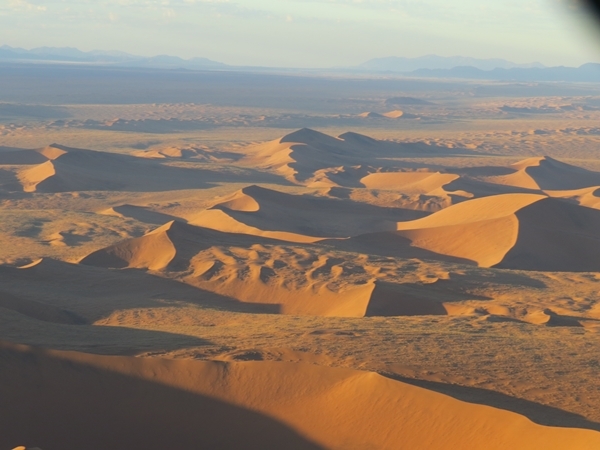 For 7 days we will venture into wildest Africa. 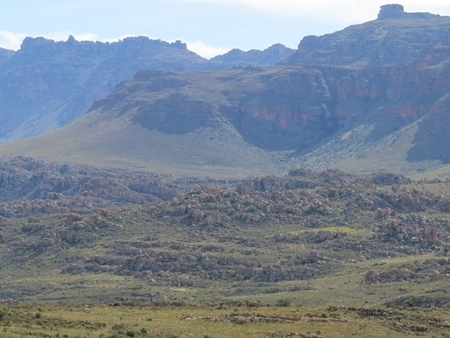 You know it is wild because there is no cellphone reception. Can't very well get wilder than that, can it? Maybe it can.... Two of the camps where we will stay are not fenced. 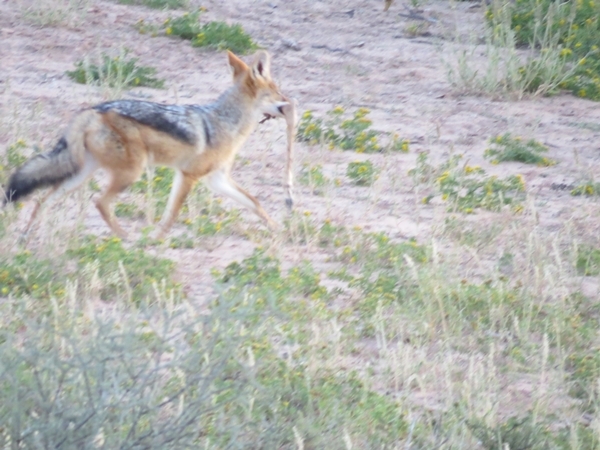 This means that all sorts of toothy critters can wander around unfettered. Like this: Waiting for the water to boil? 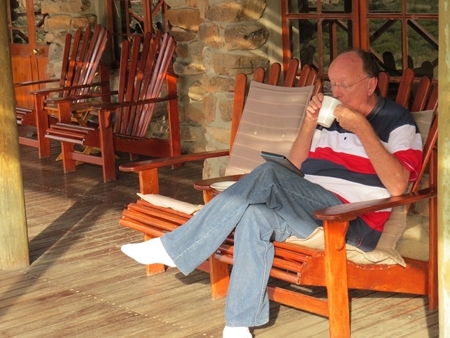 You may well ask why the Innkeeper is going to a game park, knowing that he is not particularly a game park person. 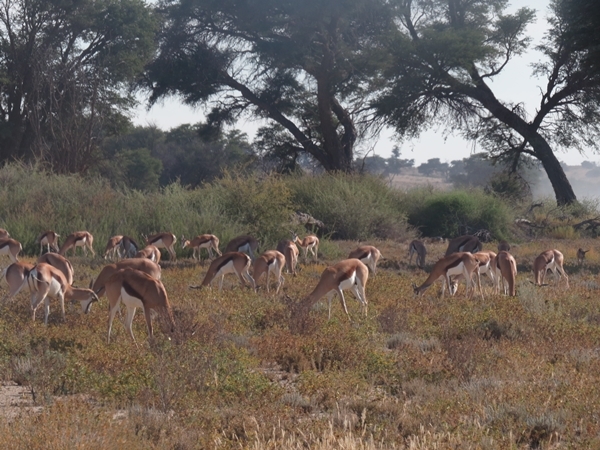 There has to be better things to do than watch an impala nibbling on a bush. 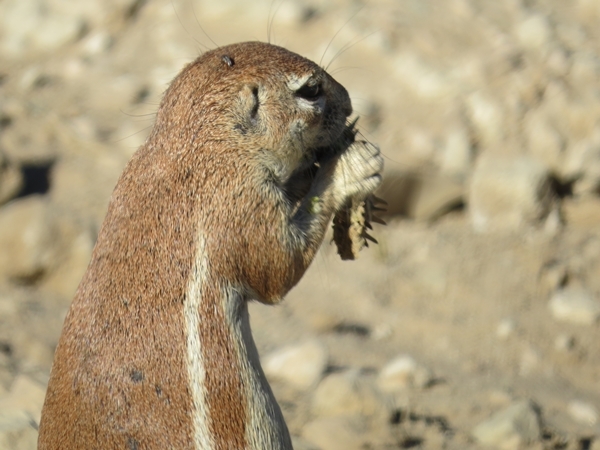 Animals seem to spend an inordinate amount of time eating. 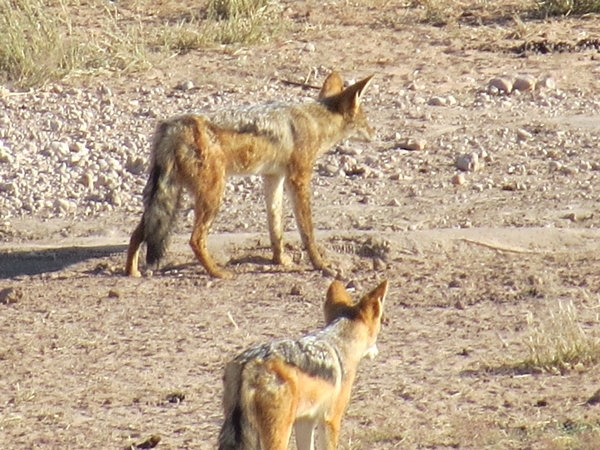 For the rest they just sort of stand around, twitching their ears. And, of course, excreting. Stands to reason, after all the nibbling. 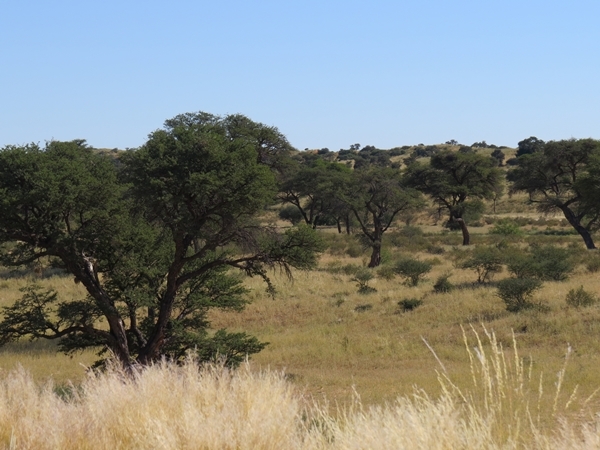 The thing, though, is this: Anna loves the bush and game reserves. I love Anna. He can carry on, can't he? Sometimes he is otherwise just to be otherwise. 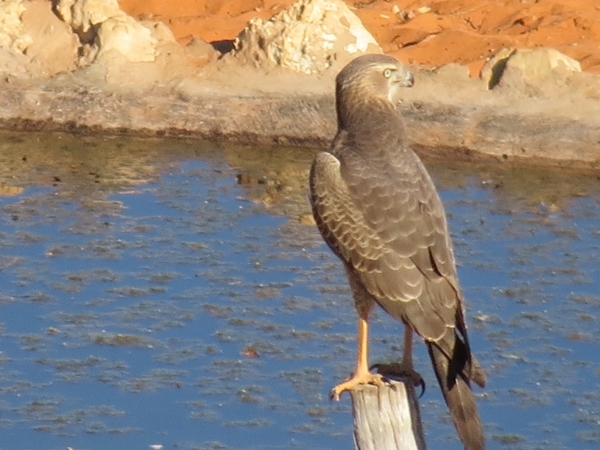 He knows perfectly well that he will enjoy the game park. 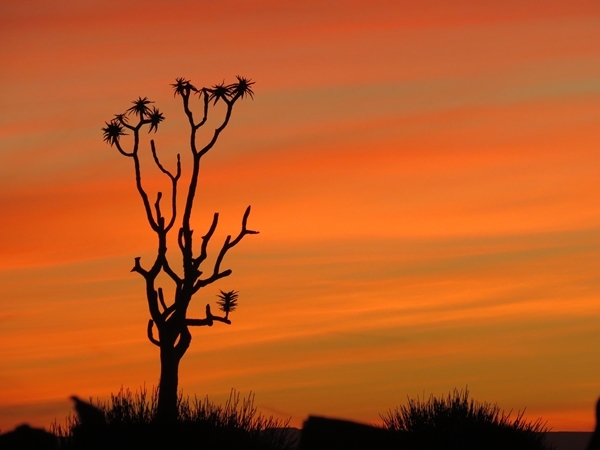 In any event, only the first part of the holiday is in the Kalahari. 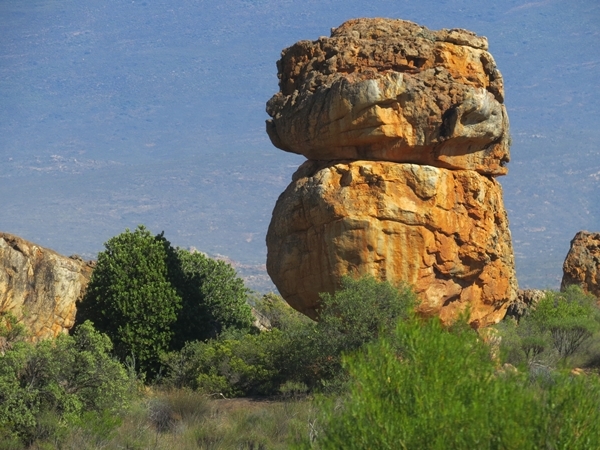 The greater part of the holiday will be spent exploring the Cederberg area. We have never been there and want to go. 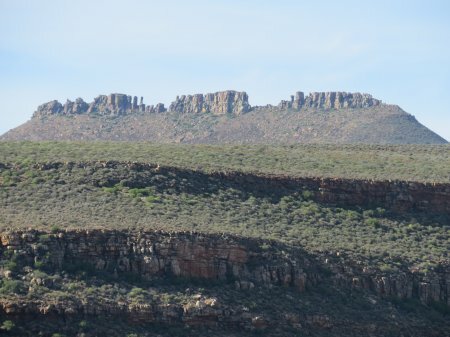 This is the overall journey: And this is the Cederberg: We plan to be away for about 4 to 5 weeks, depending, I guess, on how charmed we are by the Cederberg. Anna has done scads of research. 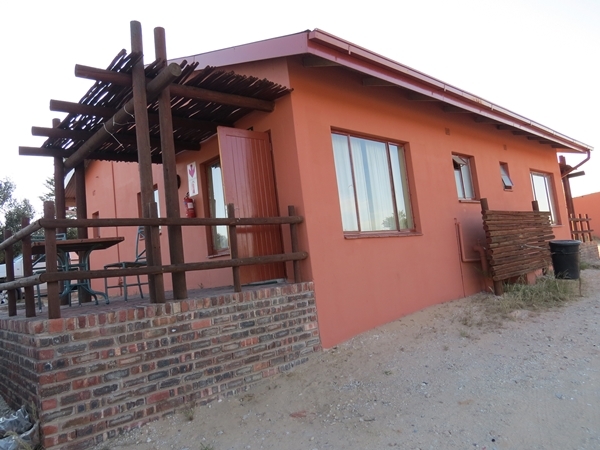 We are booked for the first week - the Kgalagadi Park accommodation is snapped up pretty smartly. 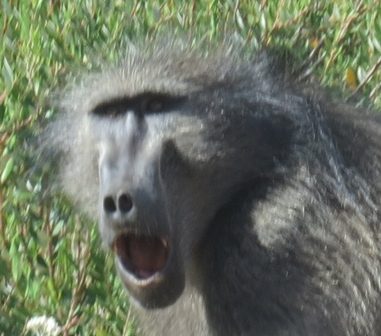 Departure on 29 April. 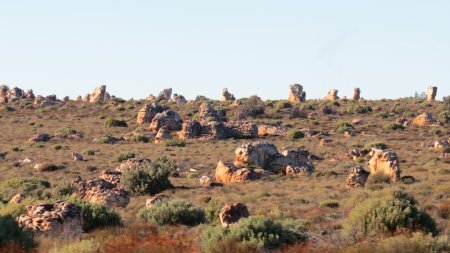 We probably won't have access to the internet in the Kalahari, so the first en route blog will be a full update on the entire Kalahari thing. If we survive to tell the story, that is.......... So the journey started. As most journeys do, with the gepak. The Innkeeper, known to swing into action with great gusto when things need to be done, swung into action with great gusto. Homing in, as is his wont, on the most important parts of the work. Soon, with his usual efficiency, he had taken care of what most needed to be done and could stand back proudly. 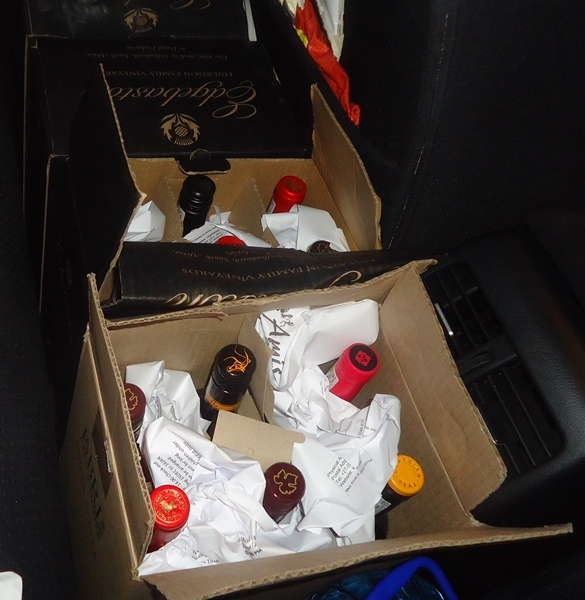 Sure – this is what he did – loaded 4 boxes of wine into the car: leaving me with the rest.) Anna took care of the remaining bits and pieces and off we went. 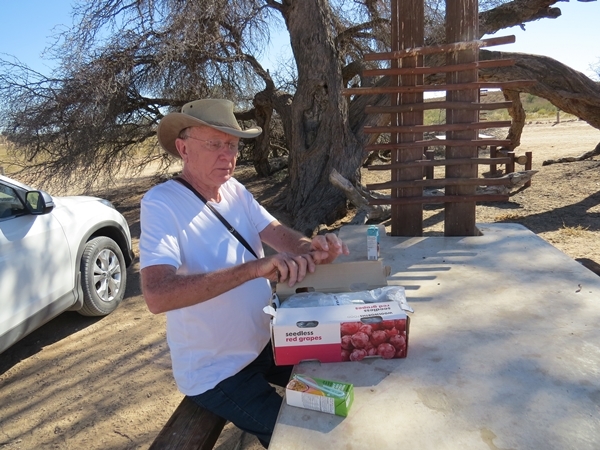 First stop was the baker to pick up fresh ciabattas for the animals in the Kgalagadi. 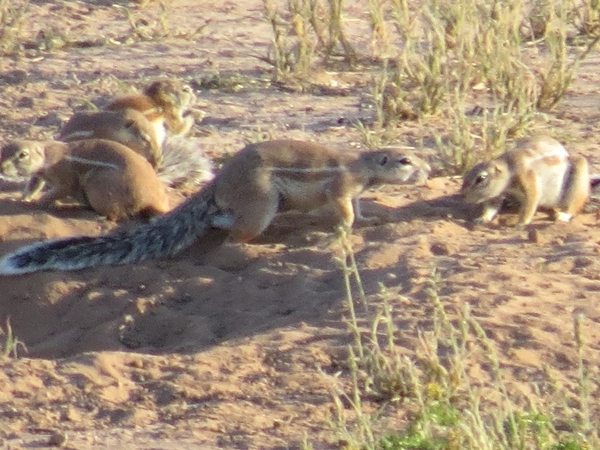 No, no, for us while watching the animals in the Kgalagadi. 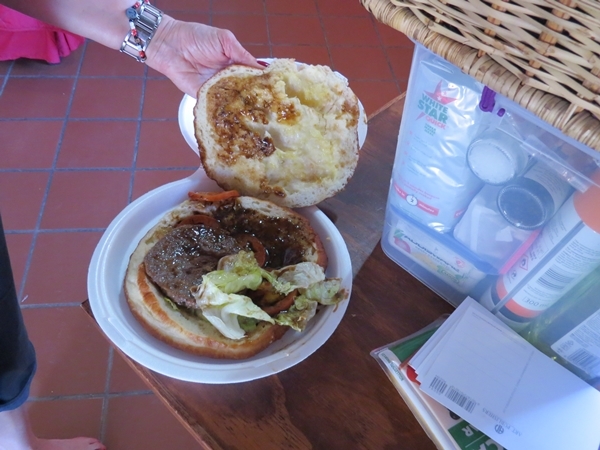 Next stop was at the inimitable Hester, who had prepared padkos – snacks for the trip. 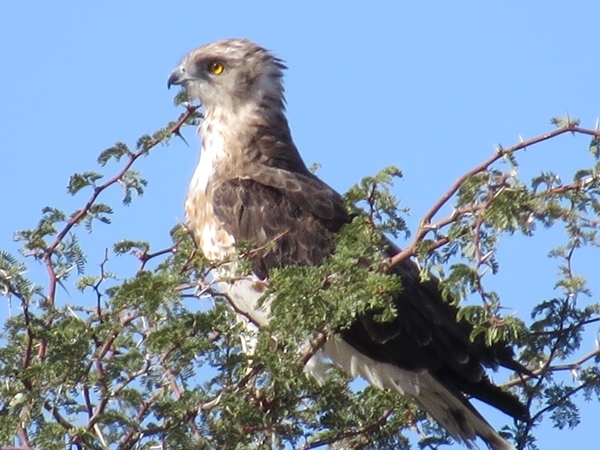 Intended mainly for breakfast, we discovered a feast – crumbed chicken, boiled eggs, sandwiches, sweets, biltong, fuit juices...food enough for an exodus. And then there were the frikkadels. Oh, such frikkadels! Fit for a king. 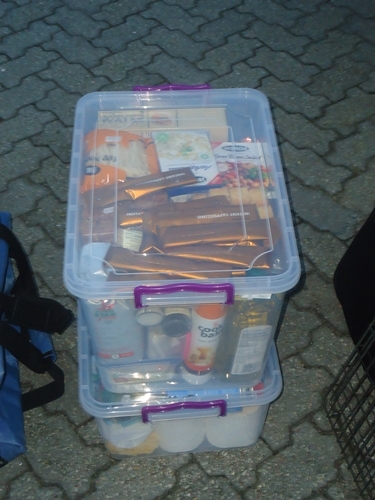 Thus armed against attacks of the munchies, we left for Carnarvon. 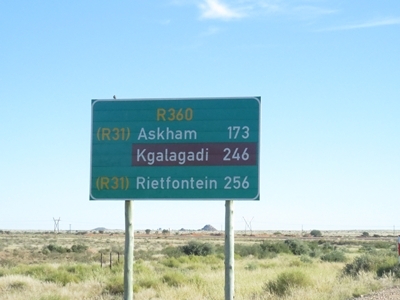 All of 450km from Wilderness. 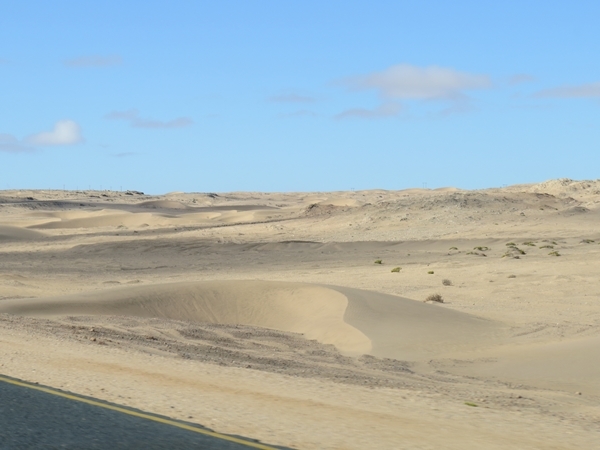 The trip was remarkable for the vast quantity of nothing we encountered. 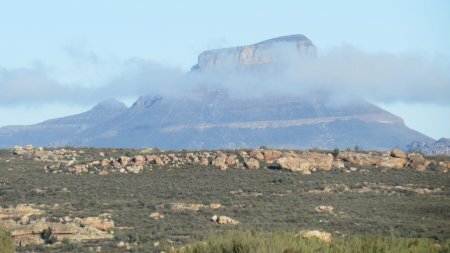 This may just give you an idea: When we encountered some mountains just outside Beaufort West, we were quite giddy with excitement. There are towns. There are villages. 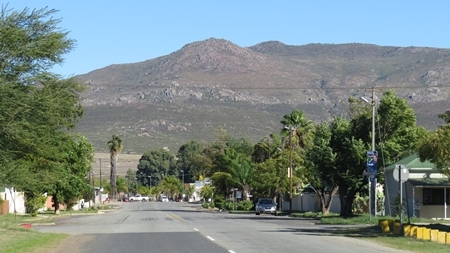 And then there is Carnarvon. Far, far away from everything and entirely devoid of charm. 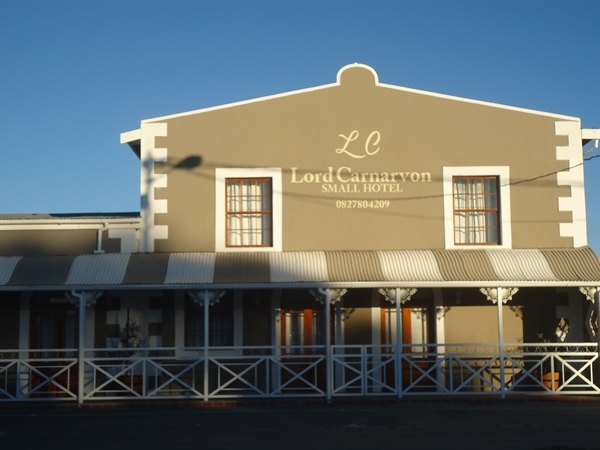 We found decent lodging at the grandly named Lord Carnarvon hotel and were assaulted by dinner at the Meerkat restaurant next door. Anna had a halfway decent chicken schnitzel and I did battle with lamb chops. The pale things in the foreground are the world's worst French fries. Won prizes and all. We eschewed the hotel breakfast and feasted on the remnants of Hester's padkos. 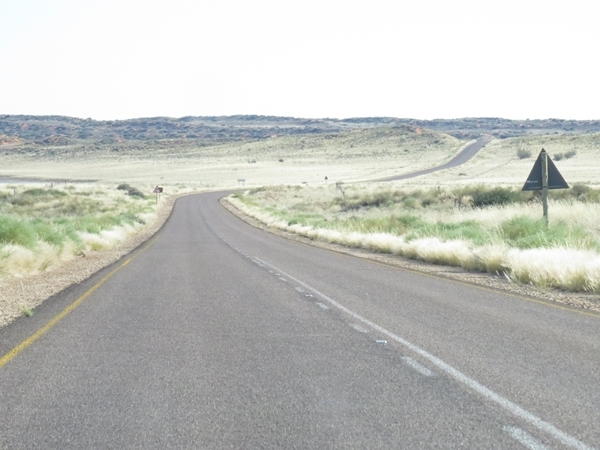 Today the road would lead us to Van Wyksvlei 80km ahead, Kenhard 140km after that, followed by Keimoes a further 120km onwards and then Upington after a last stretch of 50km. All but the last 50km on gravel. 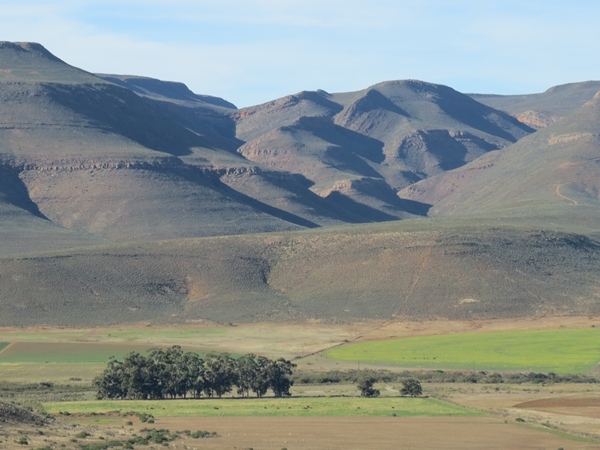 We got a lot of this: but the scenery remained fascinating. 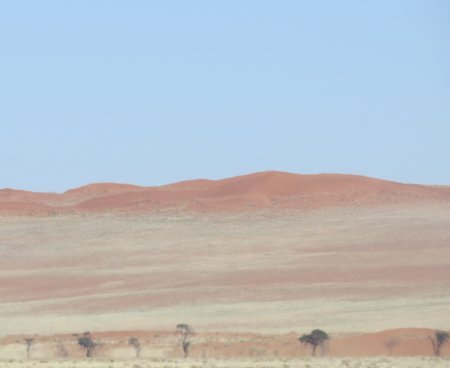 The sheer desolation eventually, at around 100km, acquires a strange charm. The Innkeeper was, to my surprise, calm and handled the driving very well. 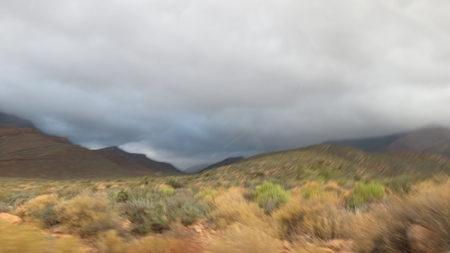 We hardly noticed Van Wyksvlei whizzing past. 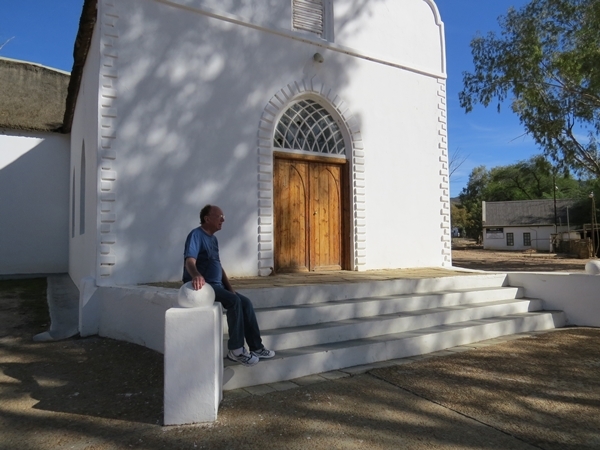 Kenhard was remarkable for being completely unremarkable and we arrived in Upington still fresh. 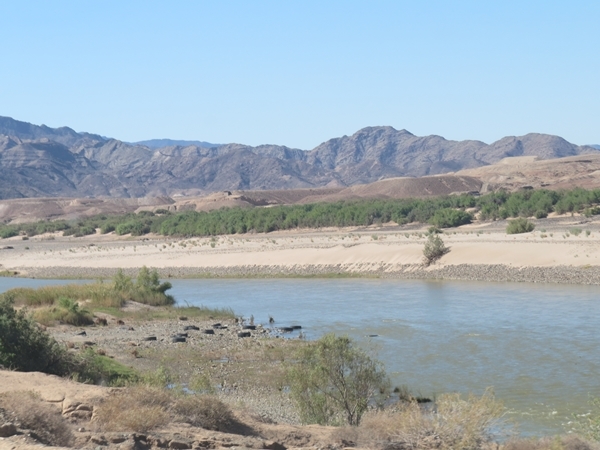 We had a room booked at the Sun River Lodge, on the banks of the Orange river. We sat on the banks of the river and had a beer. 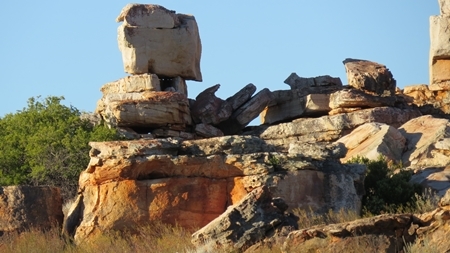 Which is what you do in Upington. Some last minute shopping saw us back at the lodge in time to have this thrown at us: Anna's chicken with accompaniments (to spare your sensibilities, she had removed half of her chicken to a side plate, where it lurked ominously until I started feeding it to a passing sausage dog) and my fillet steak Both enough to feed a hungry lion. Which we were not. 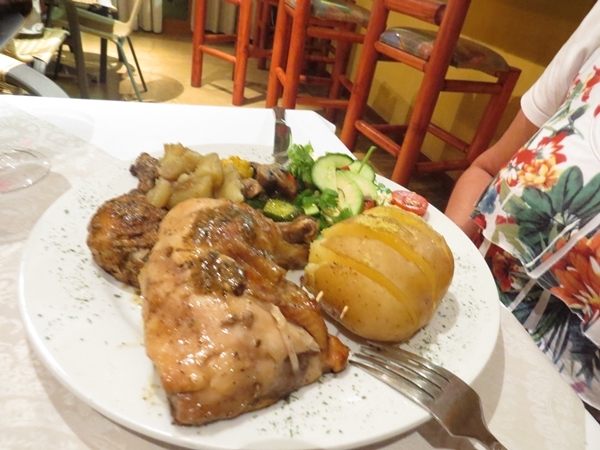 We nibbled delicately around the edges, to the amazement of the staff who thought a 600g fillet and two chicken leg quarters just the right size. 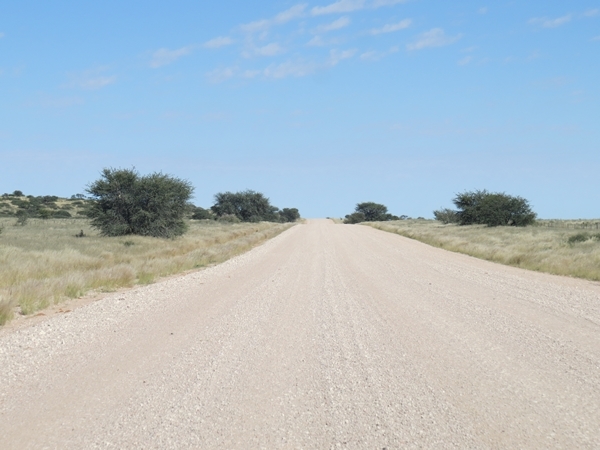 Some images that shortened the road for us: Upington to the Kgalagadi: This was the longest single stretch of road between two points with nothing in between that we had ever seen, never mind driven. The road went on. And on. And on. 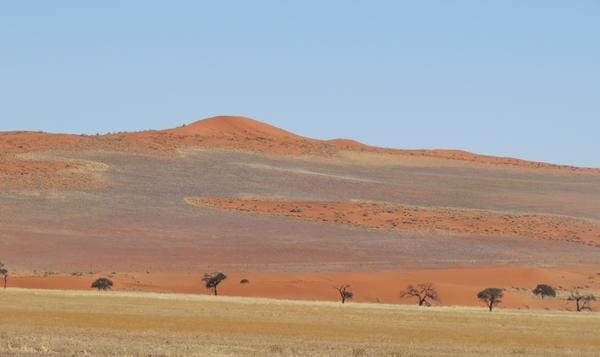 Initially just shrubs, but eventually red Kalahari dunes and trees. 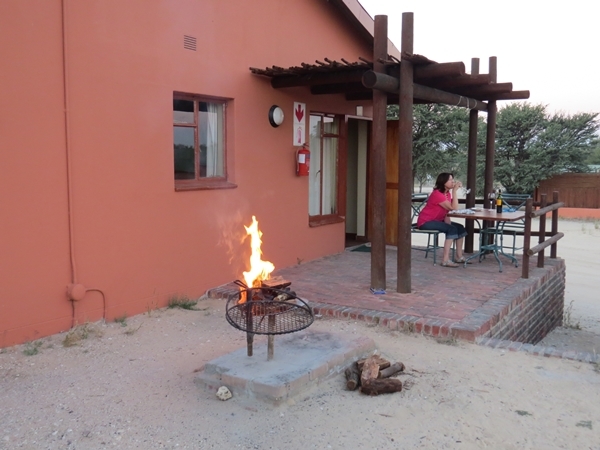 Eventually we arrived at Twee Rivieren, a quite charming camp and was directed to our equally charming chalet. Against which you see the Innkeeper leaning nonchalantly. There was a take-away facility and we thought we'd be fools not to buy lunch rather than prepare it ourselves. So we did. 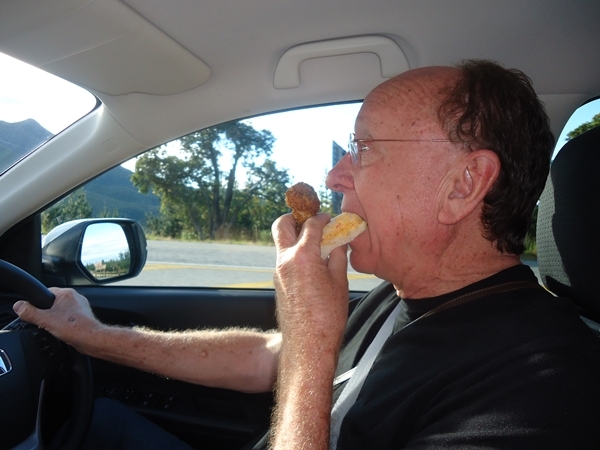 How bad can a vetkoek burger be, after all? Let me tell you, bad! Very bad. It was the size of a frisbee and about as appetizing. Here is the thing, and we advise sensitive readers to look away: Needless to say, it was put aside for the cleaners. 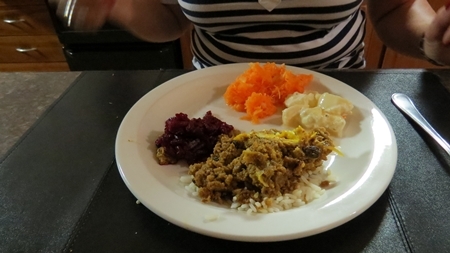 Anna's vetkoek curry was also the size of a ufo, but was at least not soggy with a dubious burger sauce. We split it in 4 and each ate a quarter. 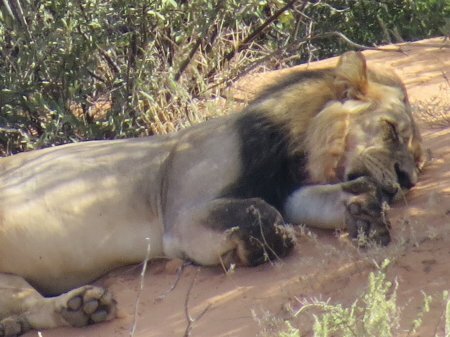 After a well deserved nap, we set off on a game drive. 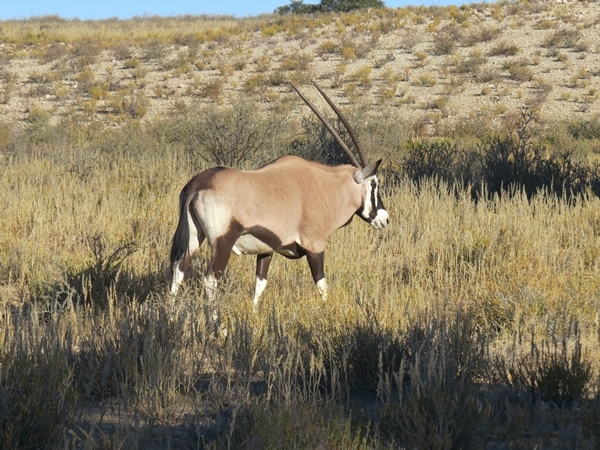 We saw plenty of Gemsbok, and springbok and some wildebeest That was pretty much it, large mammal-wise. The drive was nonetheless interesting. 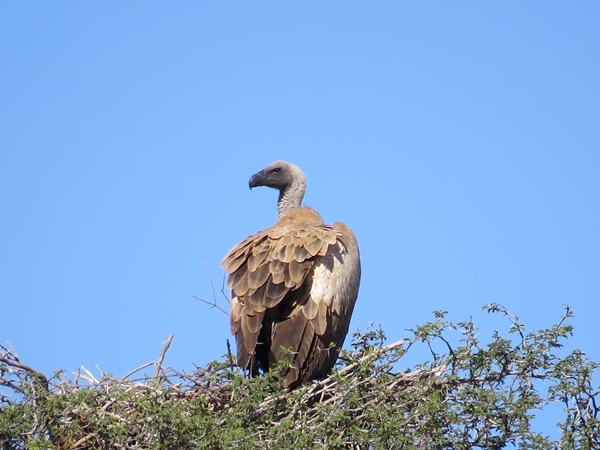 A vulture perched high in a tree, waiting for something to die. Or be killed. We found the weaver nests fascinating Long stretches where it appeared as if nothing much was around, game-wise, there was always an interesting bird to be seen or a ground squirrel muching away or looking cute The ground squirrel has the largest pair of balls, pound for pound, of all the mammals on earth. 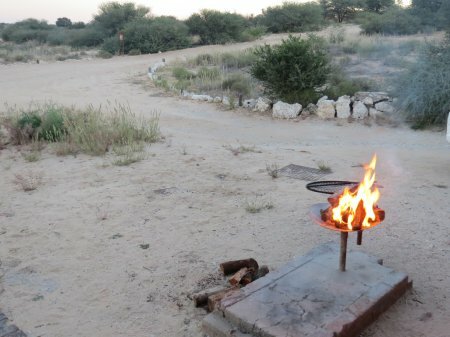 We returned to the camp, quite contented and at peace. Night fell and we prepared to do dinner. 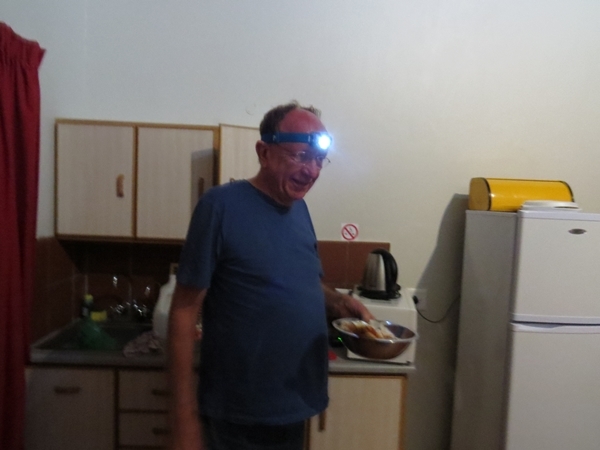 This involved the Innkeeper donning the headlamp kindly donated by Jan Pouring wine and lighting a fire. Please note the fire in the foreground in the above pic. That is the one prepared by the Innkeeper. I will not blame you if you look at its professional appearance more than once. Do not feel inferior - some of us are just so gifted when it gets to fires. Some of the neigbours came around, asking for advice, or simply staring in awe. I signed a few autographs and shooed them away. I had meat to cook. It was an instant light charcoal fire, for heaven's sake! Typical Innkeeper carrying on. A quick omelette for breakfast and we were ready to go at 7am. This, we were told by Jan, is essential as the game is active only early in the morning and late afternoon. 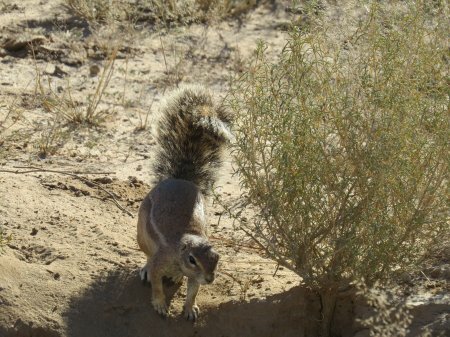 From about 10am to 4pm they do not move around much and tend to shelter from the sun. 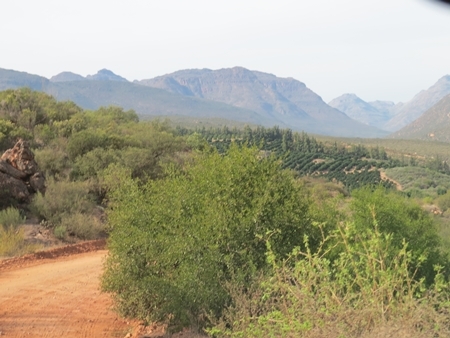 Morning and afternoons are for game drives. The rest of the time you copy the animals and hunker down. Read, drink beer. And stuff. The advice proved astute. 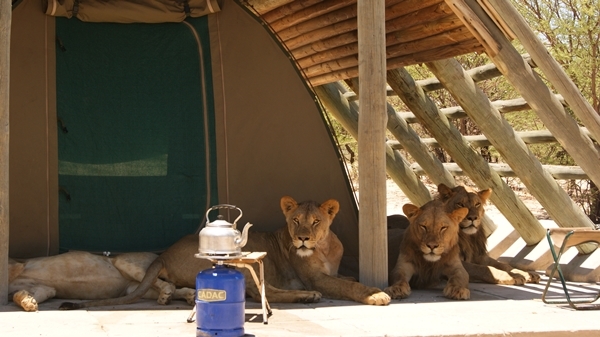 Not that the place teems with wildlife at any time – the animals have all of 80,000 sq.km. to rove in, after all. 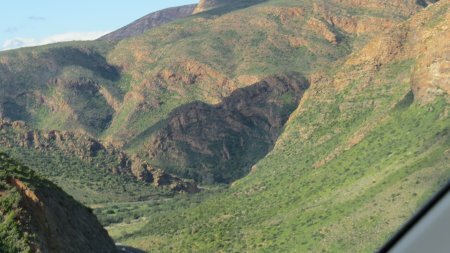 The roads generally follow the course of two dry river beds, those of the Nossob and the Auob rivers. 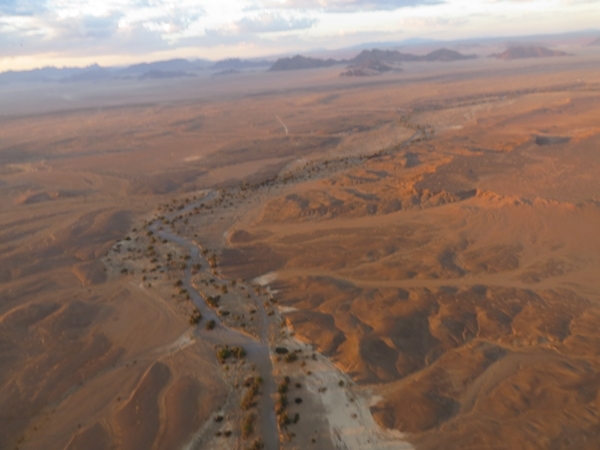 I use the word 'rivers' with major reservations – the Nossob has actual water once in a 100 years and the Aub once in 10. 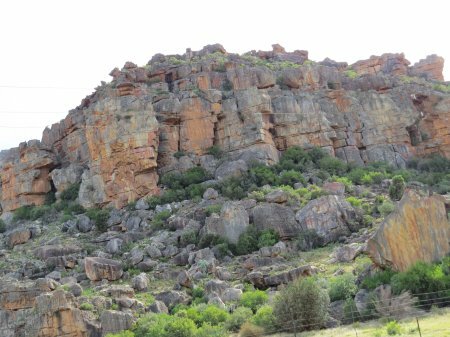 They are, however, a shallow, fertile valley that attract antelope and hence predators and the other animals that occupy a niche in this ecosystem. 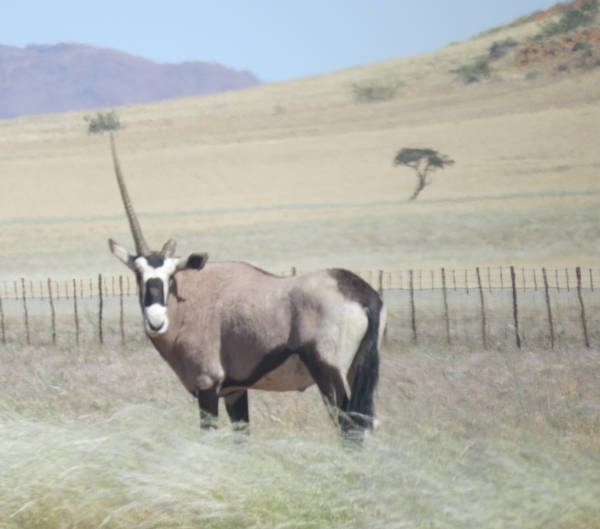 There are always Gemsbok, Springbok and Wildebeest to be seen, It seems that you need to be very lucky indeed to see much else driving along the roads. 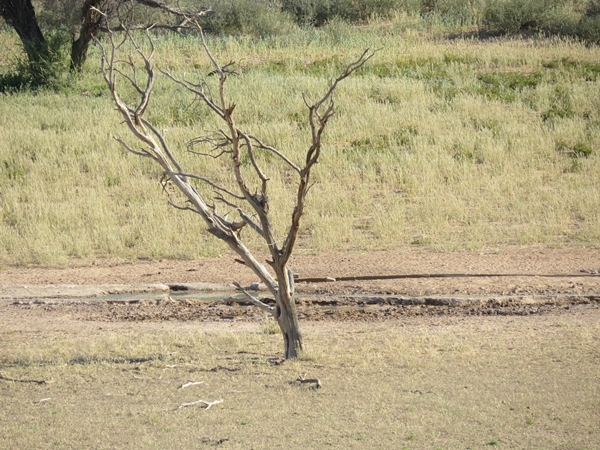 The thing to do, we think, is to settle down at a water hole and wait. Which we hoped to do in some style at Kielekrankie. 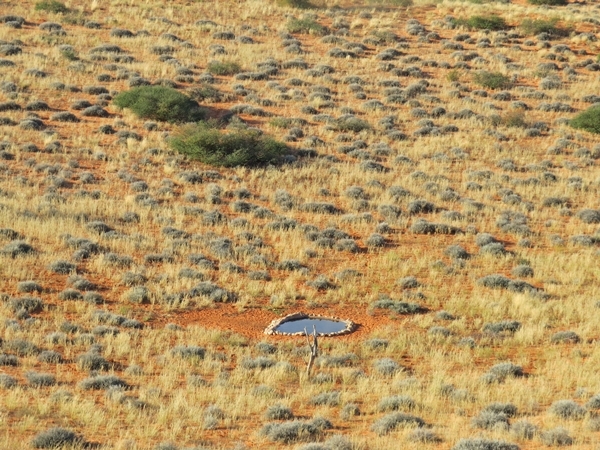 4 huts, unfenced, overlooking a wter hole. We shall see. 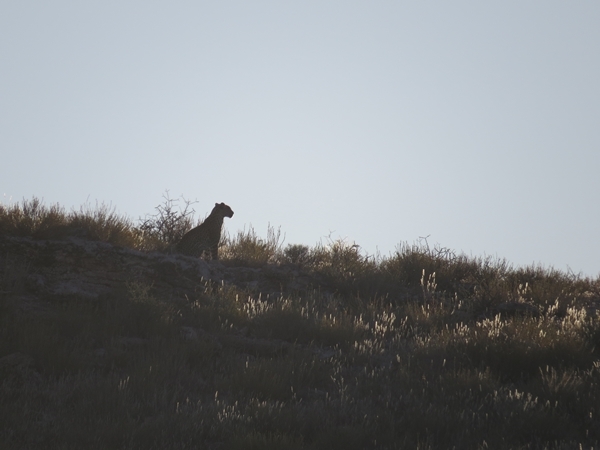 We had hardly left Twee Rivieren when we spotted a leopard silhouetted against the morning sky on a ridge a few hundred meters from the road. 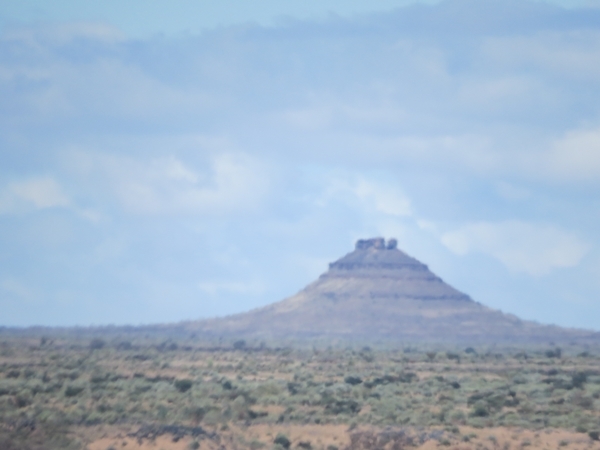 This was the best we could do, at maximum zoom. 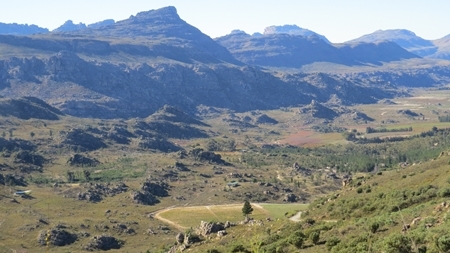 There are picnic spots here and there, equipped with loos and such. We made a welcome stop at one such. Kieliekrankie was all that we expected. And more. 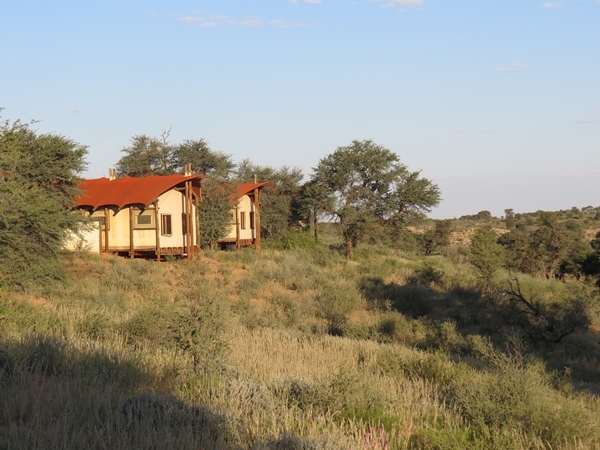 Located in a expanse of grass and shrub covered Kalahari dunes, the huts all overlooked a watering hole. 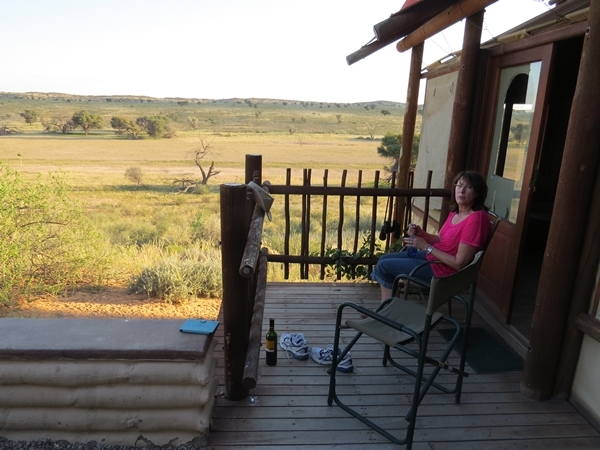 We settled in on our deck and kept an eye on the water hole. 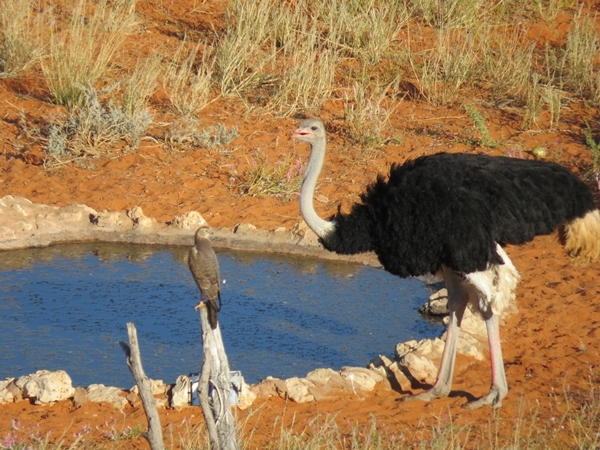 There was always some activity – a gemsbok A heron a falcon ostriches that came to drink water and to munch on the tsammas, a melon-like fruit that is one of the staples of the Kalahari. 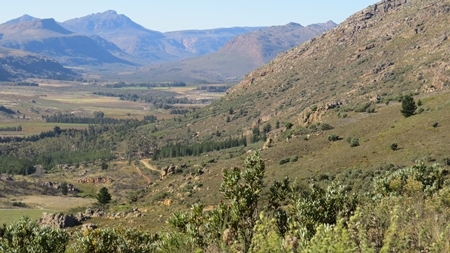 There were two remarkable things about Kieliekrankie: First the deafening quiet. We had never before in nature experienced such a silence. The only sound was the blood coursing through the veins in your ears. 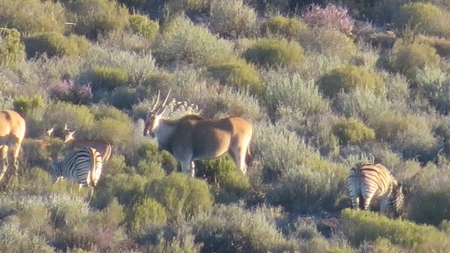 Soon some evening animals made their presence known, but for a few minutes around sunset, man, it was magic. 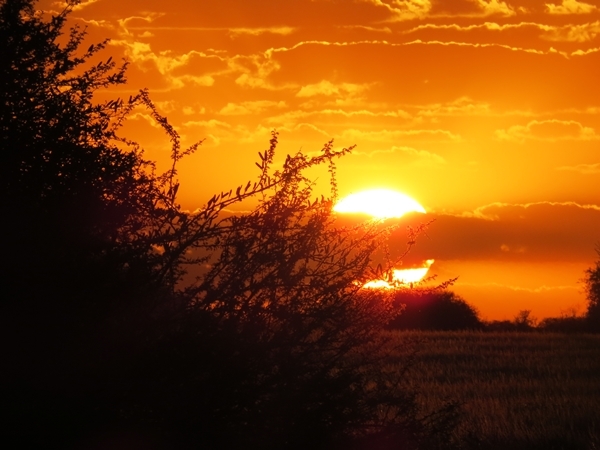 Then the sun set and the stars became visible. And the expanse of stars. 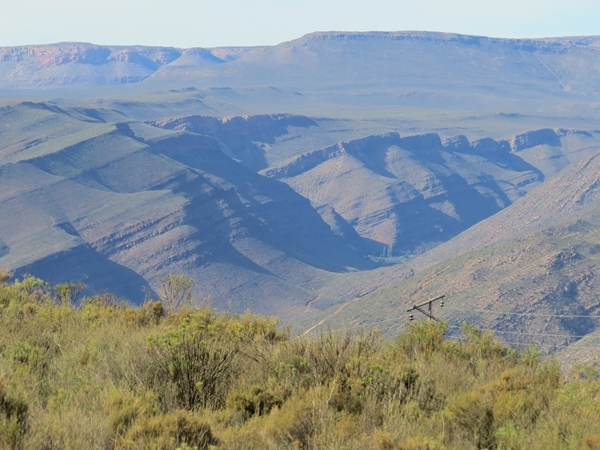 Breathtaking, humbling and a sight worth the 1200km drive all by itself. Contented, we lit a fire and watched the sun set behind the dunes. The next morning we bid Kieliekrankie adieu- somewhat sad. A second or even a third night here would have been great. Alas, not te be. Off to Nossob we went. 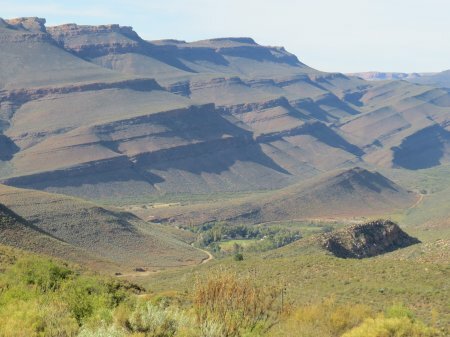 150km towards the north of the park. 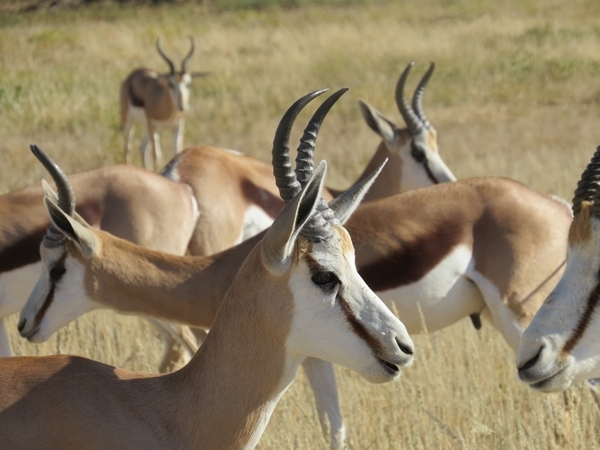 Strain as we could, we saw more gemsbok and springbok. 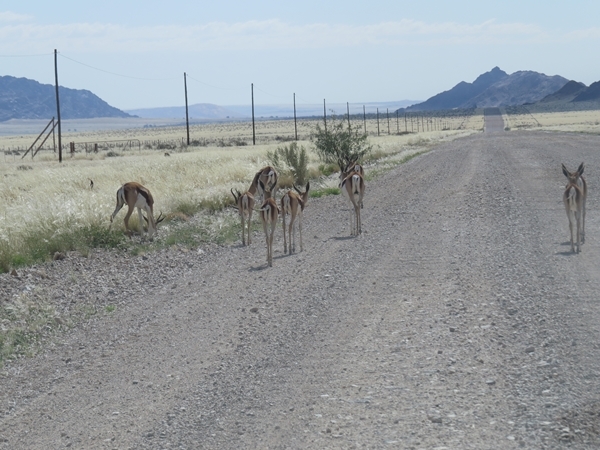 This was the repeating scene along the road- springbok, gemsbok, wildebees, gemsbok, gemsbok, wildebees, springbok. 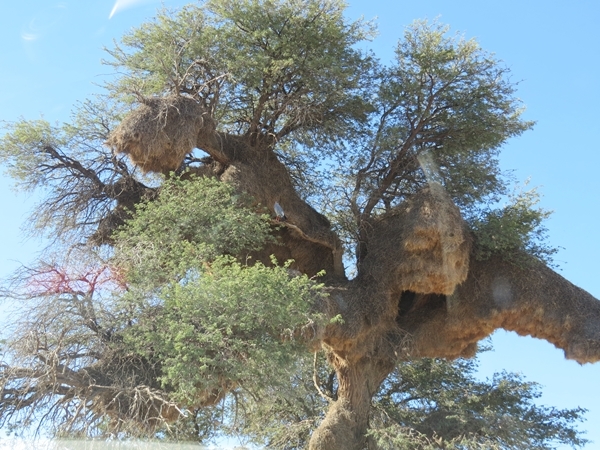 Just when we despaired of seeing anythings else, we spotted a lump under a tree about 300m from the road. 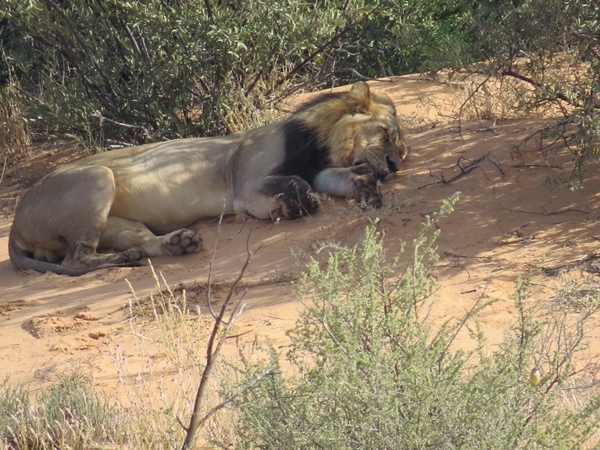 It was an actual lion taking a late morning nap. 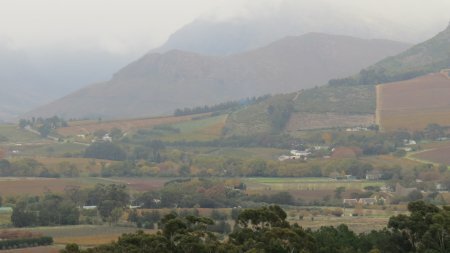 The excitement of the sighting took us into Nossop, a most dreary place. 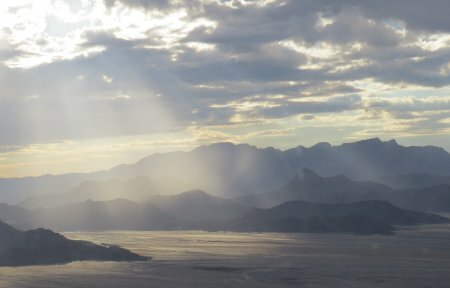 It was dusty and weary-looking. There was sand everywhere - luckily the wind did not blow...... Our chalet was ok. The Innkeeper soon had a fire going. 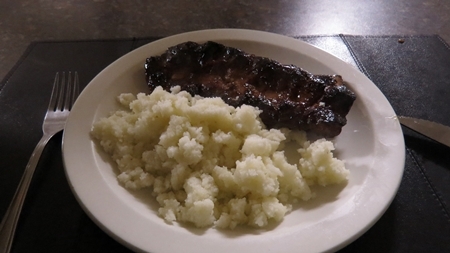 and braaied some spare ribs with his usual flair. Note the classic shape of the right arm in the pic of him salting the rib below. 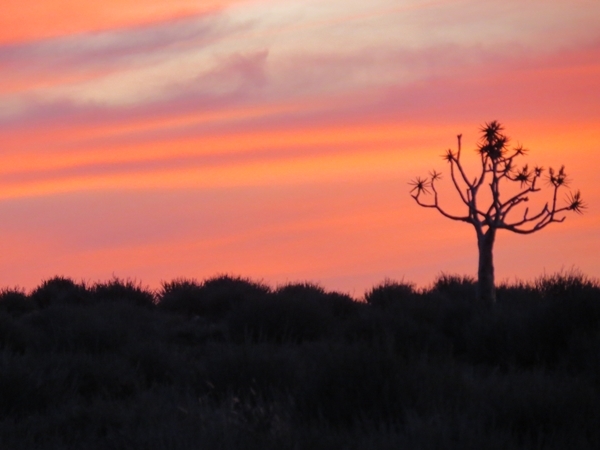 Takes your breath away, doesn't it ? No, actually it doesn't, but we won't tell him, will we? 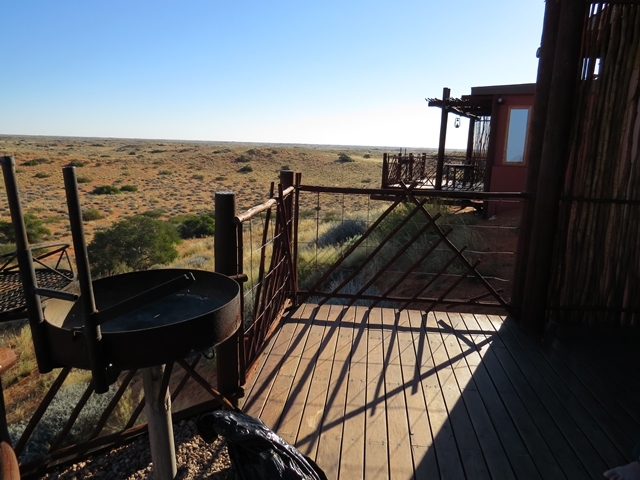 Our last stop in the Kgalagadi was the Kalahari Tented Camp near Mata-Mata on the Namibian border. We made breakfast and went. 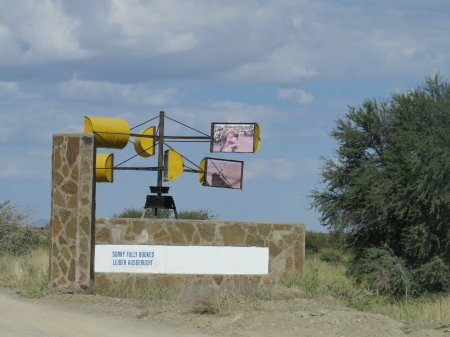 Just outside Nossop the Park authorities had thoughtfully stationed this mileage indicator, so that those dreading the drive to Mata-Mata can feel even more despondent. 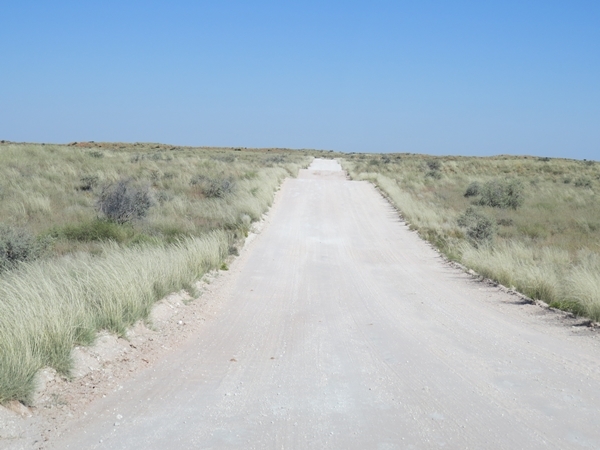 On that note – the roads in the Kgalagadi are uniformly bad. 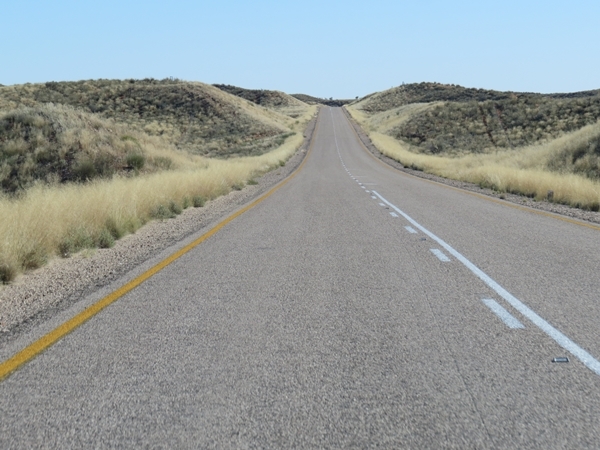 A stretch here and there is passable without rattling your teeth, but even with reduced tire pressure, most sections are, lets say, difficult – severely corrugated. 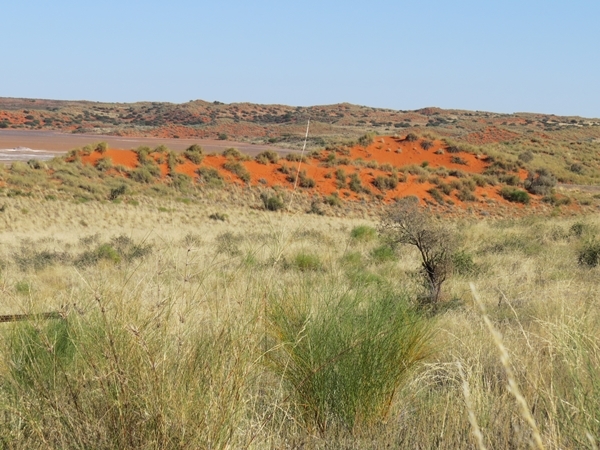 When you travel at a speed conducive to looking for game, the corrugations get you. 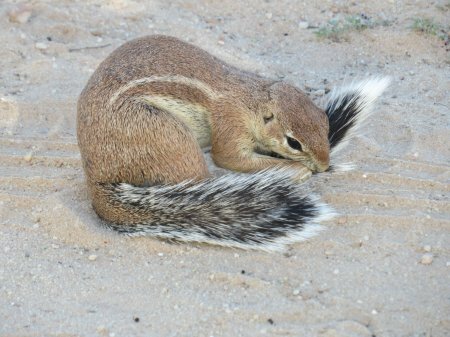 When you drive at around 50k's, you easily miss animals at the roadside. 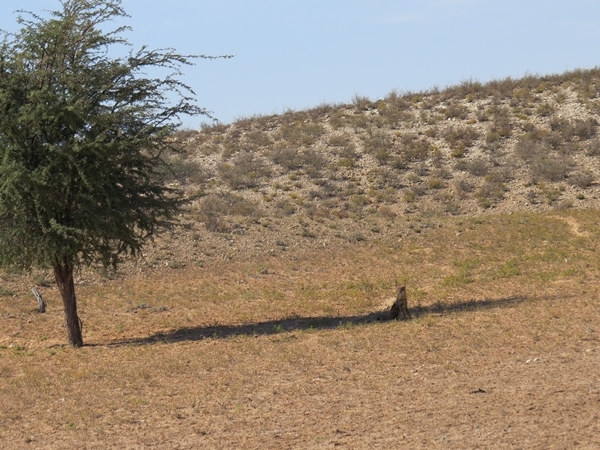 An example in point was this jackal: He was sitting in the shade of a thorn tree and we could so easily have missed him, as you'll see when you look at the wider view: Except for the jackal, the road was pretty boring: Eventually – the Kalahari Tented Camp: This is camping lite – you don't have to set up camp. 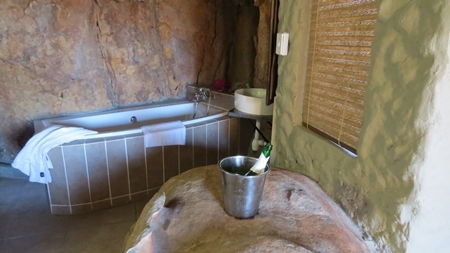 And with en suite facilities nogal. It was as well, because campers we are not. As it is, I had developed a serious inferiority complex at that point. Almost all the other vehicles sported roof racks. 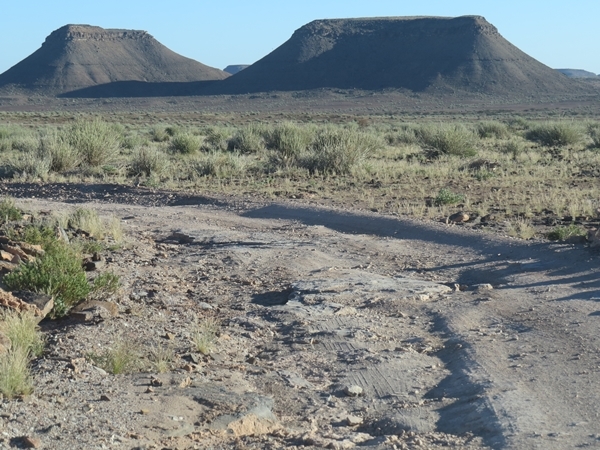 Some had camping trailers and stuff, but it seems that you need at least a roof rack to be regarded rugged enough for the Kalahari. Next time I'll put up a roof rack and just strap random stuff onto it. 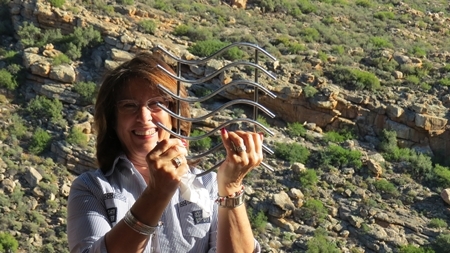 I can then hang out with the guys - “What, this old roof rack? Been in the family for years...” 7 years ago he would not drive further than 100km - at least that is what he said. Now I have got him so far to actually enjoy driving. Give me two more years and maybe the roof rack is really next.... The camp is also not fenced. Each tent has a parking area that can be enclosed with a gate. This, I have been told, is to keep the hyenas from munching the tires. 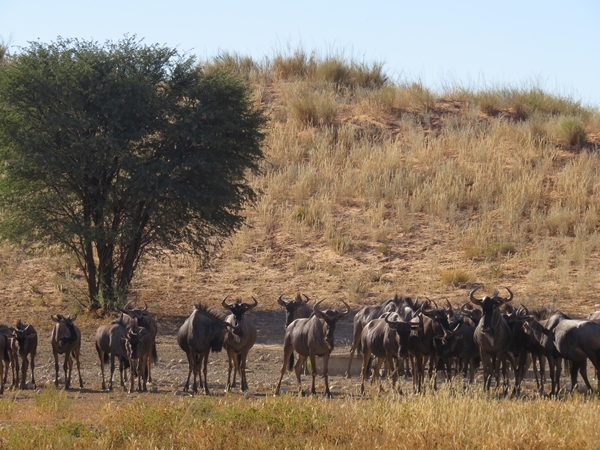 One would assume that they are not that keen on munching people, given that the only barrier between them and us is canvas.... Our tent overlooked a waterhole, which was completely deserted when we got there. This situation changed while we had our midday nap. 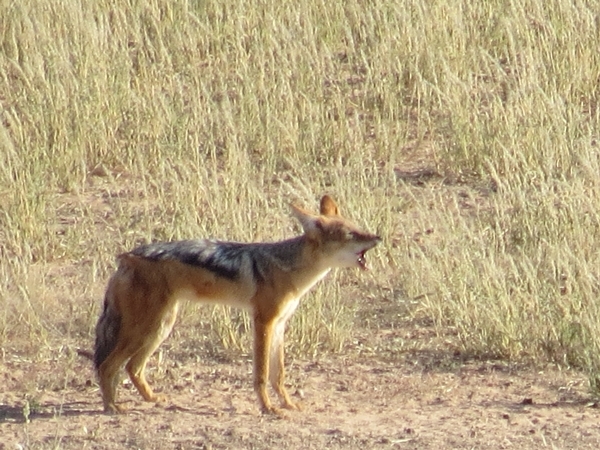 We were woken by three jackal loudly, and exitedly screeching. 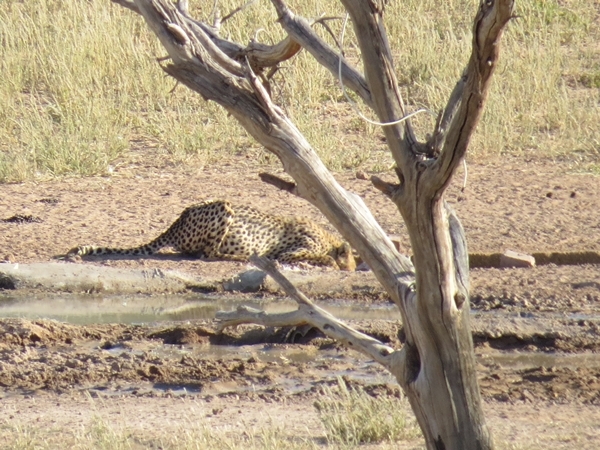 &snbp; The object of their agitation was a cheetah, drinking at the water hole. 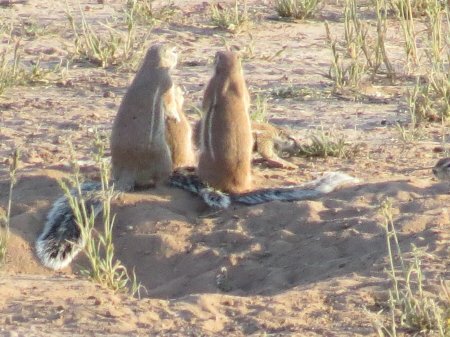 &snbp; We are not sure whether this was a territorial dispute. Probably. 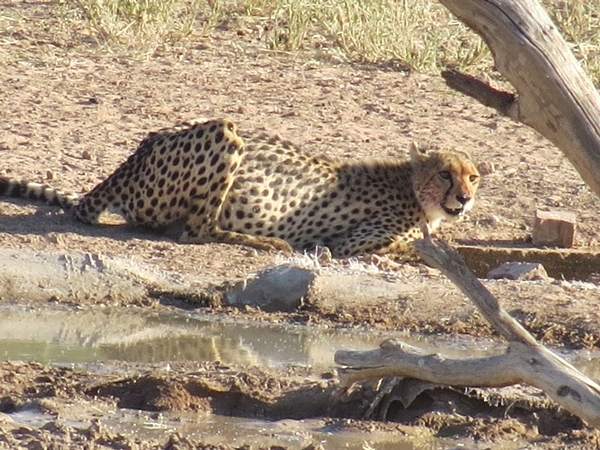 Tiring of the screeching, the cheetah walked off unhurriedly through the grass: After that excitement, the rest of the afternoon drifted by placidly. 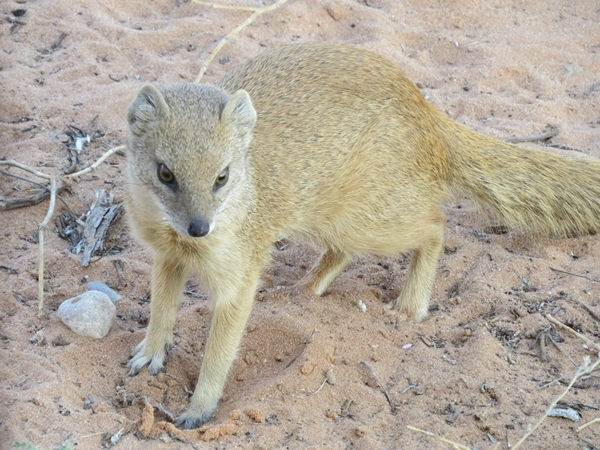 We had a visit by a mongoose and were endlessly amused by the antics of a nearby colony of ground squirrels: A while later a jackal came by, bearing a leg of something in his mouth: To the great consternation of the ground squirrels A fire was made, and we went to bed, contentedly. An hour later a wind came up and turned our cosy tent into a noisy dump. Parts of the tent flapped loudly. Other parts rippled, groaned, creaked and thundered. Sleep was impossible. This lasted for a good 3 hours before the wind abated to a bearable level. 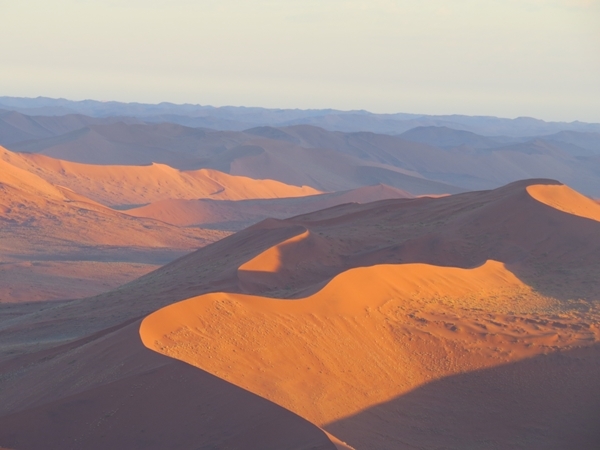 We rose bleary-eyed and immediately decided to skip our second night in the tent and head for Namibia. 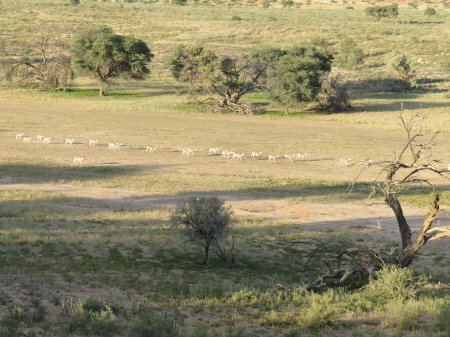 We abandoned the rest of our supplies and exited the Kgalagadi into Namibia, headed for the Anib Lodge near Marienthal. 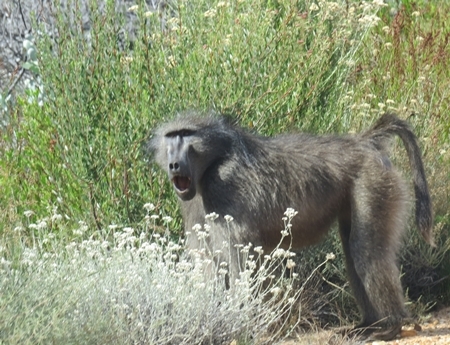 I enjoyed the Kgalagadi immensely. I have said it before, and say it again, that nowhere is completely boring as long as I am with Anna. 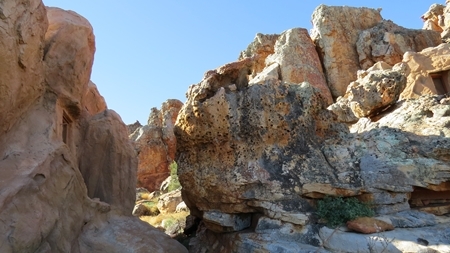 Nevertheless, the place offers a unique peek into life in the Kalahari. Will I want to return? Perhaps, but then to spend time in Kieliekrankie. 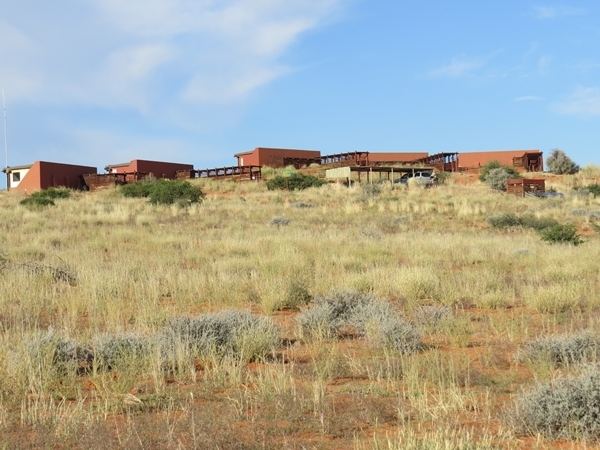 And maybe the Kalahari Tented Camp. If the forecast is for no wind. 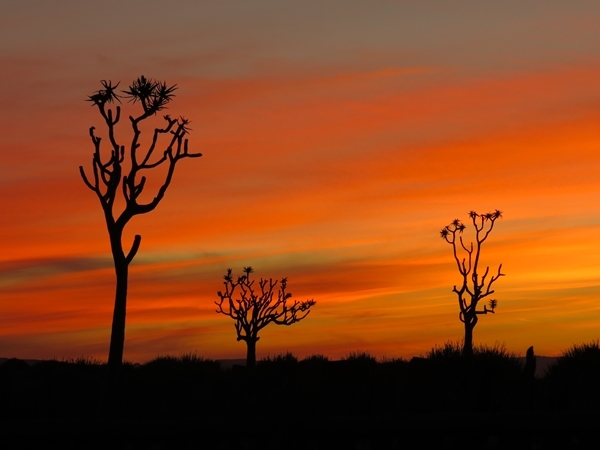 Kgalagadi has always been on my bucket list. 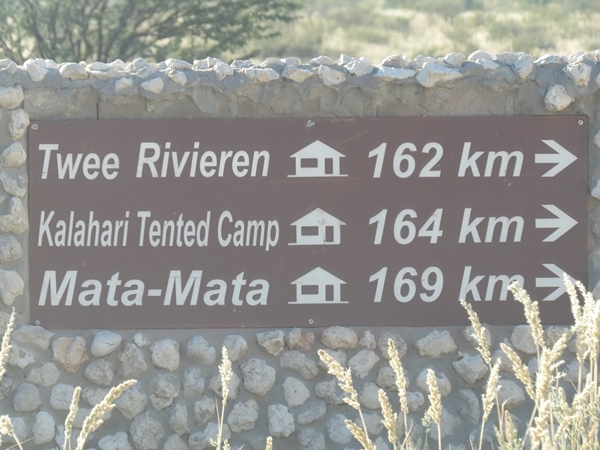 I knew that the Kalahari is a harsh place. 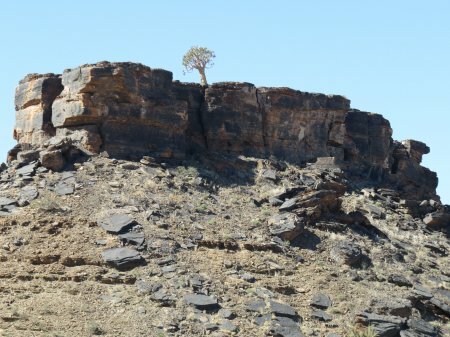 I now have a far greater understanding how close the original human inhabitants must have been to nature. To survive, you have to live with nature. Sure, bits were boring, but there was always something around the next corner to enchant. Will I return? I agree with the Innkeeper. 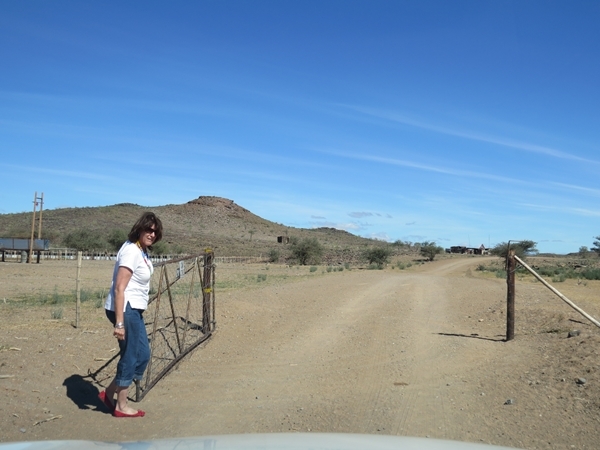 Easy pass through customs at Mata-Mata and into Namibia we went. 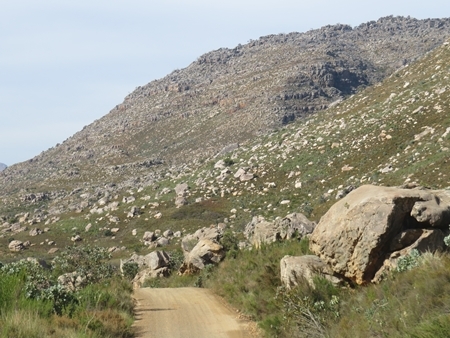 A good gravel road throughout. 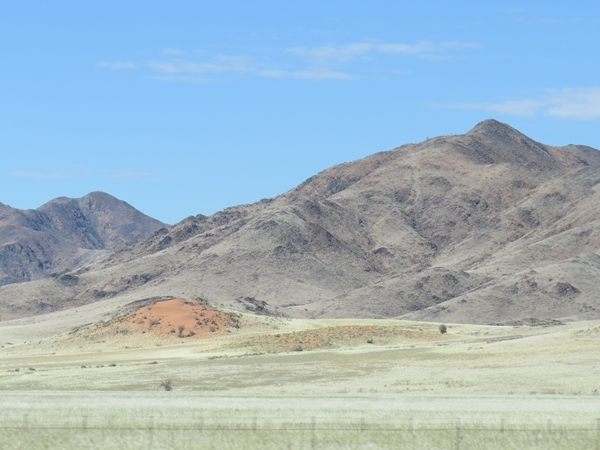 Flat landscapes gave way to more mountainous terrain. Along the road we met Alex Filander ("Met 'n 'F', meneer"), on his way to Marienthal to execute some complex transaction involving his youngest horse. 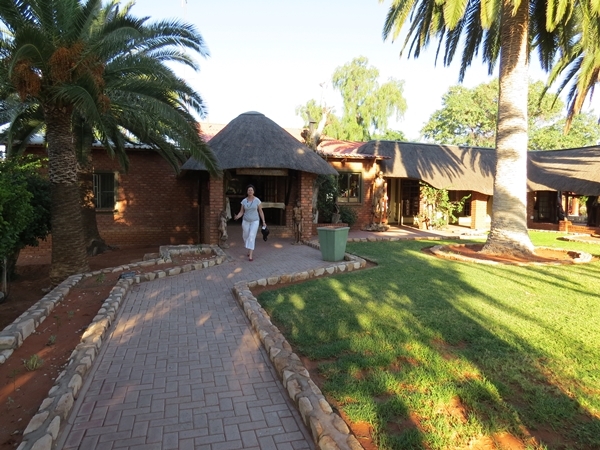 We passed through Auob and Stampriet to the Kalahari Anib Lodge where we were booked for two nights. 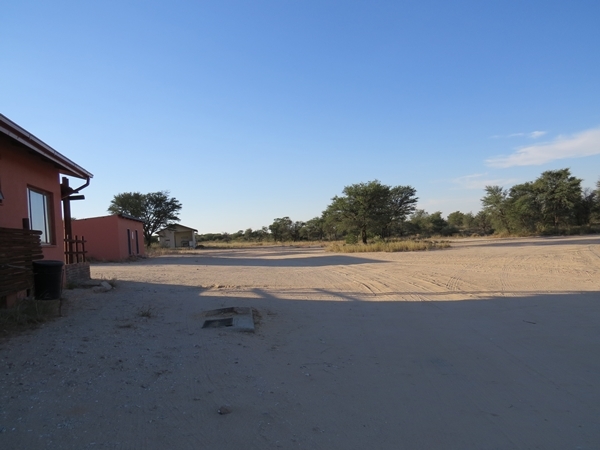 The hotel had a few good points: It had internet access It did laundry It had Windhoek on tap It had cellphone reception The staff were uniformly friendly It had Windhoek on tap For the rest, it was a total disaster, darling. The food! Oh, the food! I did not care to take pics of the lunch offering - fried fish, fried with a flour mixture masquerading as a batter. The end product was a limp affair with no redeeming features whatever. With sheer effrontery they charged us R100 each. We should, of course, have expected the shambles at dinner, but we had no plan B - we were stuck. A chicken salad was offered as a starter. There was chicken in it. Followed 30 minutes later by a vegetable soup. It was warmish. 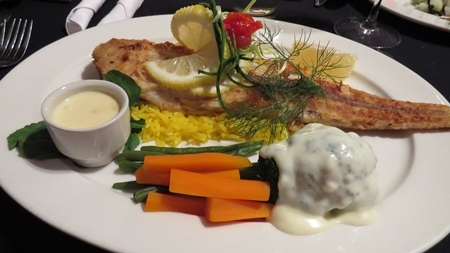 We told them that Anna does not eat red meat, so for mains she got a reprise of the lunch fish. I thought I had done with that terrible thing and hoped never to see something like it again in my life. The same night, and it was back! My tastebuds shut down and went on strike, as did my stomach. 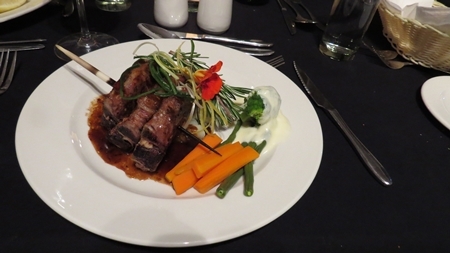 I got droopy veggies and three slices of pretty good Gemsbok fillet. Dessert was a baked thingy with custard. It was burnt. Easily one of the top 10 worst meals ever. 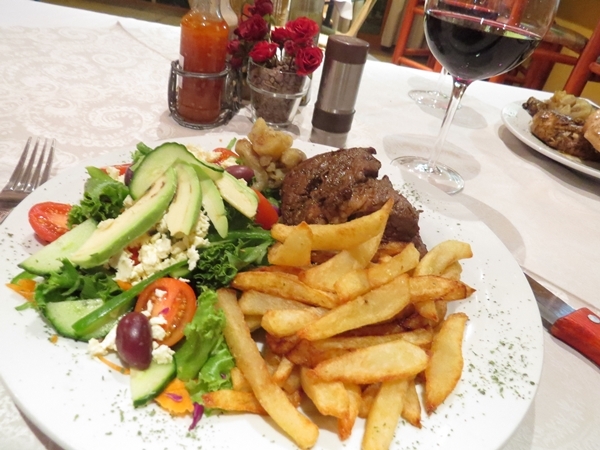 It cost R260 per person. The rooms are small, with no chairs, no fridge, no kettle - in short, nothing that speaks of thinking of guest comfort. The bar area was dirty, the grounds unkept, breakfast the next morning unspeakable. We stayed because they were doing laundry and because the Innkeeper needed time to post our first blog entry. Which he did, fed by large, very cold Windhoek's. Such a pity - a lot of potential. Heaven knows where they got their TripAdvisor rating from... We went to Marienthal, bought stuff at the Spar, and ate in our room. At checkout there was an attempt to bill us for the 2nd evening's dinner as well as a game drive. We sorted that and left. At least Anna shot a good sunset outside our room. 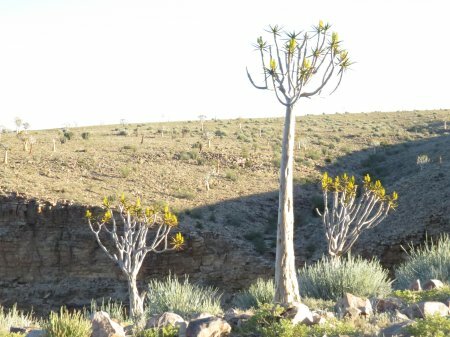 From the lamented Anib Lodge we headed west, destination Marienthal and the via Keetmanshoop on to South Africa. 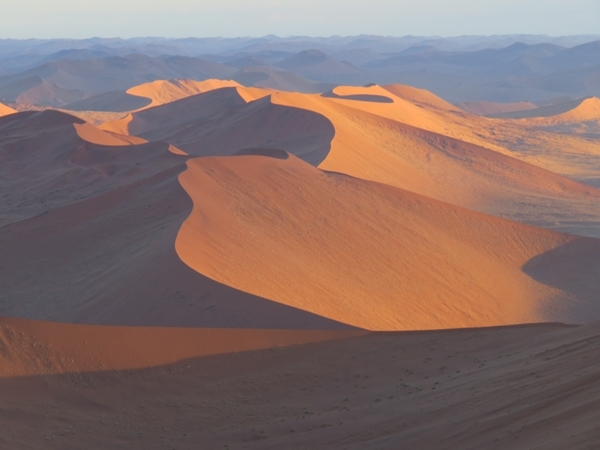 At Marienthal we looked at each other, and decided to head for Sossusvlei instead. 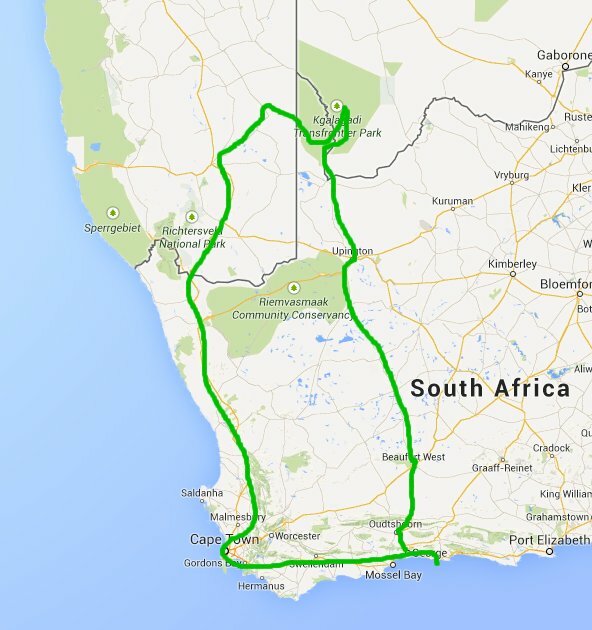 All of 255km. 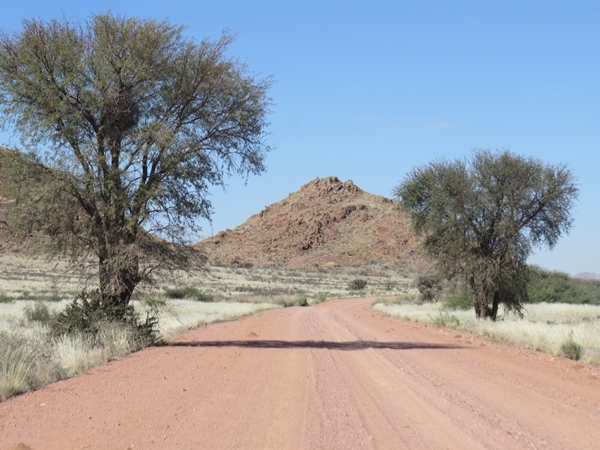 A breeze for people who survived the savage roads of the Kgalagadi. Hah! 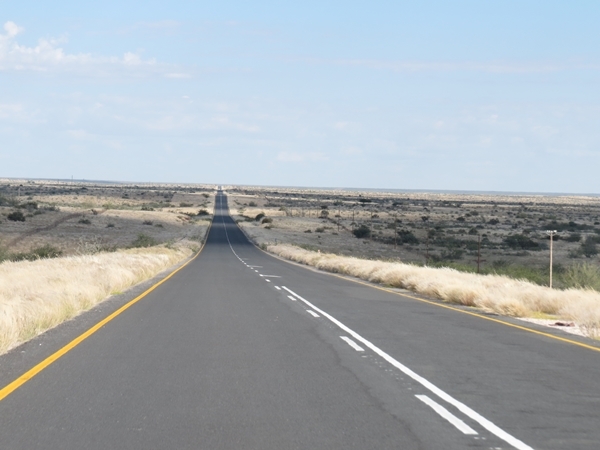 The first part of the road was tarred, but boring. It soon turned into gravel and a mite more interesting. 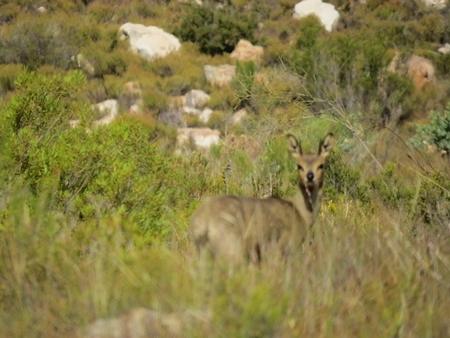 We saw springbok at the roadside and springbok in the road. A man with a horse and filly catered past, the filly stuck to it's mother's side. 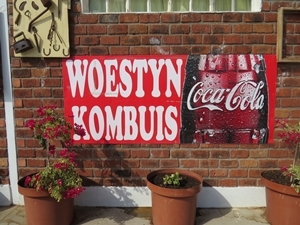 We stopped for lunch at the Woestyn Kombuis in Maltahohe. 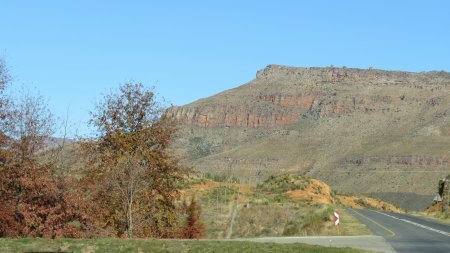 Some 50km after Maltahohe, the road going through a mountain was blocked by a huge lorry that had managed swivel 90 degrees and block the road from side to side. 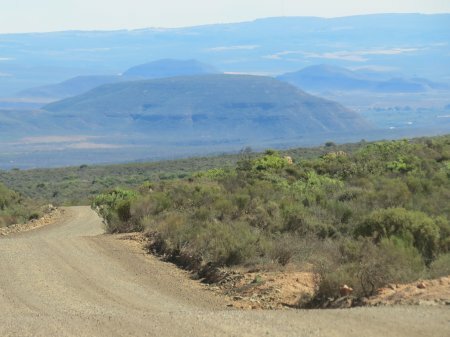 That meant that we had to traverse the 50K back to Maltahohe and embark on a route that turned our original 255Km into 400Km. Oh well.... At least the scenery improved substantially. 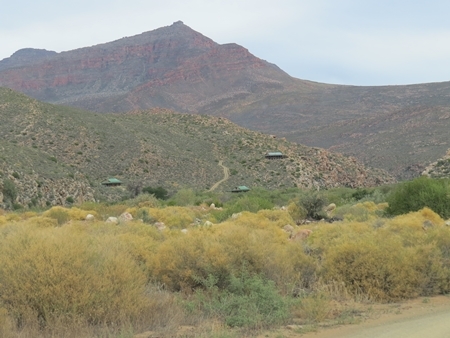 We eventually arrived at the Sussusvlei Lodge where Anna had found us a room.This, we think, will be the modus operandi going forward. Book a room the previous day once we know where we want to go. Any earlier and we may well change our mind about the route and then fret because we are stuck due to a prior booking. E.g. the bloody Anib Lodge. Our accommodation turned out to be in a tent again. A fair wind was blowing and the tent was a'flappin' and a'creakin'. 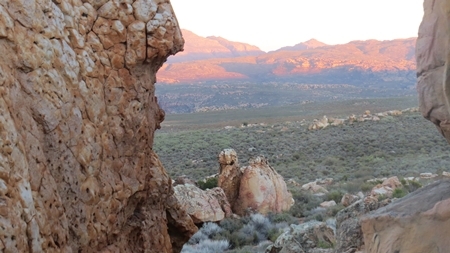 I thought “Here we go again – Kaptein, span die seile”, but fortunately the wind died down as the sun set. 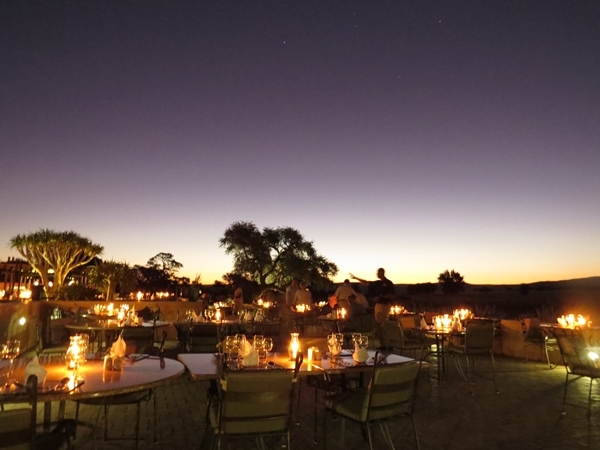 Dining was alfresco, under the stars. It was a buffet, but a pretty decent one. 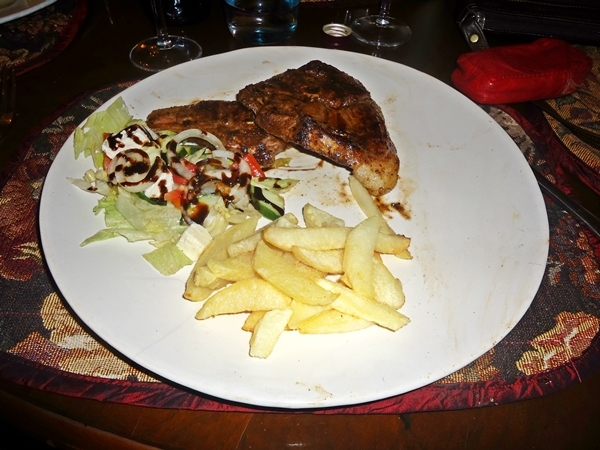 The meat was a variety of game, beef, chicken, pork and lamb, grilled to order. 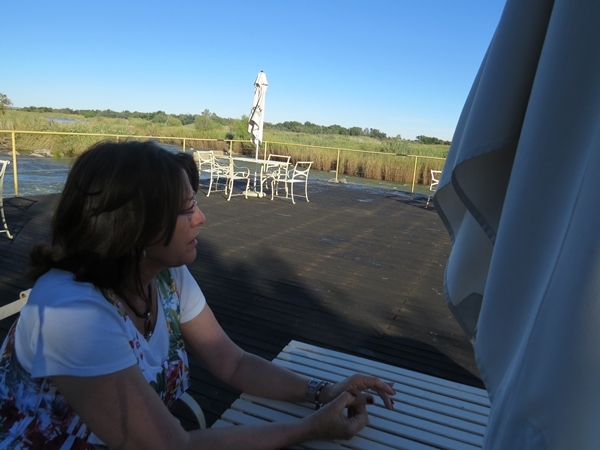 Whilst having a beer, we got talking about the 60km drive in to the Vlei itself. 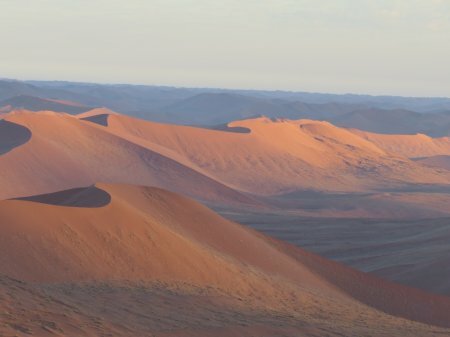 The gate into the protected area opens early, so apparently one then drives the 60km, climb a dune or two and drive back again. 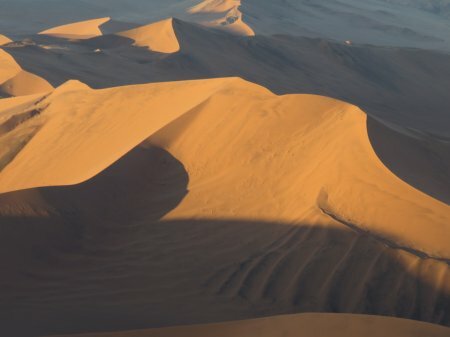 The dune climbing thing did not appeal to the Innkeeper at all, and we decided to rather go by helicopter. Which we promptly booked for 6am the next morning. Off to bed. No tenty noises. We met Franco, the pilot, at 6am. He looked young enough to still feed on mother's milk. Anna felt that his reaction time is probably great. Which did not reassure me at all. I felt my water congeal when I saw the size of the thing. And when I noted that it had no doors at the back where the actual paying passengers, meaning Anna and the Innkeeper, are supposed to sit. The pilot in front, on the other hand, was fully protected by a door. That, to my mind, simply spoke of a totally unacceptable cavalier attitude to passenger safety. This impression was reinforced when he started giving a safety briefing, peppering his speech with phrases such as “If we were to make an emergency landing in the desert, water can be found under the pilot's seat.” This had me petrified. I mean, why do we need to know this? Surely he, the pilot should in such a case still be around to dish out the water? If not, why not? Anna shushed me, drew me aside and told me that the doors had been removed on her request. On her request, I ask you! The woman had clearly lost it since her sky dive. 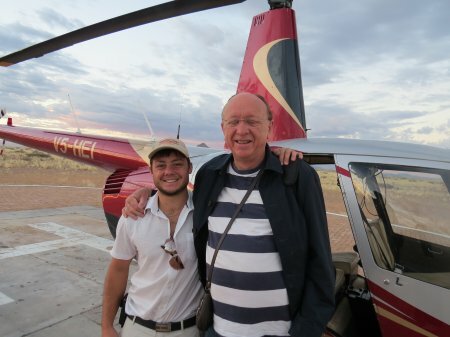 Not one to cause a scene, I closed my eyes and allowed me to be led to the helicoptertjie and strapped in. Next thing we lifted off, I got a prod in the aside and opened my eyes. It was actually not so bad after that. Except when the pilot made steep turns. With a whooping and hollering Anna egging him on. The Innkeeper is, as usual, exaggerating greatly. He knew about the doors when I did the booking the previous day. To improve the taking of pics. In any event, he enjoyed the ride as much as I did. And that is a lot! It was absolutely magnificent. 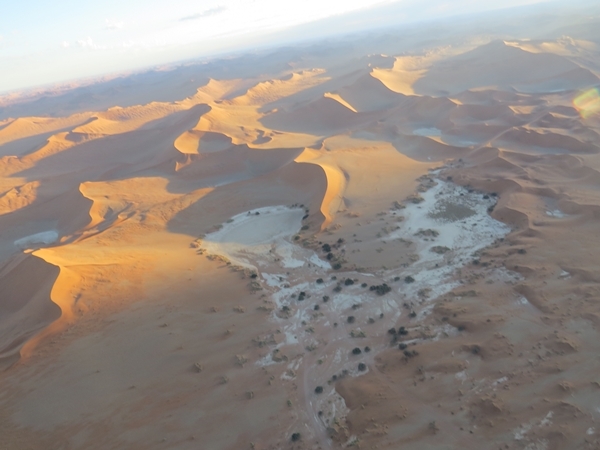 The dunes from the air were spectacular. 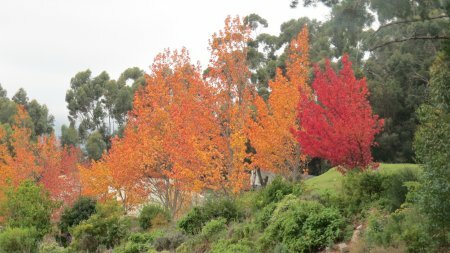 The play of colours and shapes had both of us riveted. 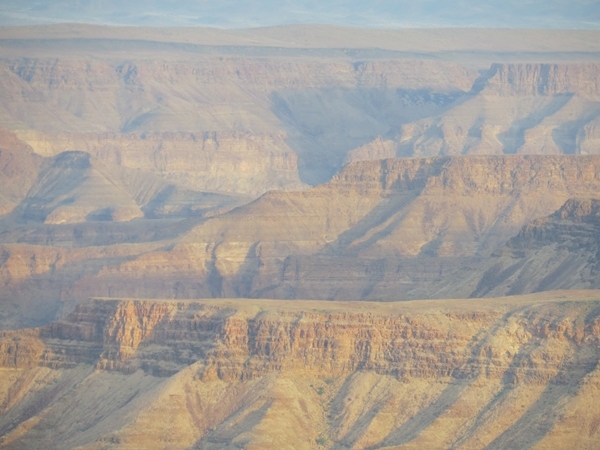 Here is the Sesriem canyon. 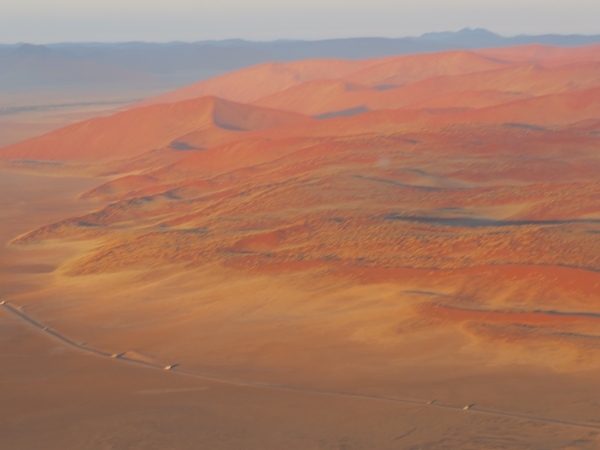 And the 60km road to Sossusvlei itself And a few dune scenes on the way to the Vlei. 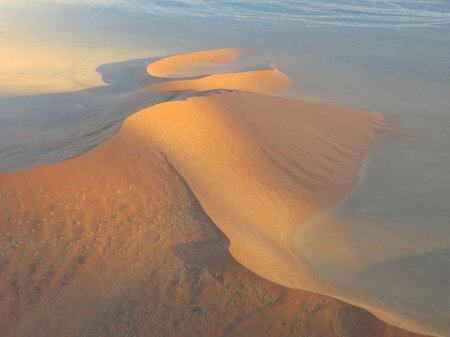 At the Vlei Dune 45, famous for its two craters. It had to end. I wish that I could convey a tenth of the experience to you, but for us it was a real high. 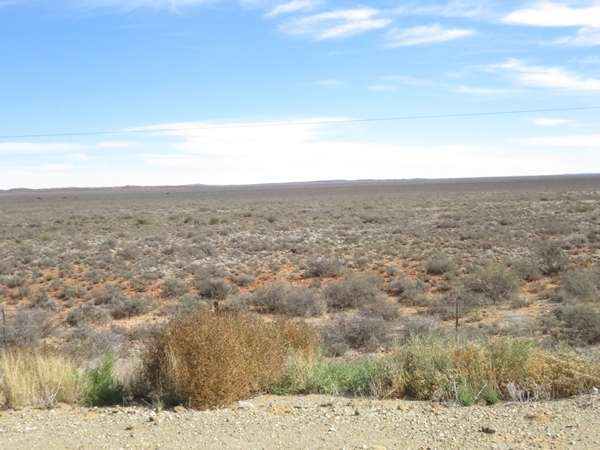 We had a quick breakfast back at the hotel – very bad and forgettable breakfast buffet - and set off for Luderitz. 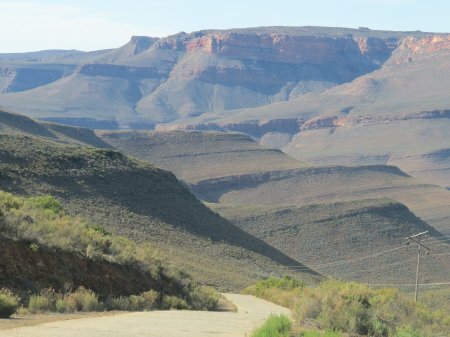 For no real reason, other that that it was more or less on the way to the Fish River Canyon, which we wanted to see. 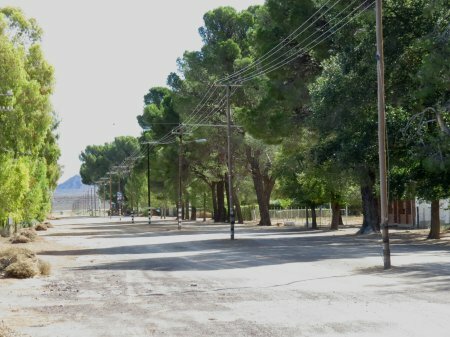 A 200km detour, a mere bagatelle. 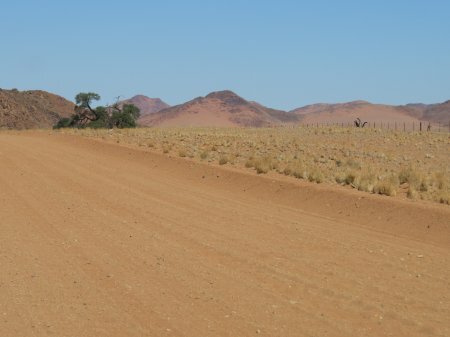 The route we took would set a new record – the town of Aus would be the next actual settlement after leaving Sossusvlei. 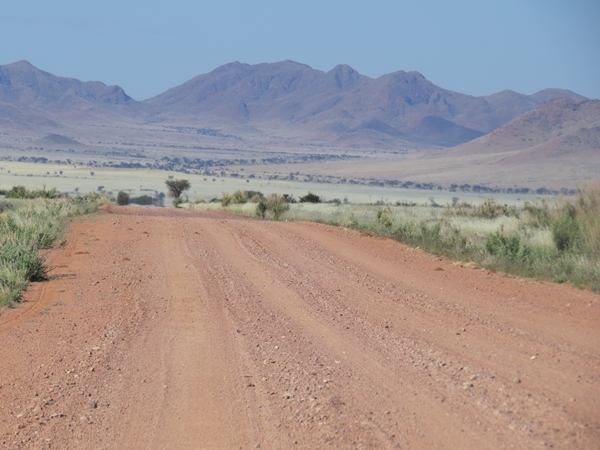 Aus is 360km from Sossusvlei – this 360km of gravel road with nothing along the way. 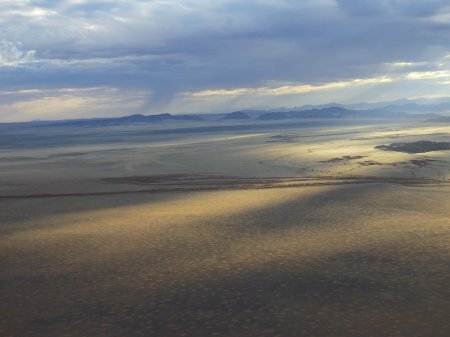 And this after flittering about in a leetle helicopter! Egad! What is happening to me? The road trip was splendid, nay, magnificent. It led through scenery the like of which we had not experienced before. 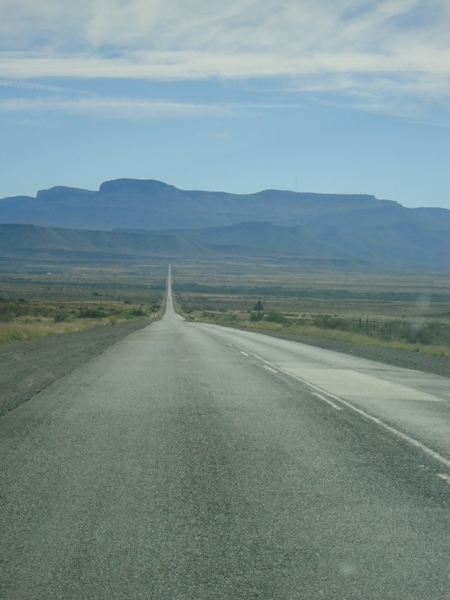 The road sped by. Here is just a small sample of what we saw to make for a simply perfect day. 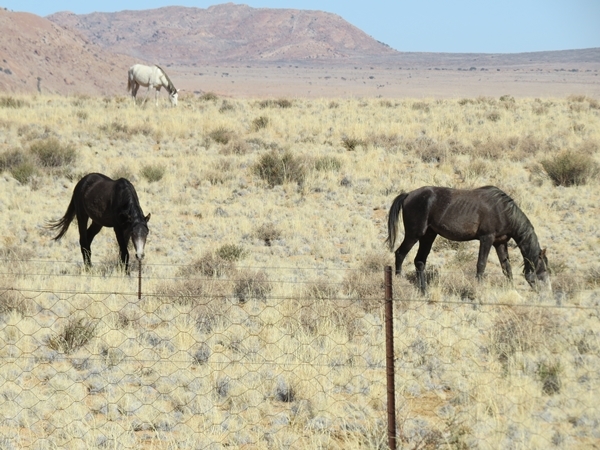 We even saw a few of the famous Namib wild horses. 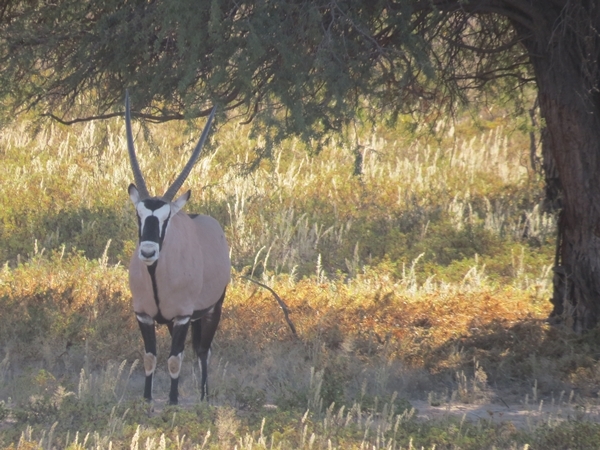 And a one horned Oryx. 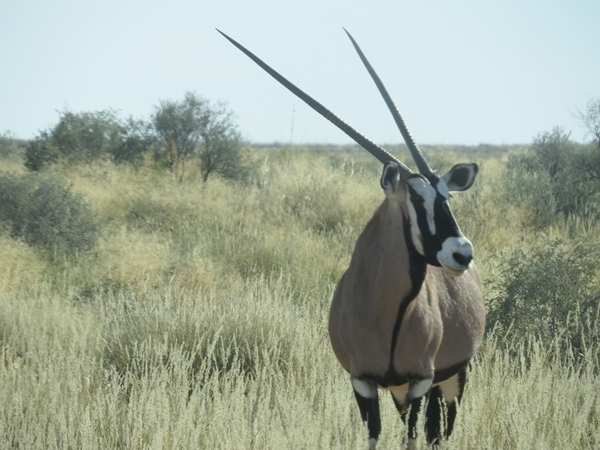 Which is what we old Namibia hand call a Gemsbok. 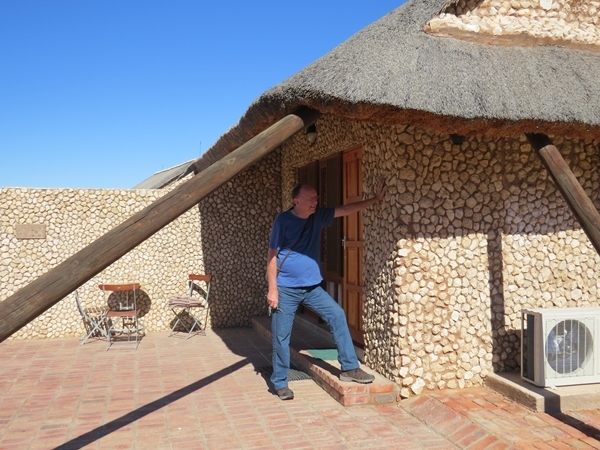 We arrived in Luderitz around 4pm and found lodging at the Luderitz Nest Hotel. We'll report on it tomorrow. 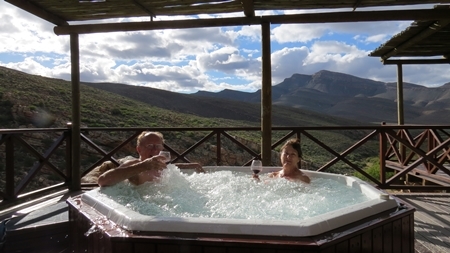 We have booked one night at the Fish River Lodge, maybe to stay for 2 nights, so thence we shall go in the morn. 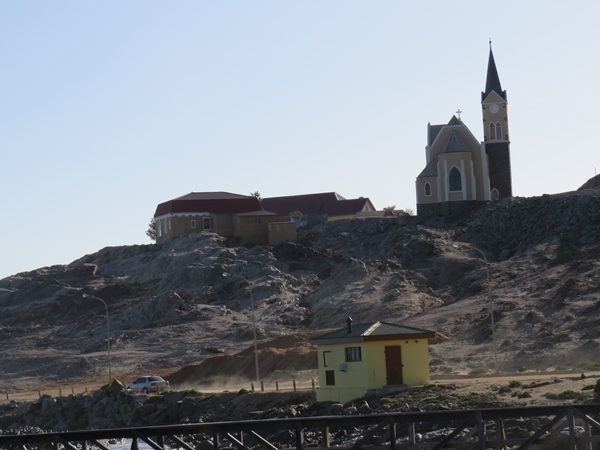 We arrived in Luderitz early afternoon. 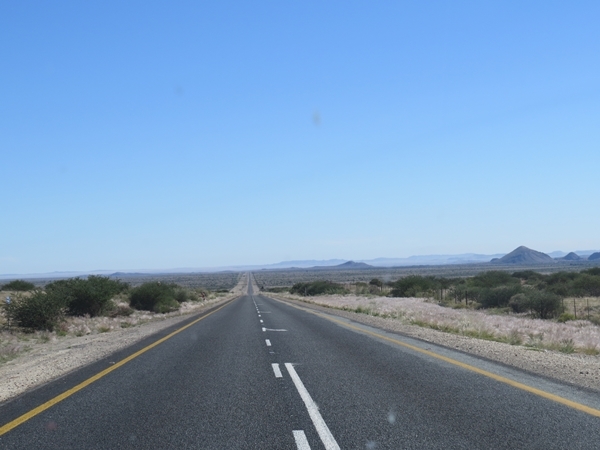 Distances in Namibia are such that it was either Aus or Luderitz 100km further. 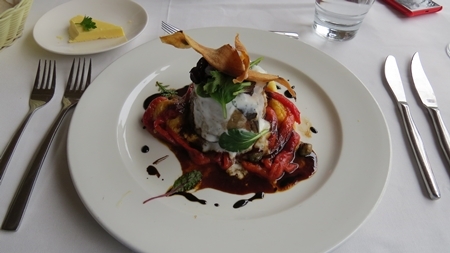 We stopped at the Bahnhof Hotel in Aus for lunch, with the idea that, should lunch be great, we may well stay there. It was not so we did not. 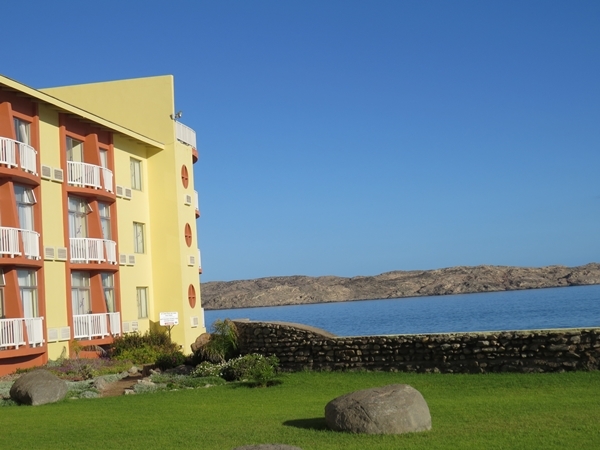 The Nest Hotel in Luderitz provided us with a room right on the harbour. 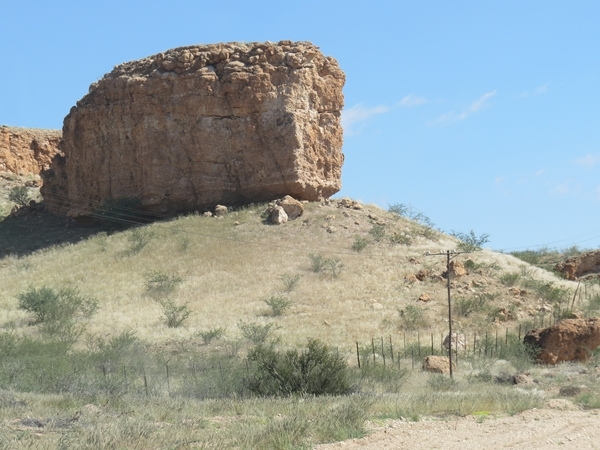 We remembered Luderitz from previous visits and thus did not do much exploring. Anna wandered around a bit. Not much to see- The church seems to be the highest point in town. 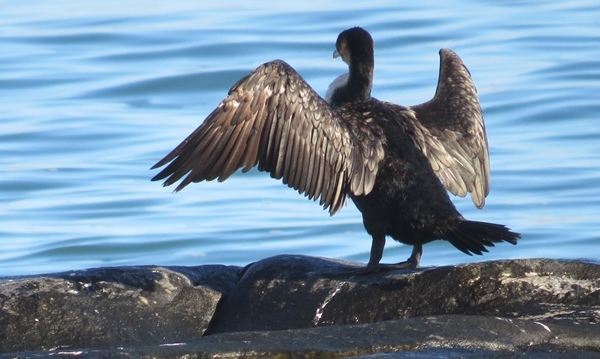 I caught a cormorant stretching its wings We had a very good dinner and found lodging for the next night at the Fish River Lodge located on the western rim of the canyon. 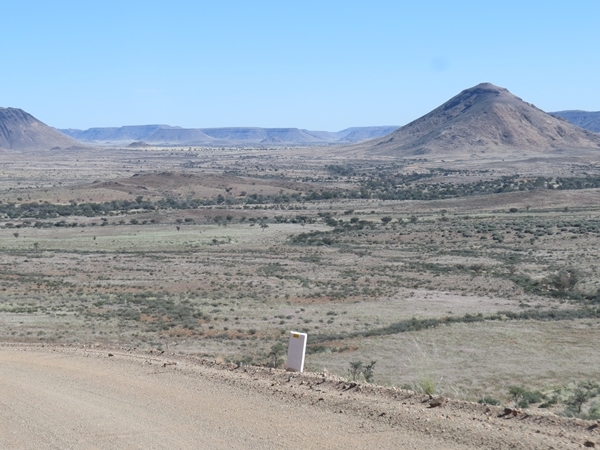 The next morning we traversed the 120km back to Aus. 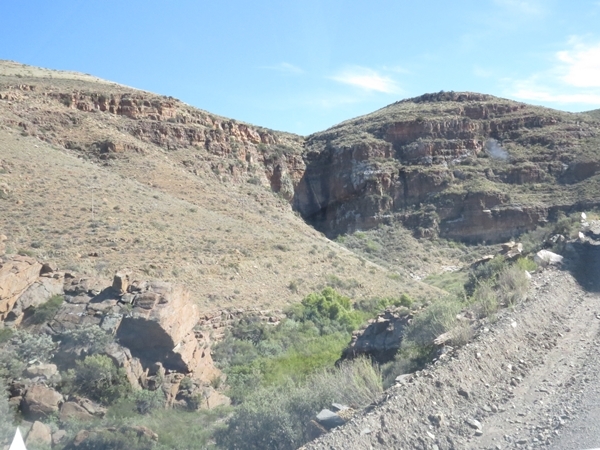 The scenery along the road was very bleh! Or maybe we were just jaded after the previous day. 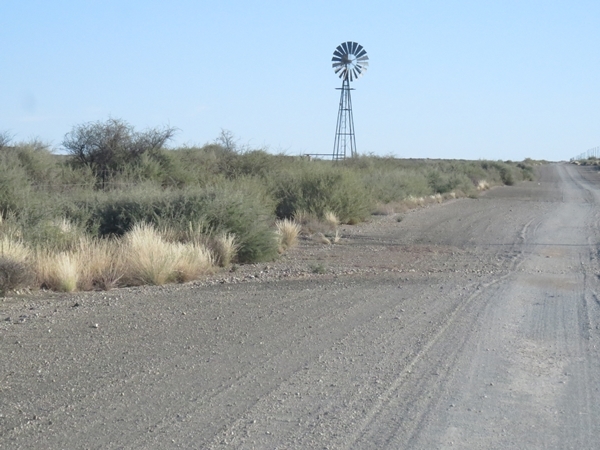 We had another 100km of tar, and then 70 odd on gravel before the turnoff to the lodge. Nothing of note to report. Except for hill with a nice shape to it. We reached the turnoff without incident or excitement. Anna did have to open a gate or two. 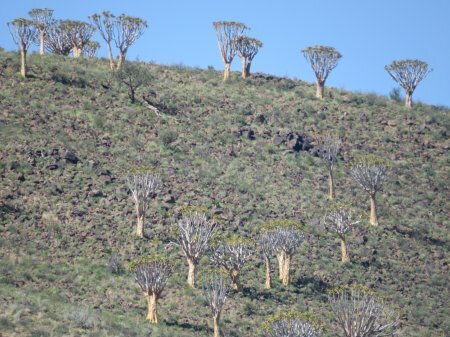 Quiver trees made their appearance. 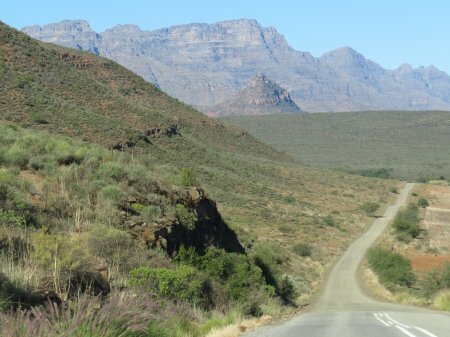 We then had to endure 19km of the worst road we have ever driven. Not a road, actually, more of a trail. 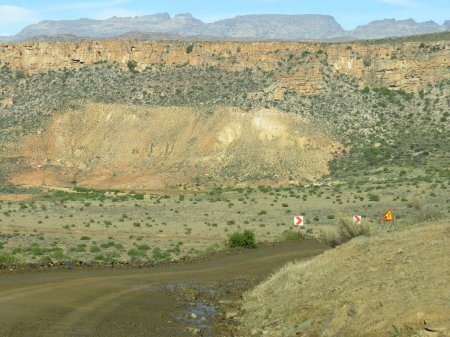 Rutted, eroded and very, very bad. We almost turned around. Not that that would not have been a feat in itself. 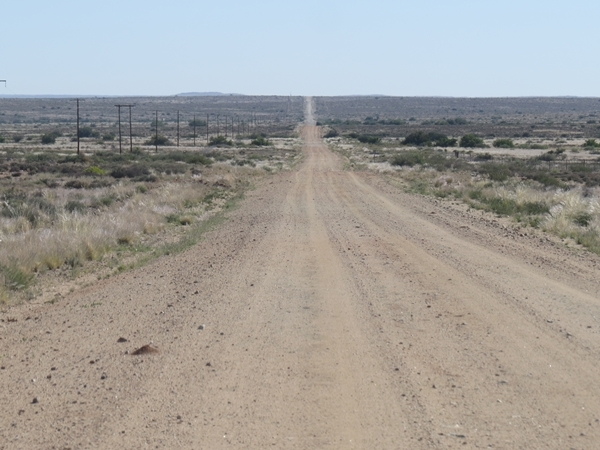 The only thing that kept us going was the knowledge that we would probably have to travel another 200km to reach an acceptable alter native to what lay at the end of this hellish stretch. The Innkeeper was seriously moerig. I was scared. 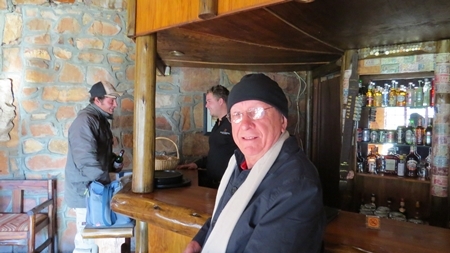 It took an hour, but eventually we arrived at the Fish River Lodge, grim-faced and ready to do battle. The very friendly staff completely disarmed us. 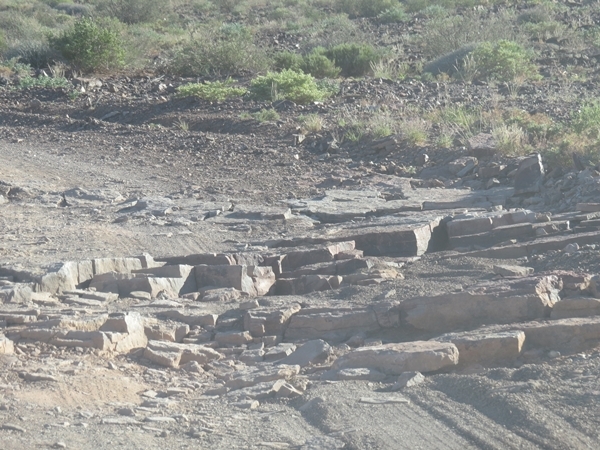 Apparently the trail to the lodge will soon, now that the rainy season is past, get repaired. Ready for the next rainy season to bugger it all up again, I suppose. 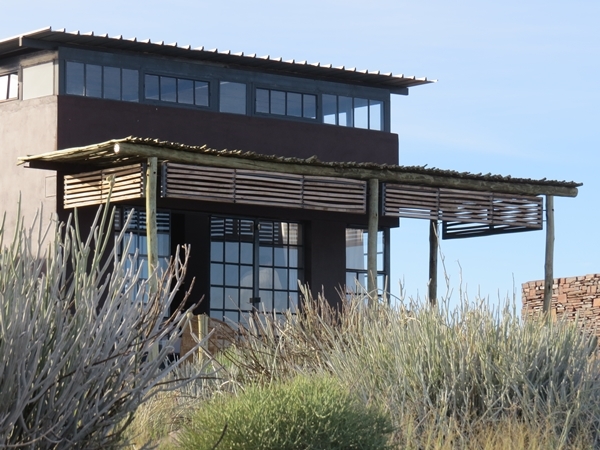 The main building of the lodge. 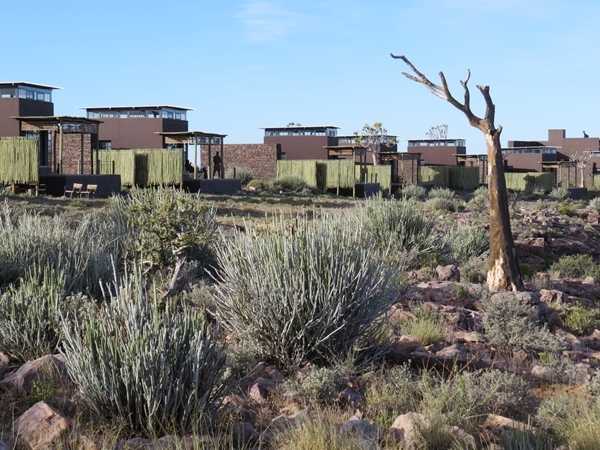 The accommodation is in a row of huts strung out on the edge of the canyon. 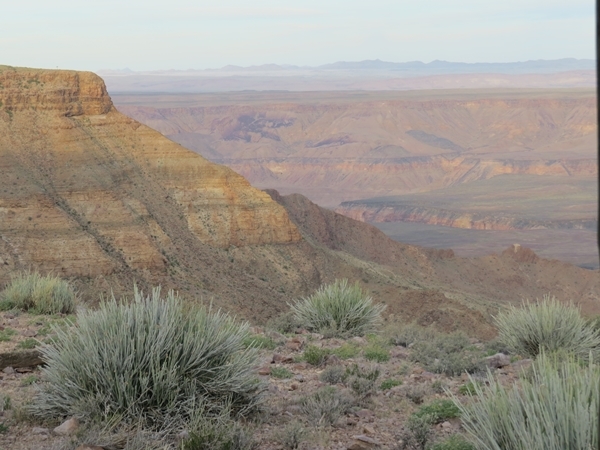 Our hut: The huts overlook the canyon – and this is what in the end made the horrible trail worth while. The Innkeeper settled down to read the guest brochure. Always a sensible thing to do, lest you miss important stuff. Such as when dinner starts. Or what to do in case of snakebite. For the latter we are well armed. Grappa and cognac to hand. I encountered a strange note, to the effect that free earplugs are available at reception if the wind bothers you. Wind? What wind. Oh well.... Anna wandered around, taking pics. 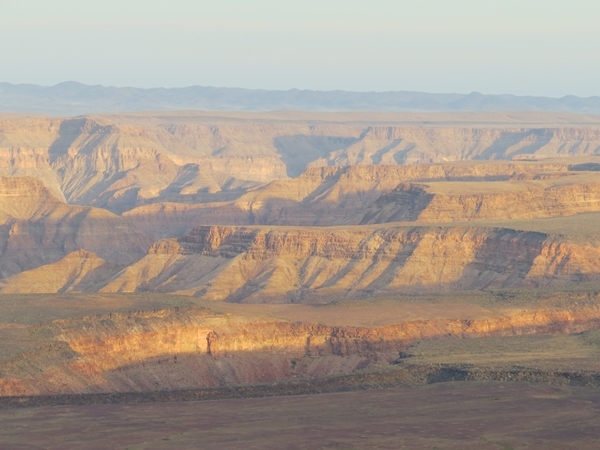 Fascinating place, the canyon. One afternoon nap later, we were ready for dinner. 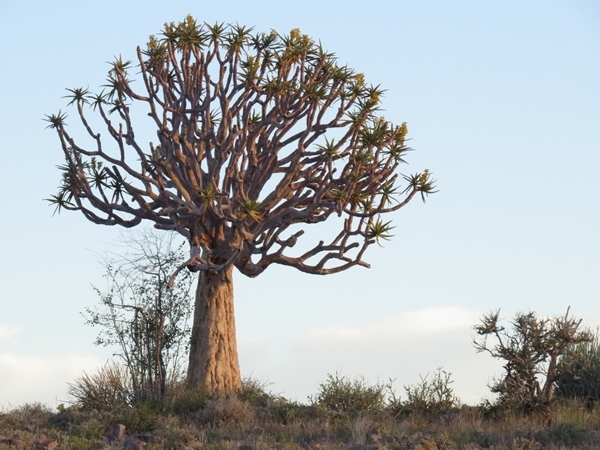 As we strolled along the path, the sun was setting, setting off the quiver trees. 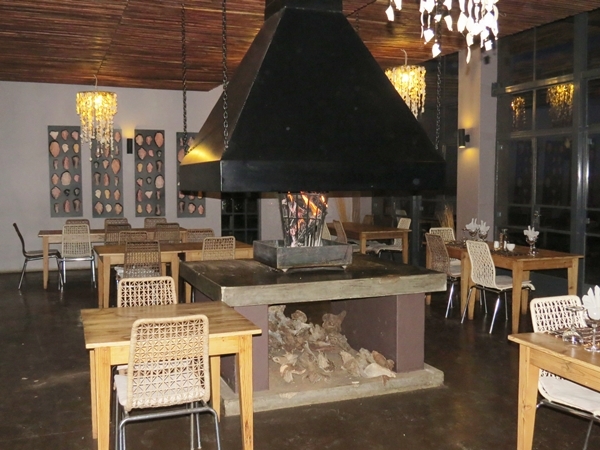 The main building, a rather cheerless affair by day, was transformed into a cosy dining place with two fireplaces warding off the autumn chill. The staff was friendly, the service great. One guy had three kids hanging over the bar counter, listening to a story. Dinner was a three course affair – a pretty good pea soup followed by excellent pork cutlets with veg. Dessert was a good malva pud with custard. We went contentedly to bed. At about 11pm the wind started howling. I mean howling like a demented banshee. This was almost spooky. 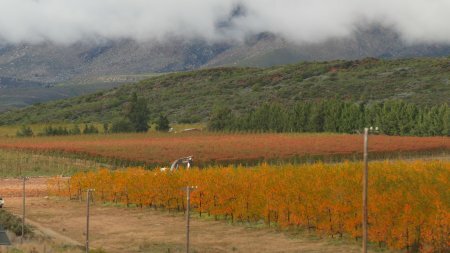 If you stand on the stoep, you feel a strong breeze. At roof level, about 3m, it is a full strength gale. Something to do with air currents in the canyon, I guess. I never travel without earplugs, so, being prepared, I was ok. The wind died down completely at around 3am. 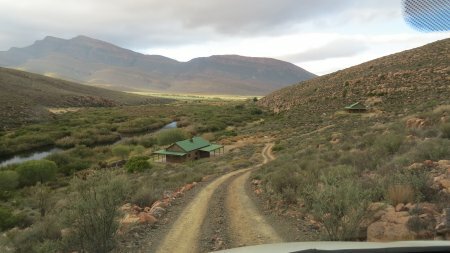 We stayed another day at the lodge, mainly so that I could recover from the effort that it took to drive long stretches on gravel. 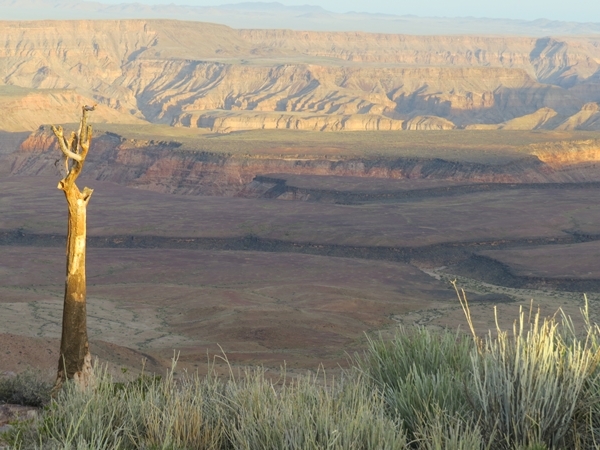 We had an ok breakfast, lounged around and looked at the canyon. 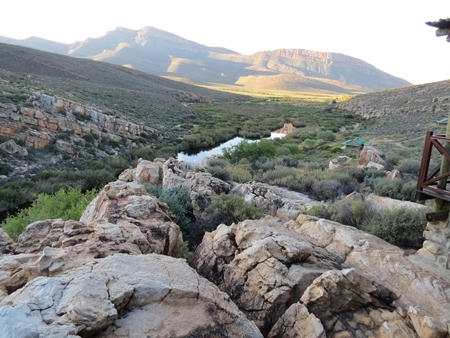 Another decent dinner later, we went to bed, endured the wind thing again, and prepared to tackle the demon trail to return to S.A. We fortified ourselves with a hearty, if not necessarily good, breakfast in order to tackle the rigours of the 19km trail from the lodge. We set off. Anna was immediately in stress, talking under her breath (prayers?) and saying through clenched teeth “Not so fast, GG, not so fast!”. I was working on the principle that, if you achieve a critical speed, just this side of airplane take-off speed, the car would plane over the irregularities in the road. O, bosh! I was quite calm, taking pics. It was he who was stressed – he was whistling all the time, a sure sign. 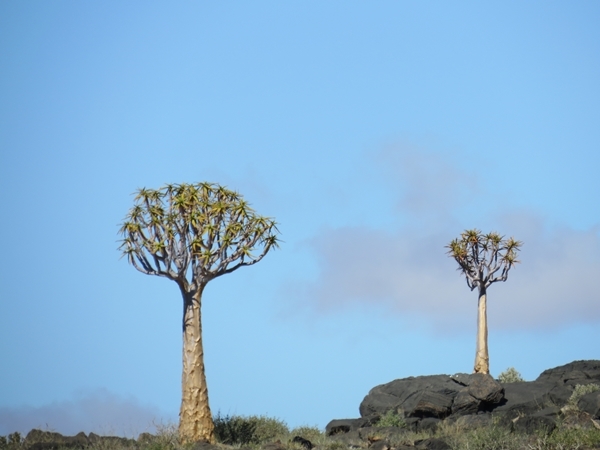 I was fascinated by the quiver trees. 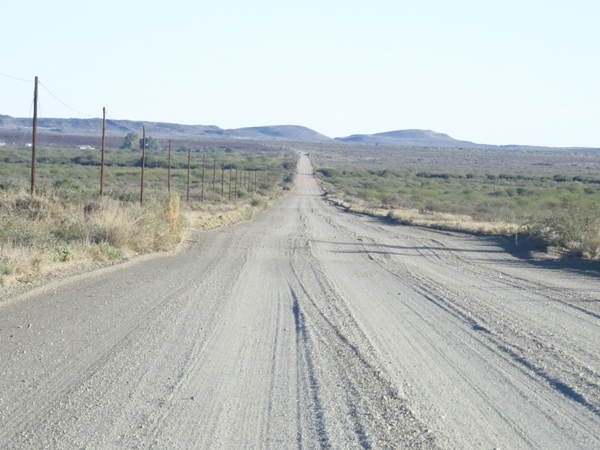 The road leading to the Luderitz – Keetmanshoop tarred road was good gravel with here and there something to see. 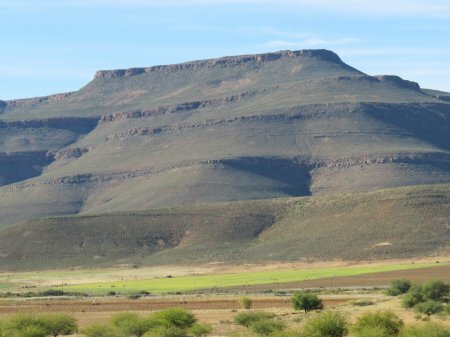 Our plan was to drive to Keetmanshoop and thence down to Springbok- a long 8 hour drive, leaving us around 400km to get to Clanwilliam at the top of the Cederberg the next day. 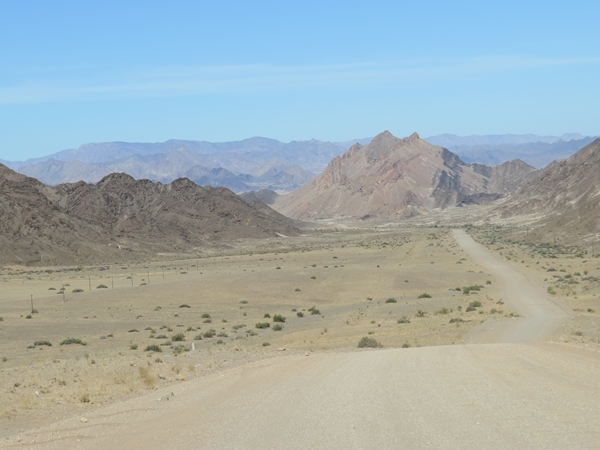 When we got to the tarred road, we changed plan and decided to go via the Richtersveld instead. 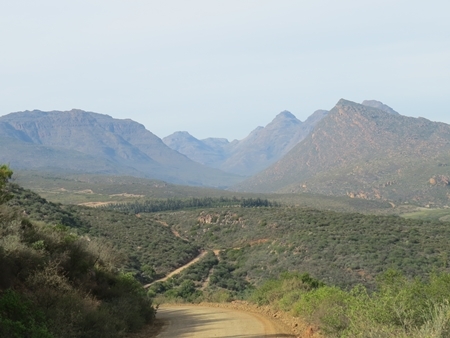 A bit of a detour, but at least the more scenic road. This proved to be correct, but, with a lot of the trip on gravel, would in the end be a 10 hour trip. It was a great decision. 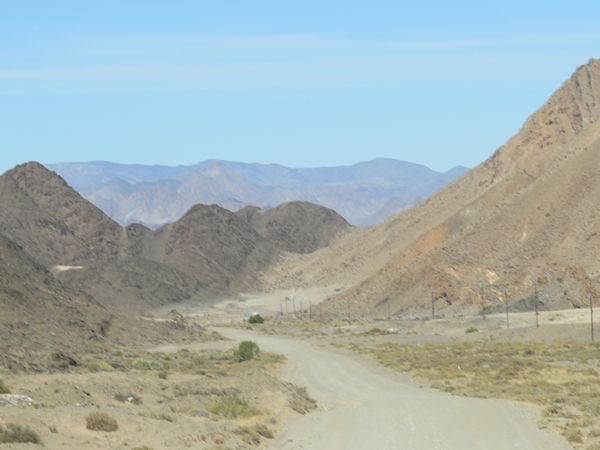 The Richtersveld was stunning For part of the road it wanders beside the mighty Orange river. 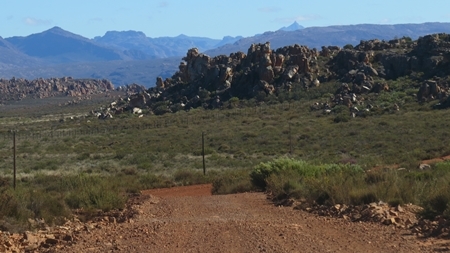 There are extensive vineyards just outside the Richtersveld Park border. 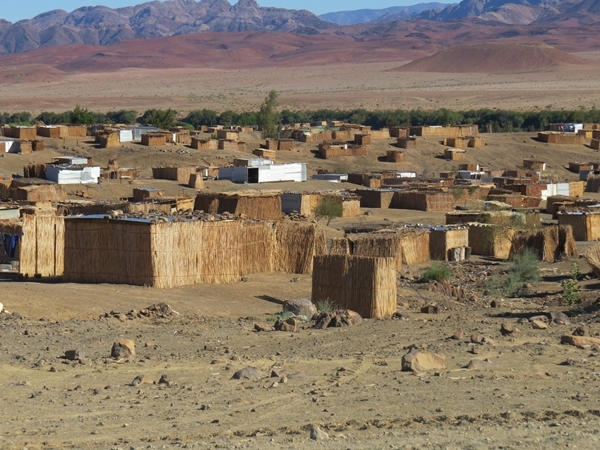 Here we saw the most peculiar squatter camp built from straw. 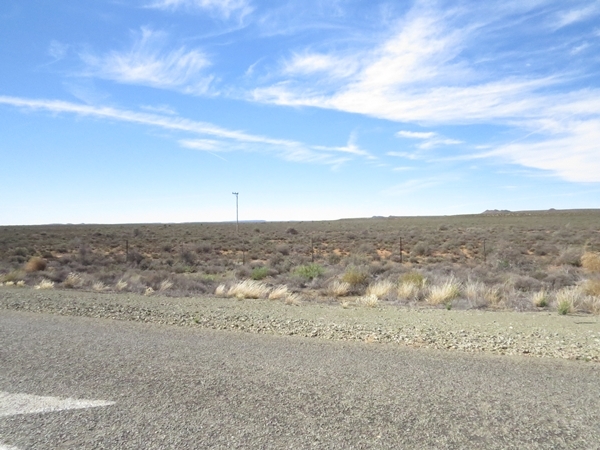 Eventually, quite done in, we reached Springbok. Anna had found us accommodation just outside town. We ate and slept. 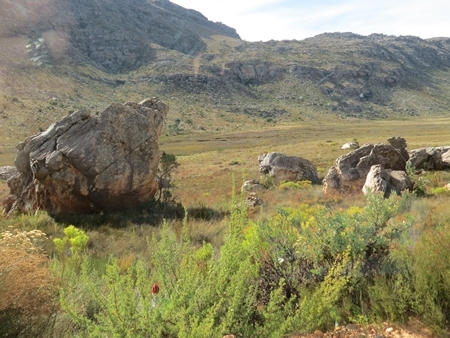 The next morning we set off for Clanwilliam, the first stop on our trip through the Cederberg. 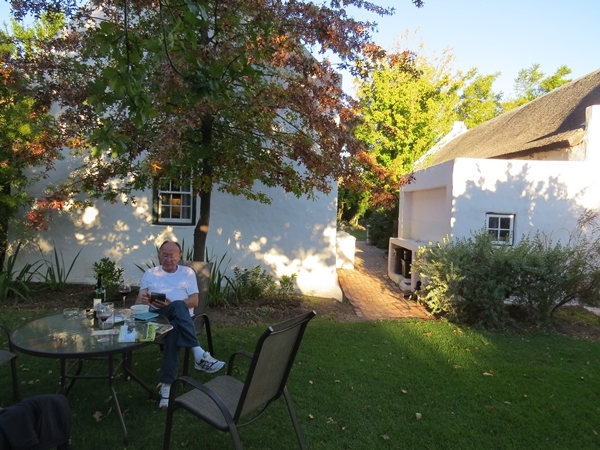 Anna found us a cottage at Klein Boschkloof just outside town. The approach was promising. 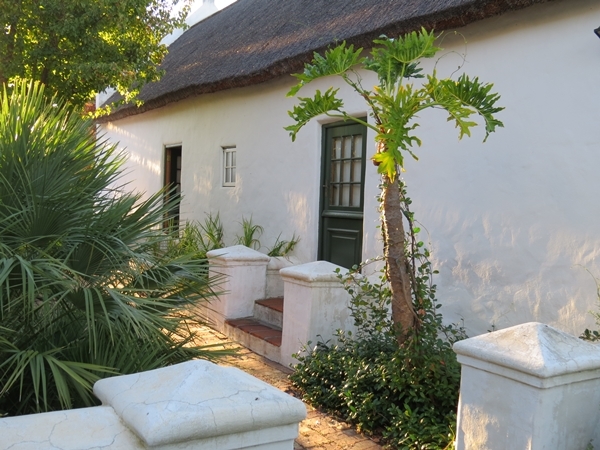 A charming if slightly unkempt cottage under thatch. We decided to stay for 2 nights. The plan was to head for Wupperthal in the morning. 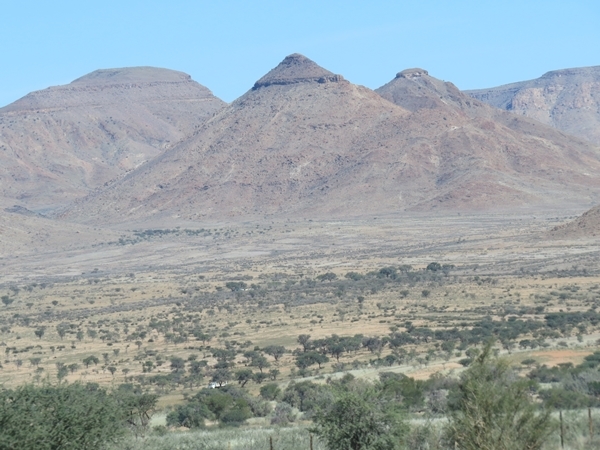 This would, we reasoned, give us an idea of the Ceder mountains. 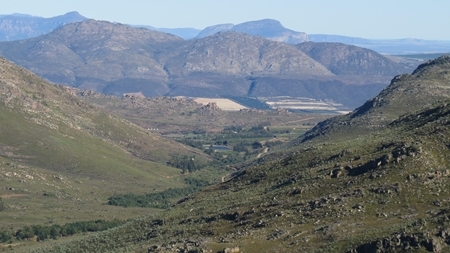 Wupperthal was found by Leipoldt, C. Louis' grandfather and is of some historic interest. In any event, there should be lots of rocks and mountains to satisfy Anna. 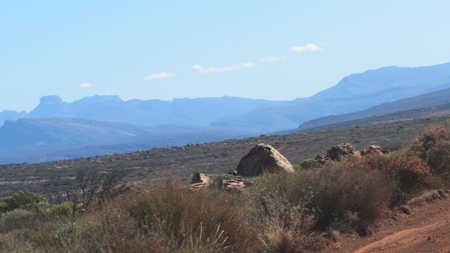 Indeed, rocks and mountains. I was stunned. 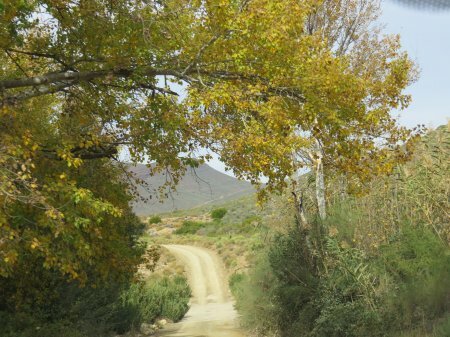 The road led through the Bidouw valley (where the Louws have been farming for 7 generations) and along the most atrocious gravel road to Wupperthal. Only the church seemed to be kept in good nick. For the rest it is of a rather dismal aspect. We left. 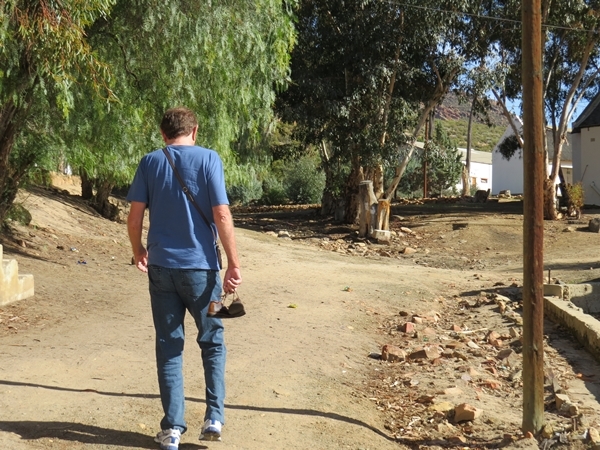 We had to return by the same road, Wupperthal being a cul de sac. Unless you have a 4x4. Which we don't. So we left. Oh, I've said that already, haven't I. 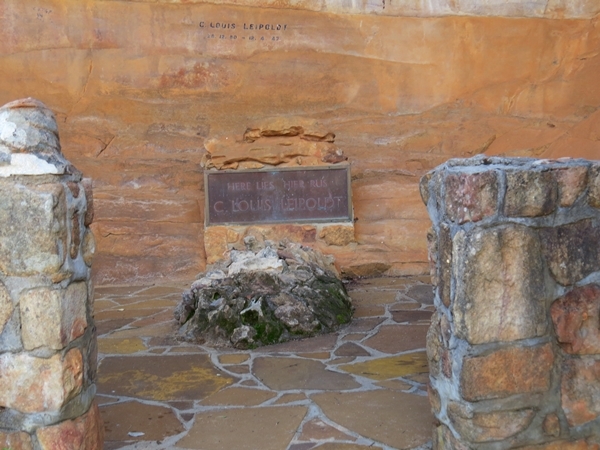 On the way back we stopped at C. Louis Leipoldt's grave. Anna took a pic. I took a wee. Not at the actual grave, but in the broad vicinity. No disrespect intended, Louis. 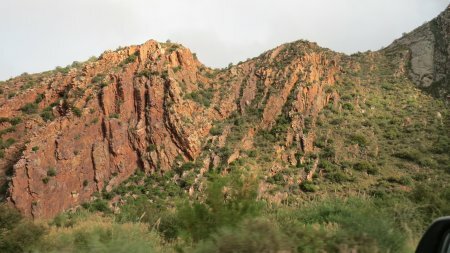 More mountains and rocks on the way back. Rock heaven for me. 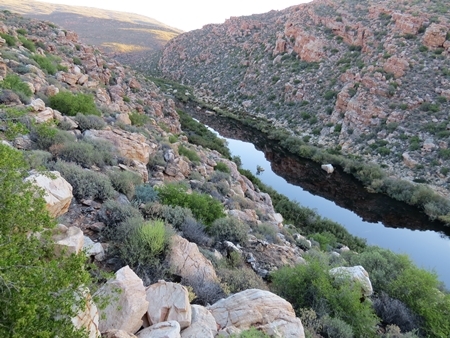 Over lunch in Clanwilliam we planned for the next few days. 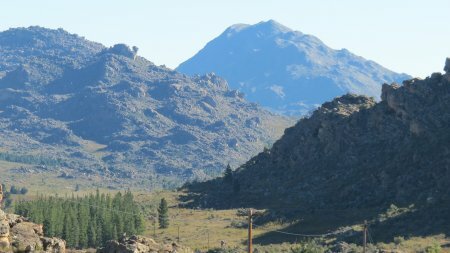 It was clear that, with no cellphone reception in the mountains, we would have to book ahead at least for the next 3 or 4 days. 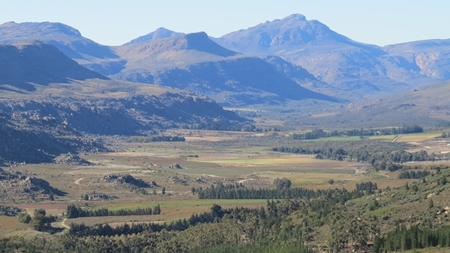 We consulted Anna's research notes and booked 3 nights at Mount Ceder. 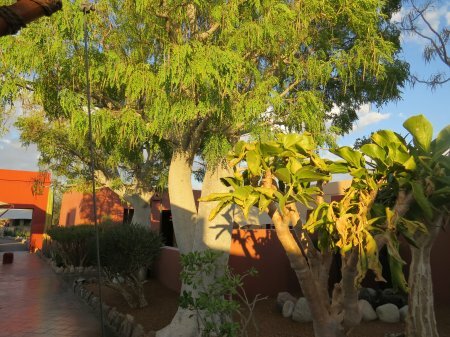 We initially intended to stay for only 2 nights, but found that, as pensioners (Hah!) we could get a 3-for-2 deal. 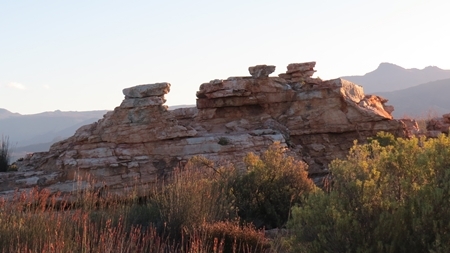 Saturday night at Kagga Kamma with the option to stay for Sunday as well if we like it. If we can find a PC with internet access, we'll blog. If not, we won't. 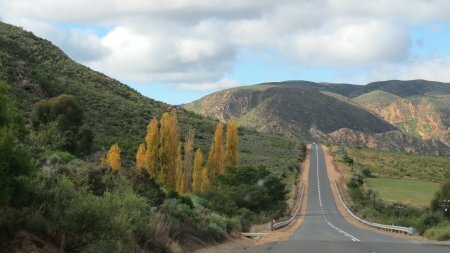 To reach our home for the next 3 nights, we had a leisurely 80km drive into the mountains ahead of us, albeit along a gravel road. 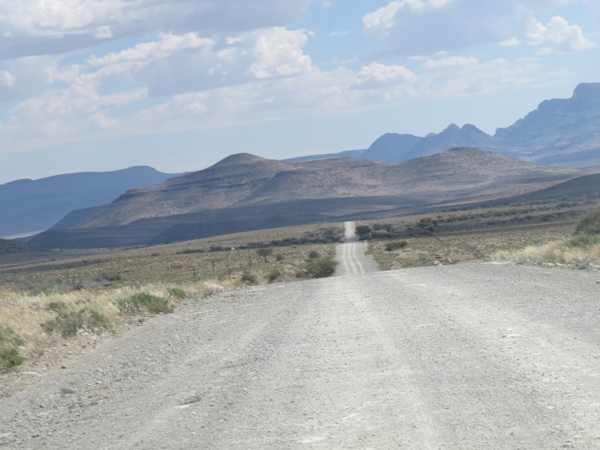 By this time, as you may have noticed, we considered ourselves gravel road veterans. 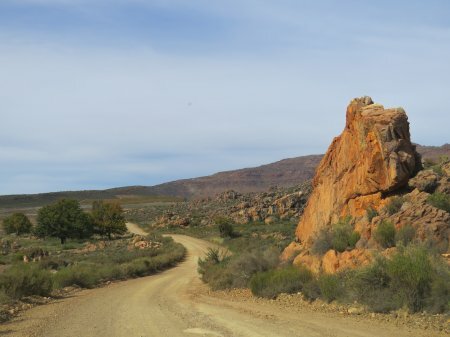 In fact, given the dusty and muddy state of our car (the mud due to a strectch the previous day where roadworks apparently required the road to be copiously watered), we were stopped several times in Clanwilliam by people respectfully requesting our advice on gravel road driving. Never one to to refuse help, I would stroke thoughtfully over my beard and dispense wisdom which they would feverishly jot down. Ok, ok: stroke thoughtfully in the place where a beard would be. If I had one. Which I don't. 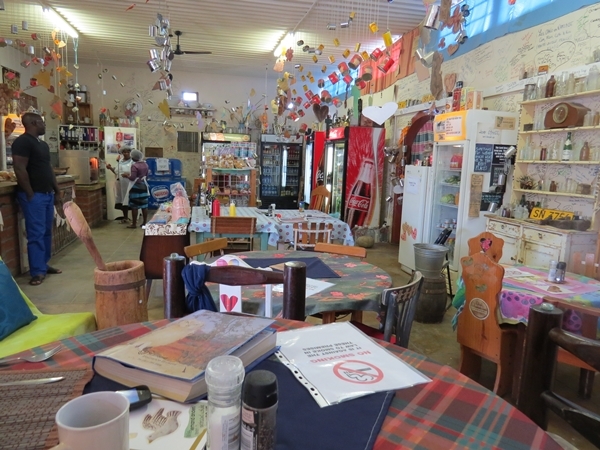 We had breakfast at Frans' farm stall in Clanwilliam, giving me the opportunity to fix an aspect ratio problem with the pics in previous blogs. I did not have time to scrutinize each one, but they should at least now bear some resemblance to normality. 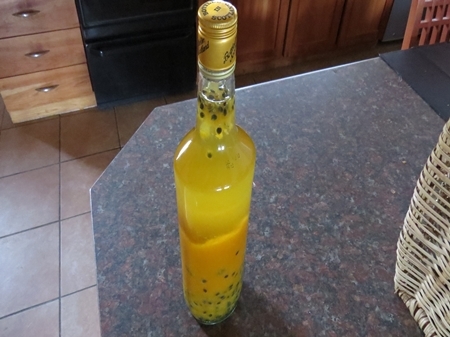 Frans sold me a bottle of grenadilla liqueur made by his brother, appropriately named “Pittekou”. The liqueur, not the brother. (“Pittekou” = “Chew the pips”) Thus armed we went into the mountains. Not quite, my dear. We visited a supermarket and bought things that we would need more than that silly bottle of Pittekou. Like food. 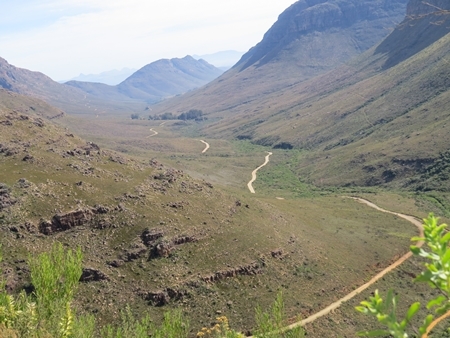 Then, after buying the important things, we went into the mountains. 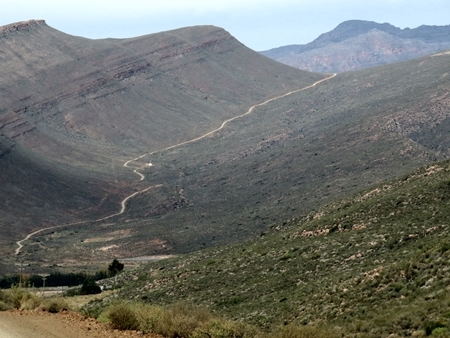 The gravel road, not unlike the curate's egg, was ok in places, bad in places and terrible in some. This did not prevent us from having a great time. We were in no hurry, the 80 odd k's being a mere doddle. Would not have helped, were I in a hurry. Anna insisted that I stop every 50 meters or so to take pics. I don't need to tell you that he is off again, do I? I did ask him to stop fairly frequently. 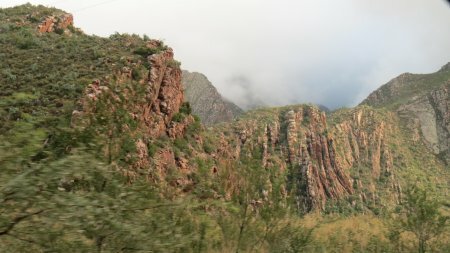 The scenery in the mountains was magnificent. 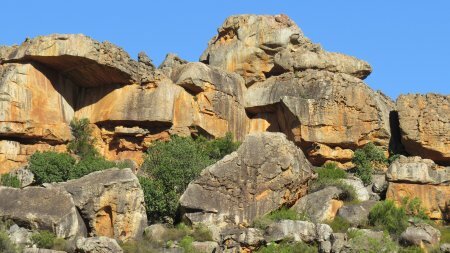 Here are a few samples: There was life in the mountains. 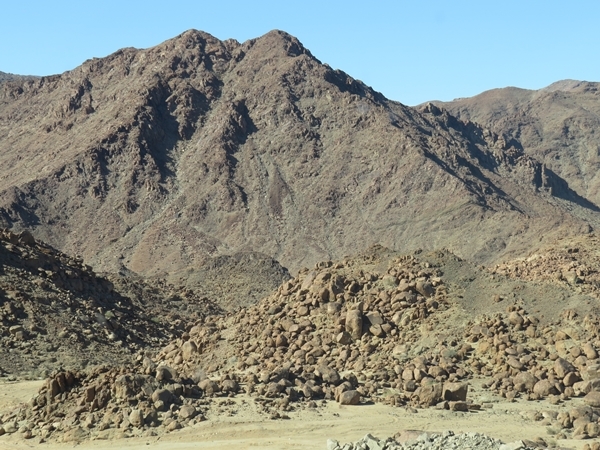 More mountains: And very rocky areas. 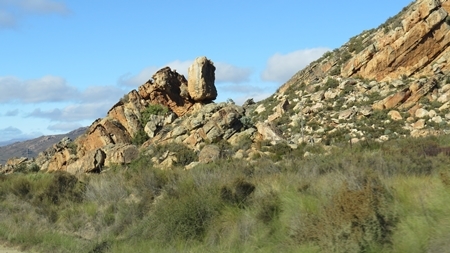 With large, very large rocks next to the road. 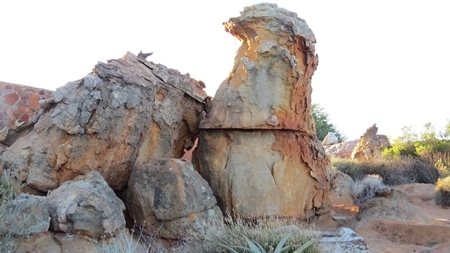 At some point in the past these rocks must have broken off the mountain and came tumbling down. I wonder how often? Must be a skrik if you are on the road at the time.... 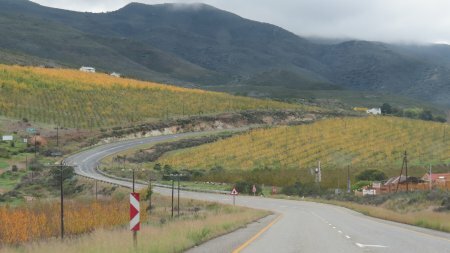 Along the way we passed by Cedarberg winery. 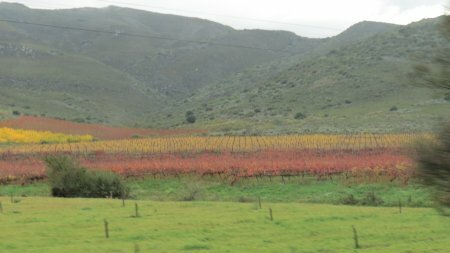 We did not stop, as we know and don't particularly like their wines. We arrived at Mount Cedar in due course and were directed to what we thought to be a hut, but turned out to be a 3 bedroom house. The one top right. 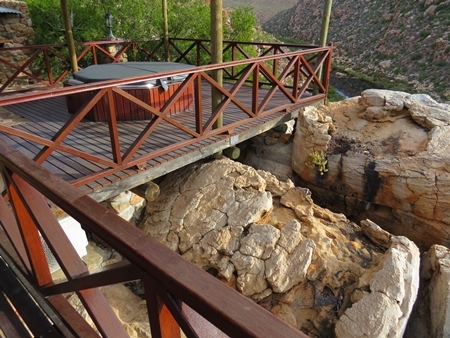 Great home for 3 days, with a deck mit jacuzzi nogal And great views: We had arranged to have dinner in their restaurant the first night. 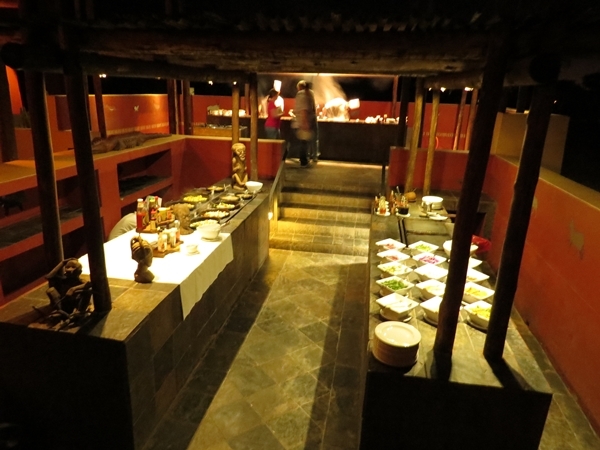 The idea was to test the cuisine and then, should it be great, we would dine there every night. This is where the food shopping came in,see. If their food is bad, we would cook. There is no way I would have the Innkeeper eat at the restaurant 3 nights in a row if the food is bad. Bad food makes him grumpy, and a grumpy Innkeeper is not a pleasant thing. 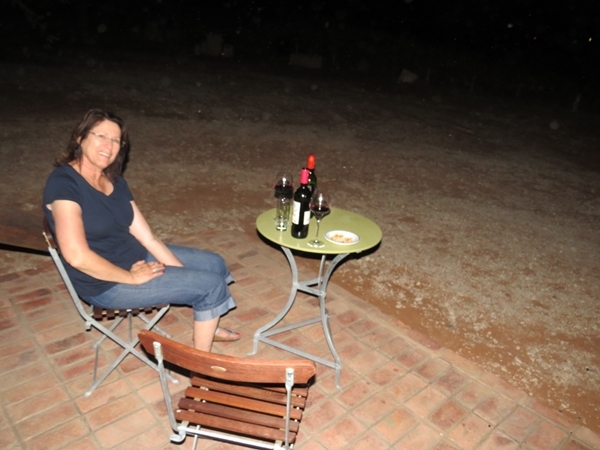 We were the only guests, and they offered to bring the evening meal to our house – saves time all round. They brought a reasonable butternut soup and a plate each of what could best be described as ouma's chicken. 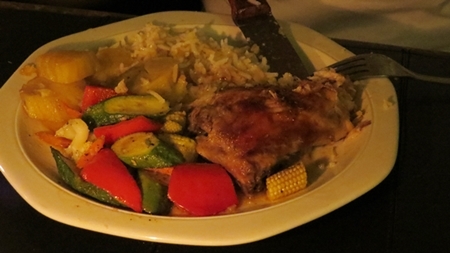 A roasted leg quarter, rice, sweet potato and a mess of stir-fried veg. Not inedible, but certainly not worth paying good money for. So, the next two nights we would see what Anna has in store. By great coincidence the Mes Amis Canasta championship is held this year at Mount Cedar over two days of intense rivalry. The two finalists have both been passed fit (more or less) and the champ will be decided on a best-of-five basis. In the case of a draw, an arm wrestle will decide the winner. 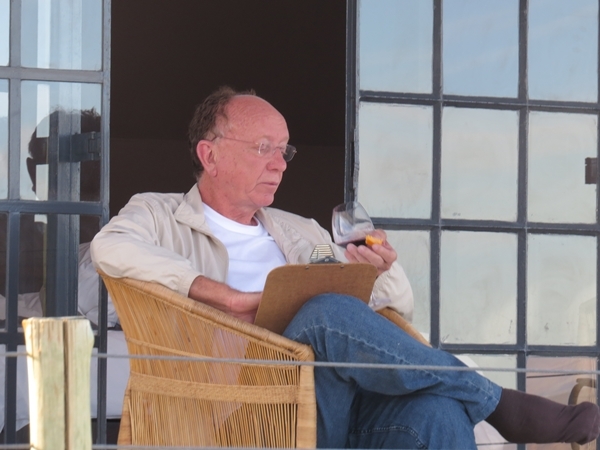 To make sure that there will be no second or bottom dealing and changing the rules at will, the MACA (Mes Amis Canasta Association), has appointed a neutral referee whose decision will be final. 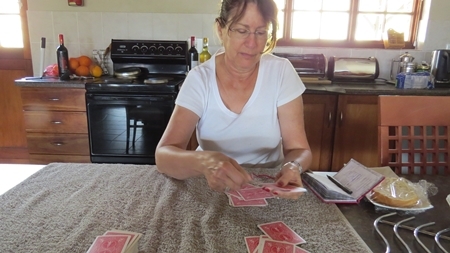 The result of the 2014 Mes Amis Canasta Championship is a controversial one. There was almost unanimous unhappiness with most of the decisions of the referee, Cyril B. All 50/50 decisions went the way of one finalist and some of these were so blatantly skewed that a one-eyed sloth could have seen that the fix was in. At one point fist fights broke out in the stands, and it was only when a few glasses of Pittekou was handed out to the spectators that things calmed down. 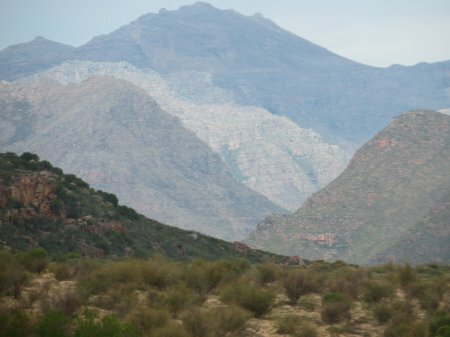 Shortly after the match, the Cyril B. was seen heading for the hills. In any event, the official result is that the winner and 2014 Mes Amis Canasta Champion is.........Anna! Final score was 3-1. Here she is seen holding aloft the trophy. and earlier, dealing a hand. Note the right wrist – if they saw you on a Mississippi riverboat holding cards in that way, you'd be shot on the spot. Clearly a cardsharp. 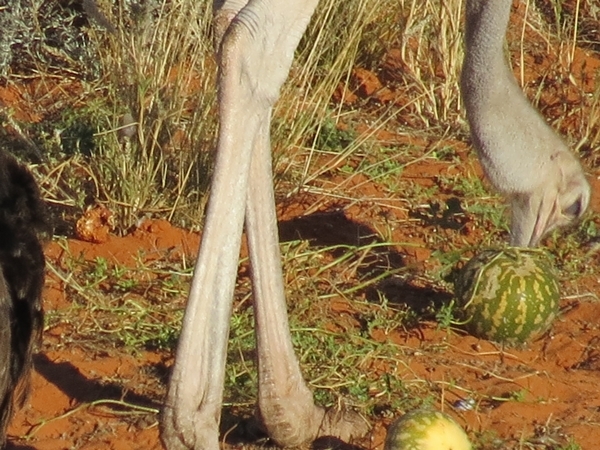 Next year I'll be pushing for an ostrich as ref. 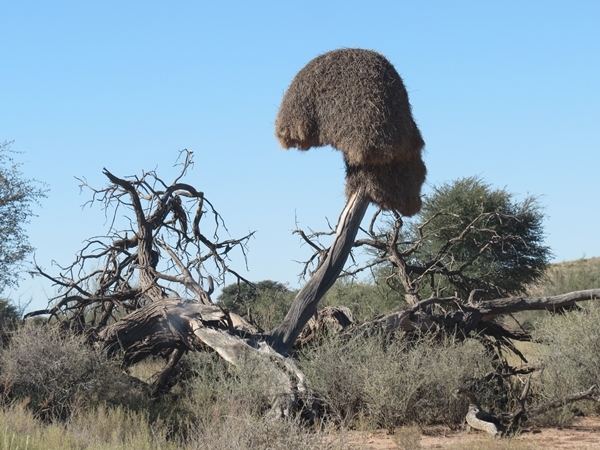 Don't stand any nonsense, ostriches. Probably less fleas as well. I am, of course, clearly the better player. The Innkeeper's strategies are easy to spot and counter. For a clever man, he can be very transparent at times. In any event, the 2014 champion is me, moi, ekke!! 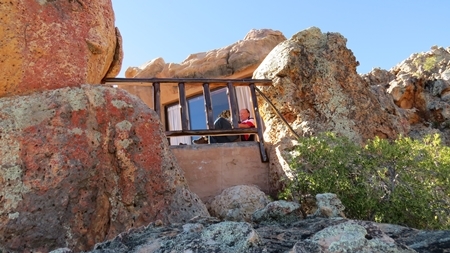 We spent our two days at Mount Ceder lazing around. 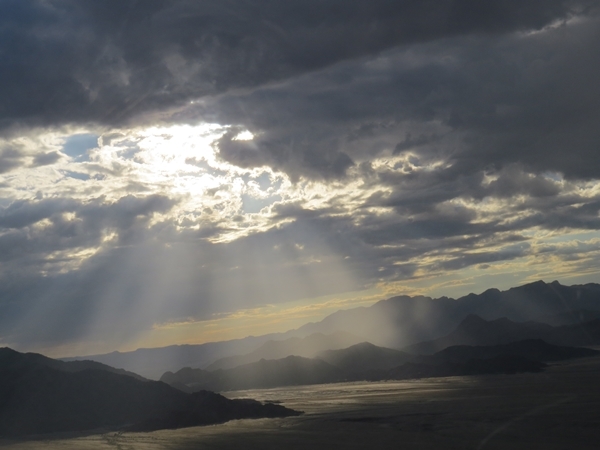 Watching the clouds roll in over the mountains. Two stunning days spent with my wonderful man. All a girl could ask for. 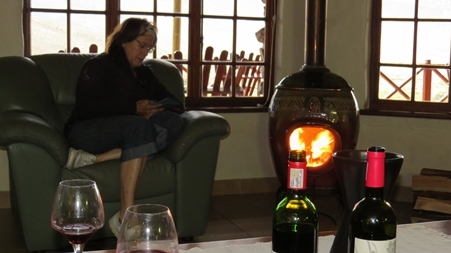 Reading and drinking wine around the fireplace. Drinking wine and eating. Polishing parts. Sitting in the Jacuzzi. Generally two wonderful, lazy, hazy days, enjoying the view, the quiet and sleeping in. We actually managed 8am on both days. Shameful! 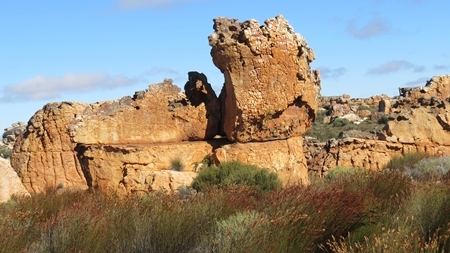 Our next stop is the Kagga Kamma reserve. 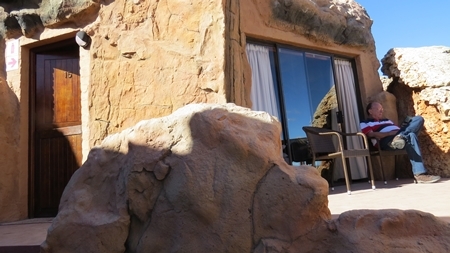 We have booked a night in a cave. The honeymoon cave, nogal. 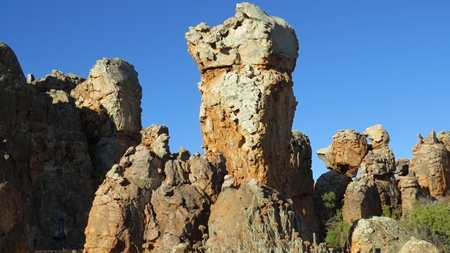 Off to Kagga Kamma. 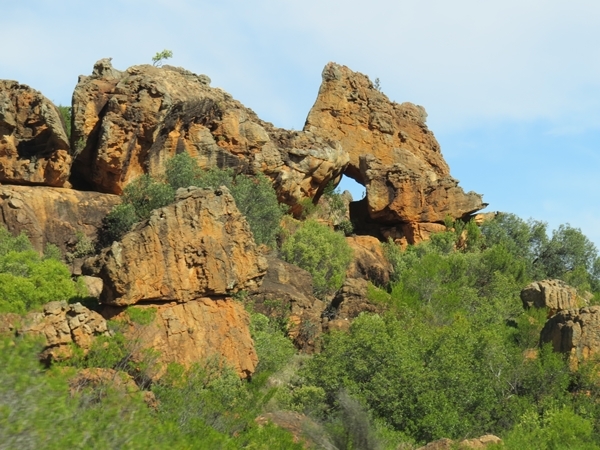 We have known about the place for a while, and the cave thing has always intrigued us. Not, I assure you, because I have any desire whatsoever to drag Anna around by the hair. And even if you had, I will not enjoy or allow being dragged around by the hair. 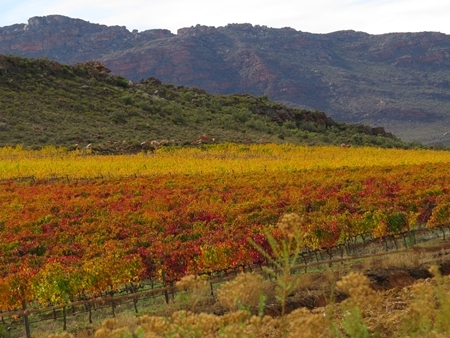 So, dragging being out, maybe we could have a glass of wine and see something new. 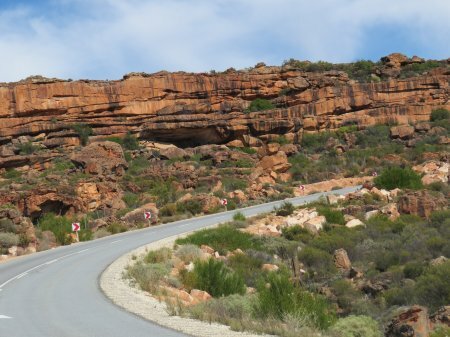 The road to Kagga Kamma led first through the mountains, unfolding great landscapes. All in all a great drive. The lodge is, to say the least, a peculiar affair. 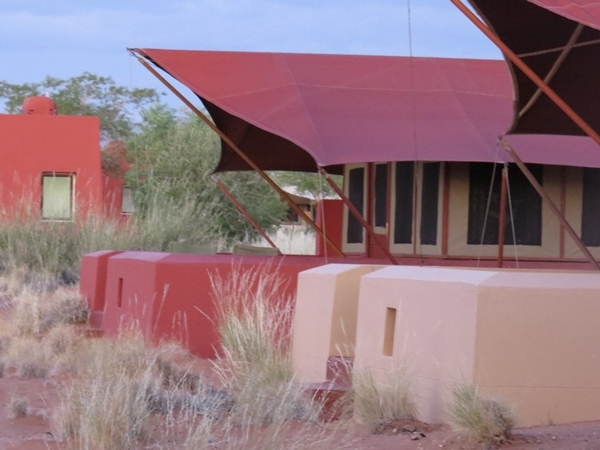 There are weathered sandstone outcrops everywhere and the lodge is located around one of these. 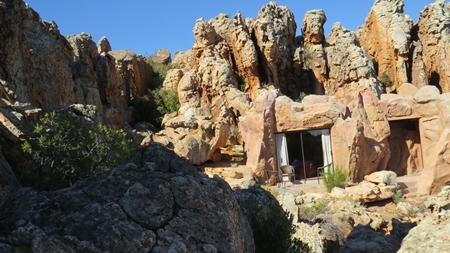 The accommodation is mainly in caves. 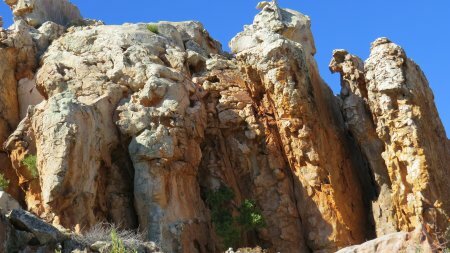 Sort of – parts natural rock and parts faux rock. Nevertheless charming in a bizarre way. 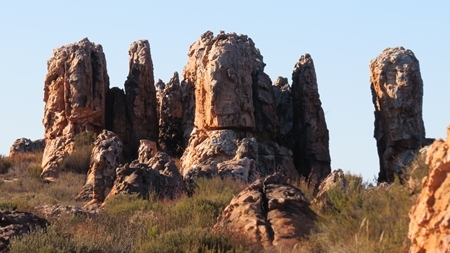 The sandstone formations reminded us of those in Arches National Park in Utah, just on a smaller scale. But just as spectacular It was chilly, this high in the mountains. 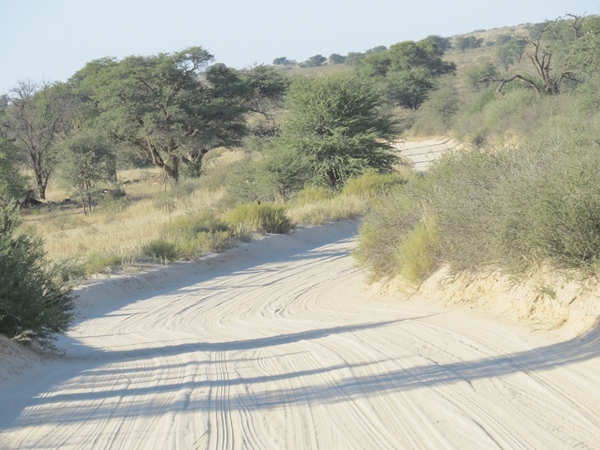 Despite that, Anna wanted to go on a game drive. I protested. I pleaded. All to no avail. 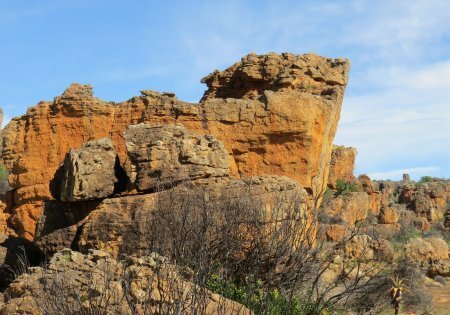 She wanted to see more sandstone thingies. The woman was adamant. I donned 6 layers of clothing, swigged a rum or two in the hotel bar and was as ready as one could be to withstand subzero temperatures. Look at the other two guys in the bar, both wearing parkas. And this inside with a huge fire roaring in the fireplace! Yawn. It was about 11C outside. Nowhere near freezing. 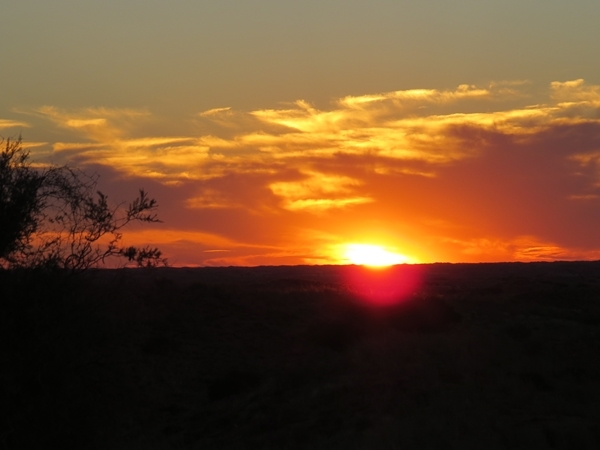 It could be a bit chillier later, but this was a sundowner drive, after all. 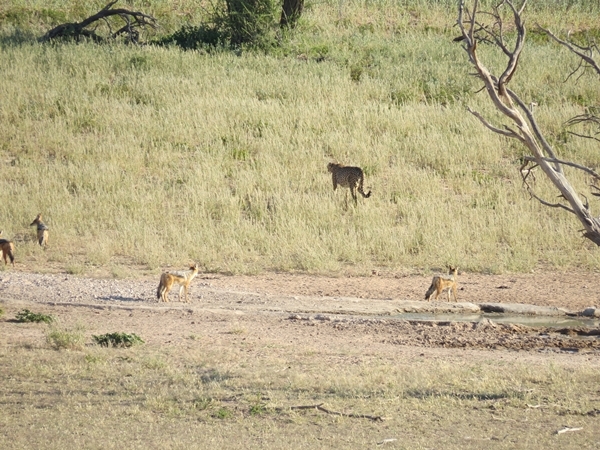 We actually saw a few animals. We sat in the cold waiting for the sun to set. After 5 minutes I was pelting the thing with rocks to get it down. 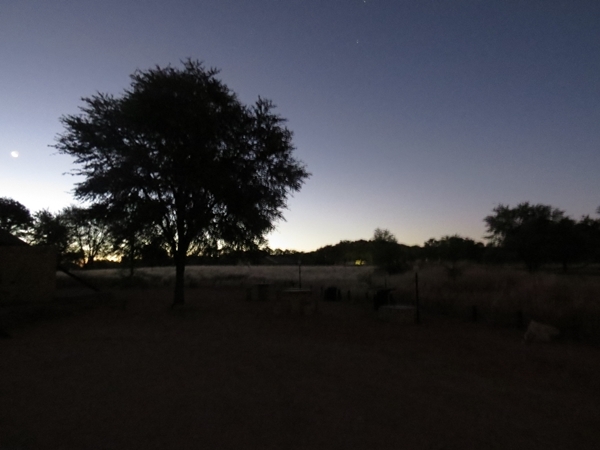 It eventually set with little ado – the sky was clear and bright and the event did not make for good pics. The drive back was, to say the least, numbingly cold. I will in all probability get a severe illness due to the cold. That will mean that we will have to return to Mes Amis immediately, cutting our holiday short. This will certainly involve that I be medivacced by helicopter, requiring a lengthy period of recuperation. During which I will have to be fed by hand, and my fevered bow wiped with cloths. And stuff. In the end the mention of dinner was enough for the Innkeeper to make a remarkable recovery. Enough, at least, to deal with what he said were some very good lamb chops. 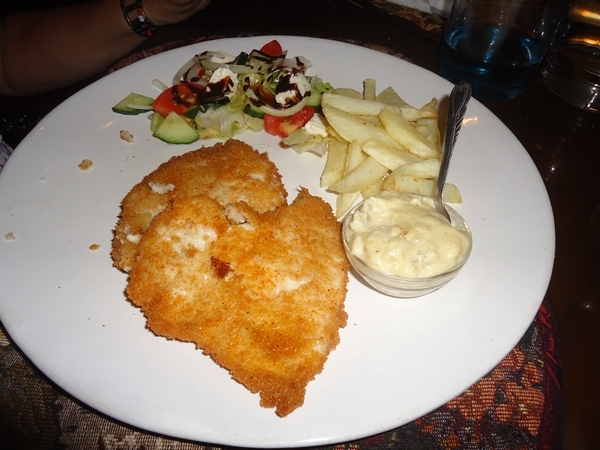 I had a great sole – prepared just the way I like it: dredged in flour and then fried. 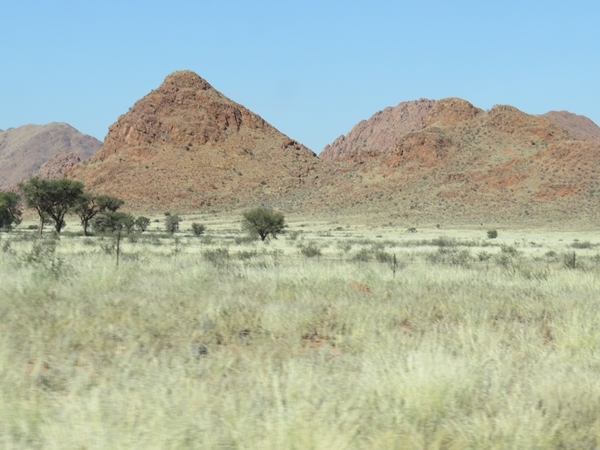 We slept badly – the aircon, required to ward of the cold, was switching on and off, the way aircons do. This was enough to make for fractured sleep. 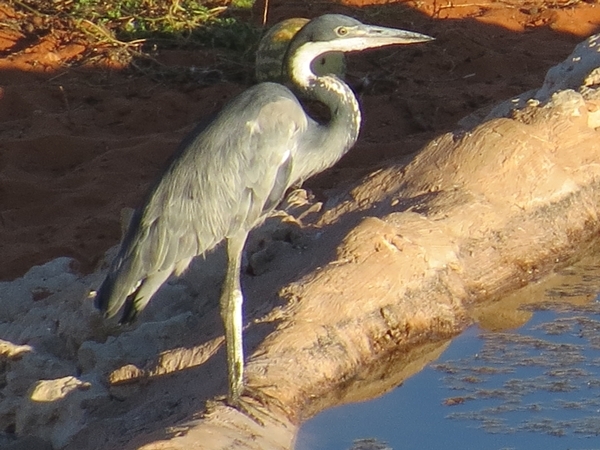 After an indifferent breakfast, we left, with the morning sun reminding us why we came. 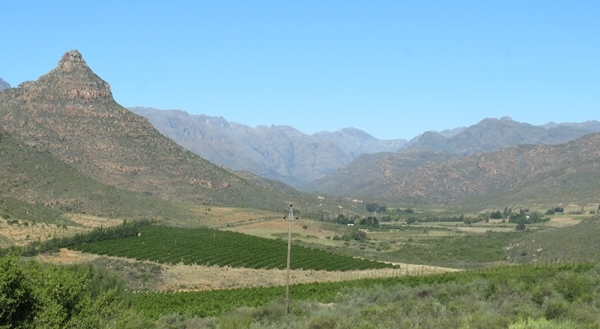 On to Tulbagh. 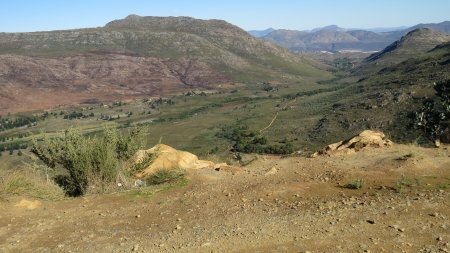 The road via Sitrusdal is a 70km detour, but it is the last road in the Sederberg that we have yet to traverse. So traverse it we will. Our last gasp in the mountains, as it were. We were glad that we took the detour. The mountains are magnificent. I want to return here. 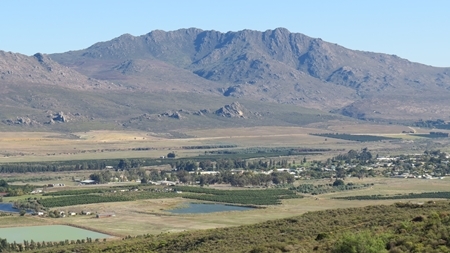 Citrusdal is located in a fertile valley, with plenty of, wait for it, citrus farmers. We drove through and went on to Tulbach, a town that we found to be mildly interesting, with nothing that we want to record. We found lodging at the Drostdy Hotel. The only remarkable feature of the dinner was the wine list. Just look at the prices. 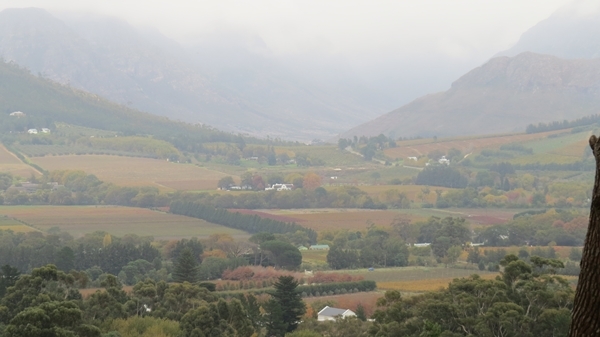 Strong rain on the tin roof woke us early and we headed to Franschhoek. 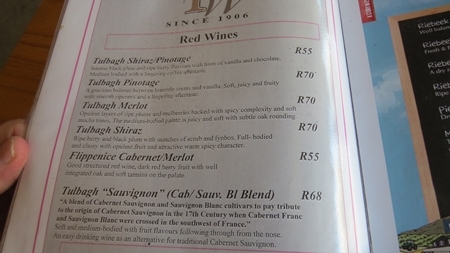 All place and business names in Franschhoek have French names. I know that the French settled this area, but the complete frenchifying does come across as a bit pretentious. We have a room at Le Ballon Rouge, a b&b. Across the road is Centre Ville and on the other corner Le Auberge Bleau. All a tad too much. We had lunch at La Petit Ferme. 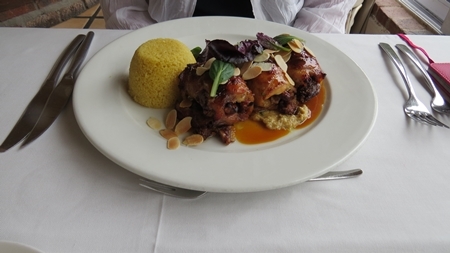 Anna had deboned chicken thighs stuffed with nuts and dates, and I roasted leg of lamb wrapped in aubergine, with roasted peppers, polenta and minted yogurt. Both dishes very, very good. Excellent, in fact. We decided to end our holiday here, and intended returning home the next day. 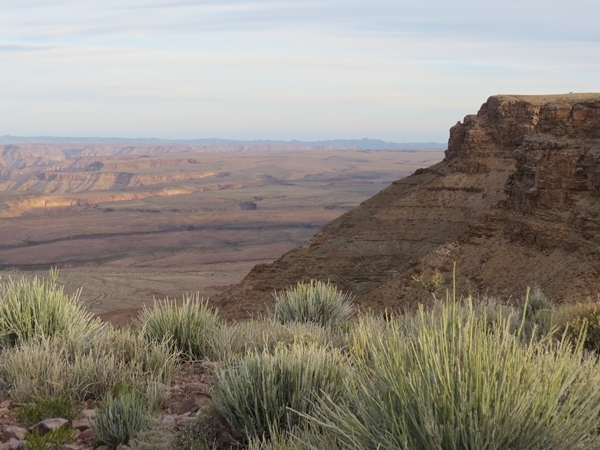 Exploring new vistas is what we seem to do best. 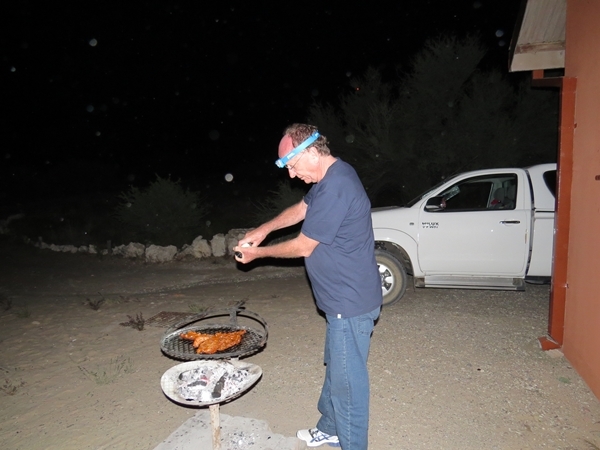 The three nights and two days at Mount Ceder were as long as we can sit still. For the moment we have run out of new areas to explore, hence the decision to go home. 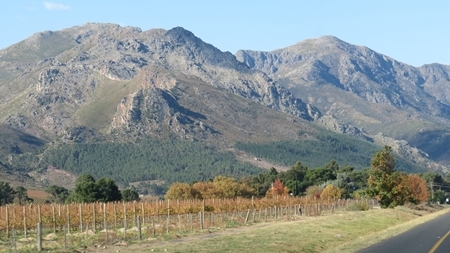 After dinner at Le Bon Vivant, one of Franschhoek's rated eateries. Great meal. Not superb; for that there were too many missteps. The highlights were: My beef and foie gras starter: Thinly sliced strips of beef encasing a foie gras pate, with strips of foie gras, orange jelly, toasted brioche and strips of apple. Almost there - the apple did not work. 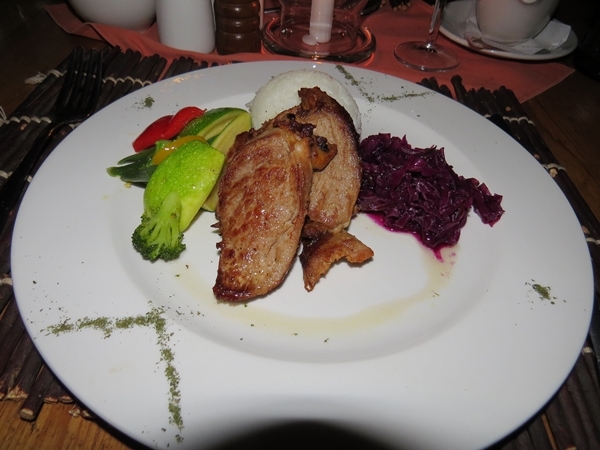 My main was a delightful loin of pork - succulent and tender. Blurred pic, though. Anna's chocolate mousse and my caramel souffle. We had only the small camera and all the pics were blurred. Sorry. Good way, culinary-wise, to end the trip. 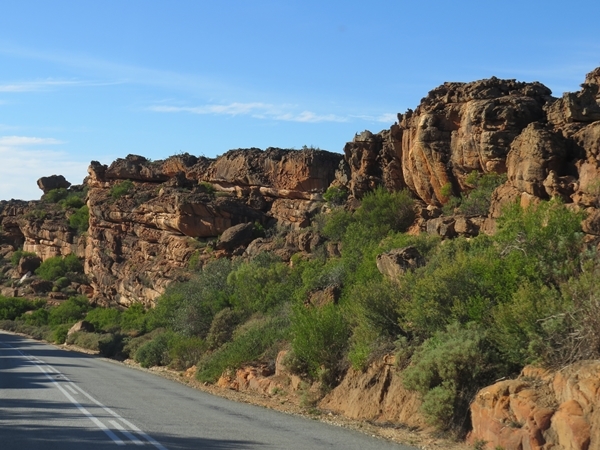 On the way home, we saw enough along Route 62 to console us: Thus ended our road trip. 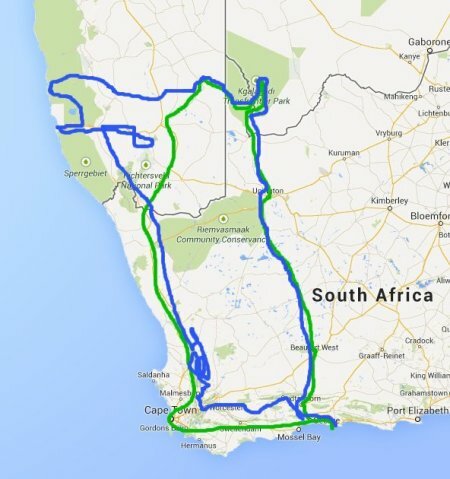 5430km. 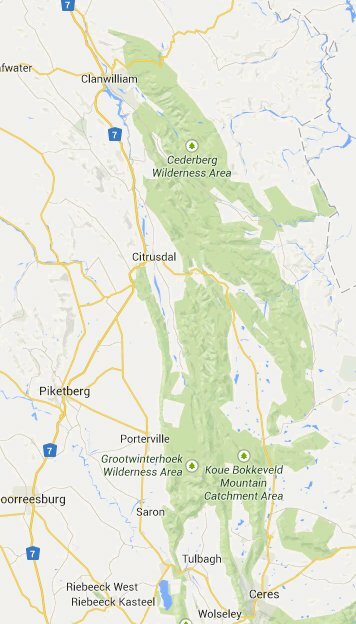 We did not quite follow our planned itinerary - here is the map - planned in green, actual in blue. We need to deal with the come-down-after-the-holiday-high. 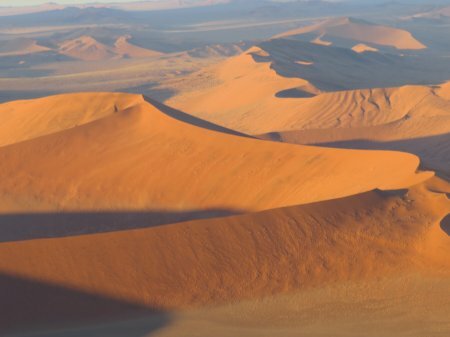 As soon as we are settled in, we mauy well post some pics that landed on the editing floor, as well as our thoughts on the Kgalagadi, Namibia and so. Anna is a prolific photographer. 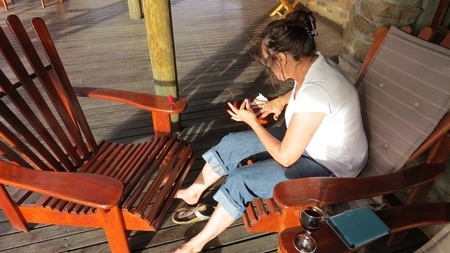 In between navigating (which, in the Kalahari is not much of a chore), she clicks. If it moves or looms, it gets photographed. 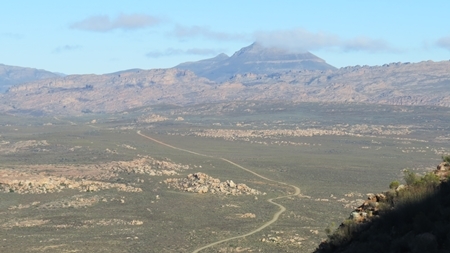 Lots of things looming in the Cederberg. 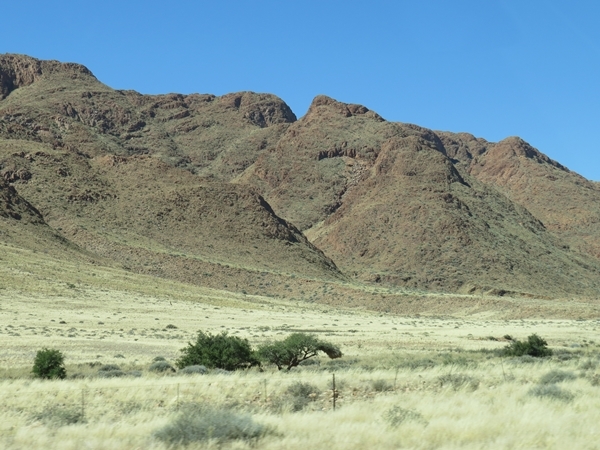 And around Sossusvlei. Hence lots of pics. 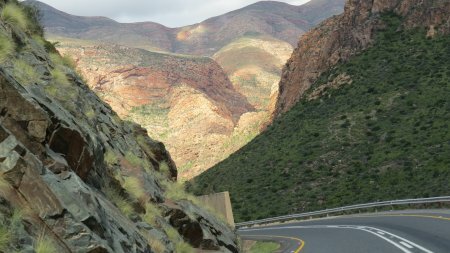 In the limited blogging time on the road, only a few were selected, sometimes in haste. 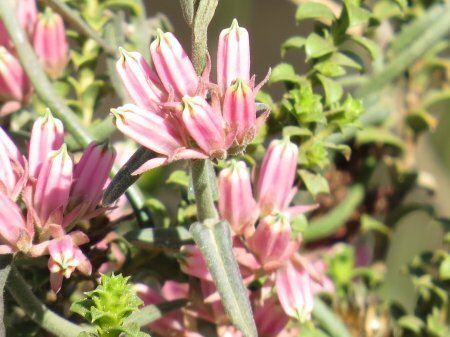 We will use this post for some of the pics that did not make the blog. But first, allow us a look back on the holiday. 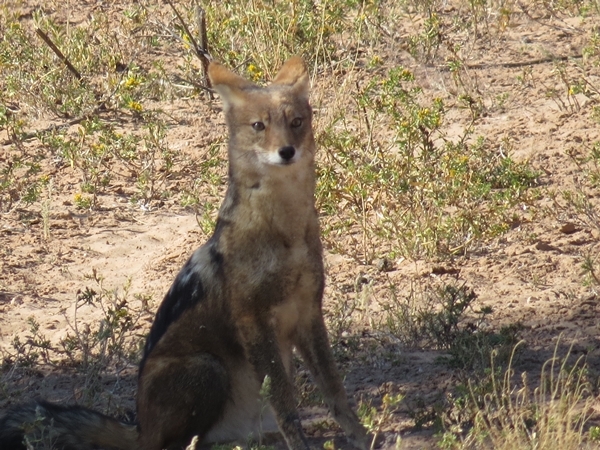 The Kgalagadi was interesting and now and then great. 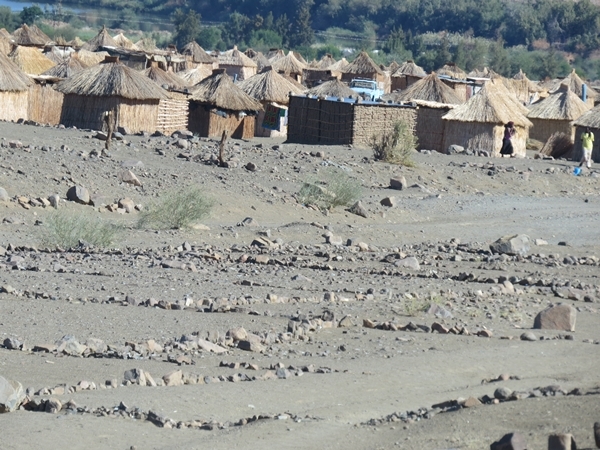 The main problem was that almost all the roads run alongside the dry riverbeds. This means that the scenery is mostly the same. 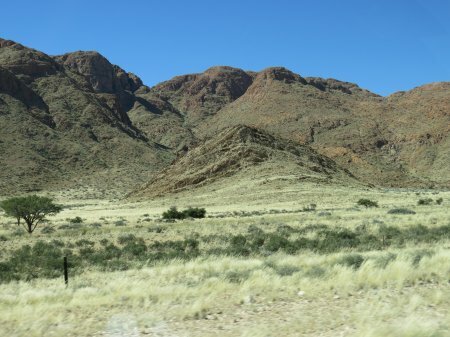 Not a lot of animals to be seen from the road either. 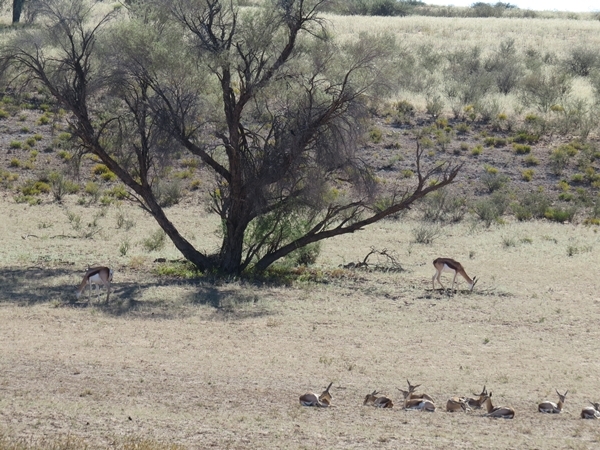 Mostly Oryx, Wildebeest and Springbok. The animals stop moving around between 10 and about 3. 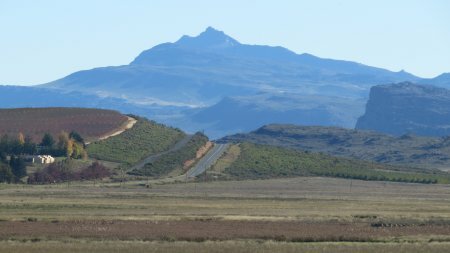 Due to the long distances and condition of the roads, a lot of time was spent driving during this time with very little to be seen. 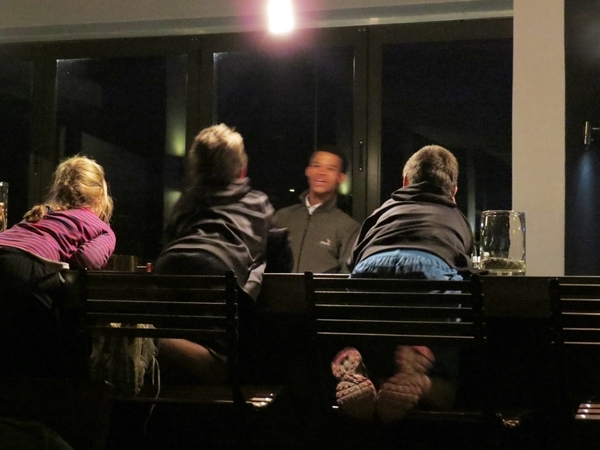 The upside upside was that the evenings were great- quiet apart from various animal noises. 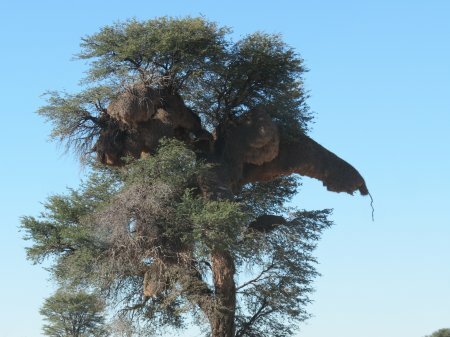 And, of course, the cursed wind that one night at the Kalahari Tented Camp. 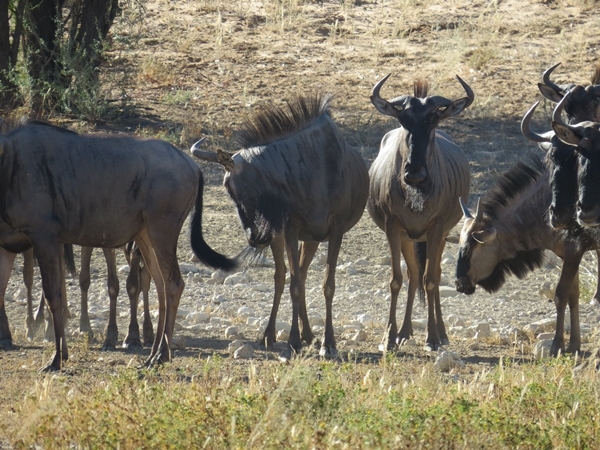 And that we saw a lot at the tented camp. 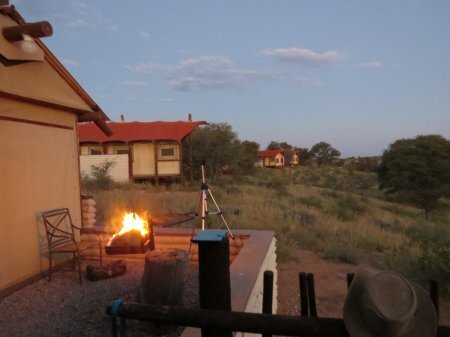 This would, when we return, be our strategy - Kiliekrankie for 2 or so nights, the Kalahari Tented for 3 nights. 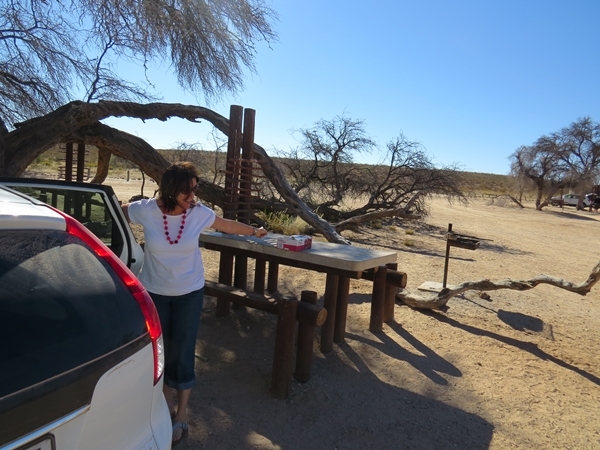 Hunker down at the water holes with wine to hand and limit the amount of driving. 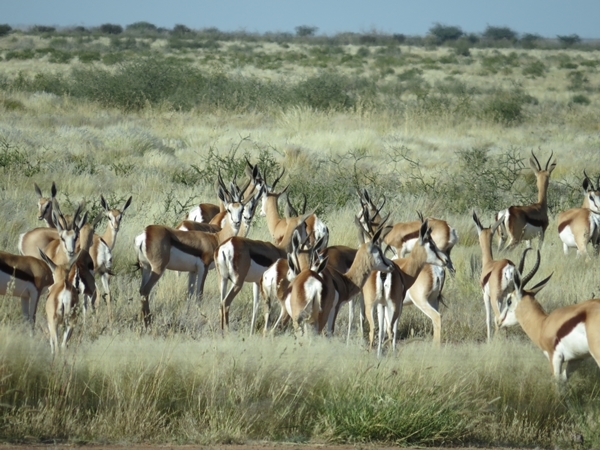 In fact, fly to Upington, rent a car, 7 days in the Kgalagadi. That is, I think how we will do it. Because we do want to return. 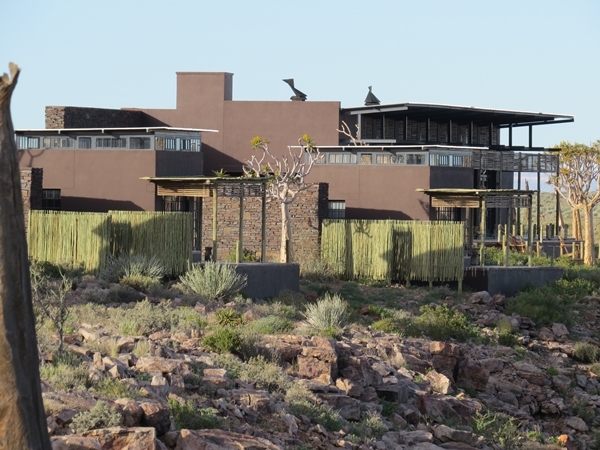 If we can get a guarantee about wind up at Mata-Mata...... We wasted time by staying 2 nights at Anib Lodge in Namibia. 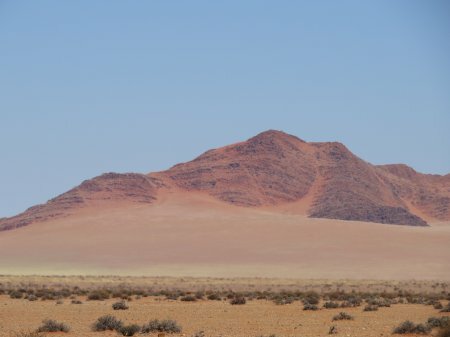 We should have scooted right on to Sossusvlei. 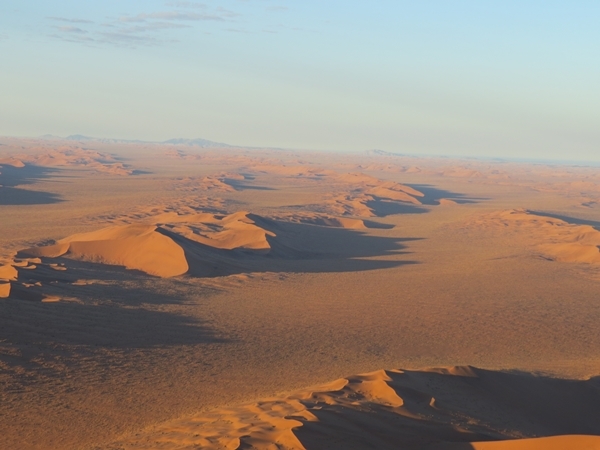 The entire south western part of Namibia is spectacular. But you have to drive it to really appreciate the beauty. 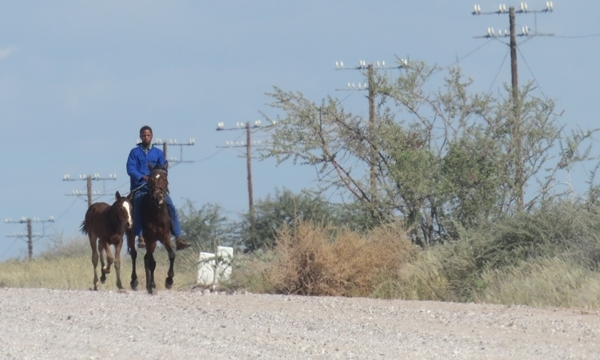 Namibians were friendly throughout. 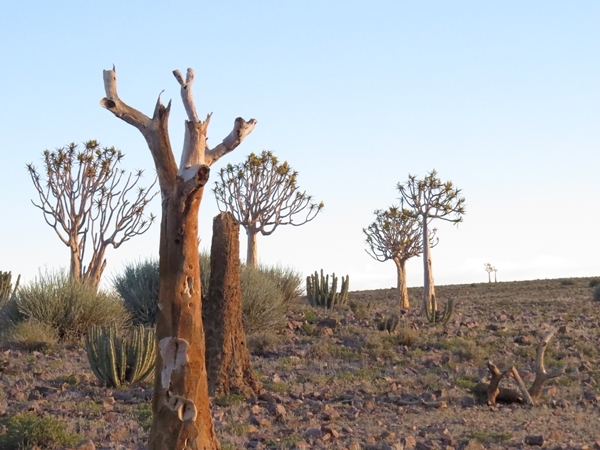 I was thrilled to the bone by that part of Namibia. I always thought it would be flattish, like most of the southeast. 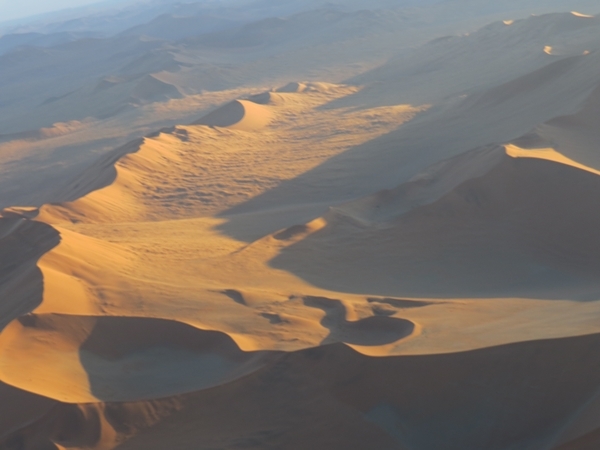 But no - wonderful landscapes and breathtaking desert scenes. I want to return. 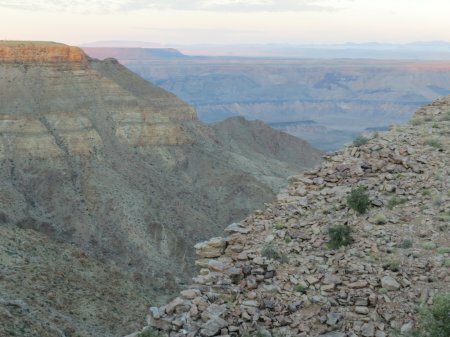 The Fish River Canyon is difficult to appreciate from one spot. One should walk it, I think. 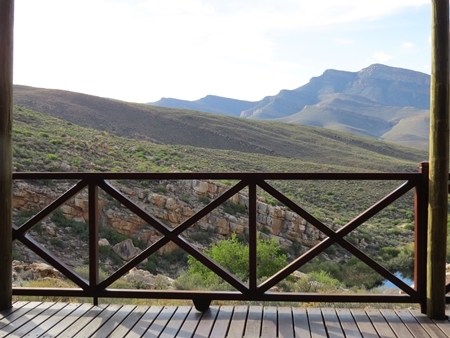 Which was not an option for us, so I guess that what we saw at the Fish River Lodge was as good as it gets for us. No desire to return. Agreed. 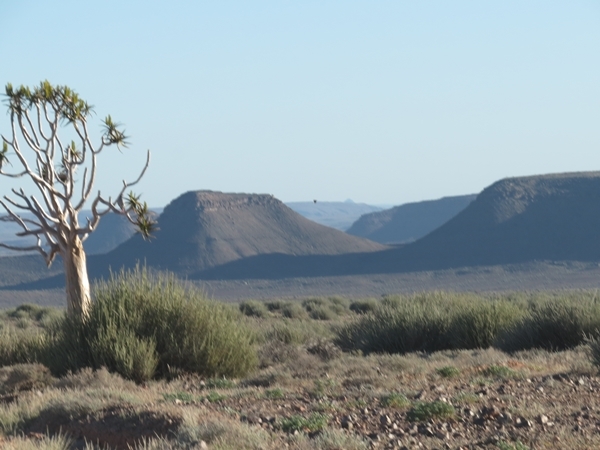 Somehow I thought, without really thinking about it, that a) the Richtersveld is in S.A. and b) that it is like the Karoo. a) It is not and b) it is not. 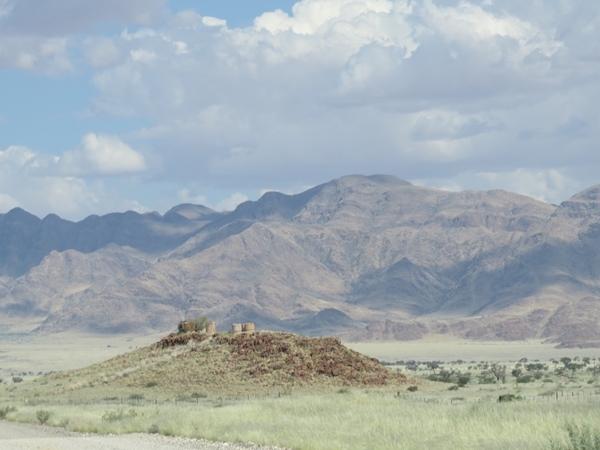 Clearly part of Namibia and as mountainous as anything. 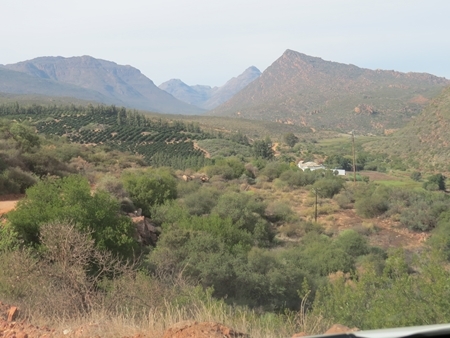 We drove through is on the way back to S.A. It deserved more. Next time. 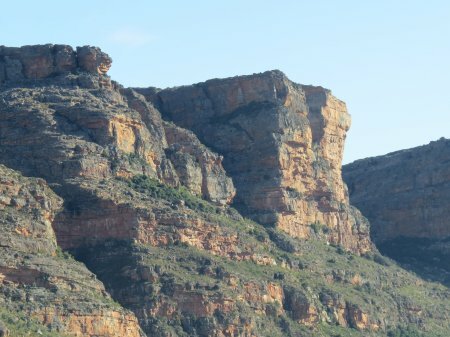 I love mountains and rock formations. 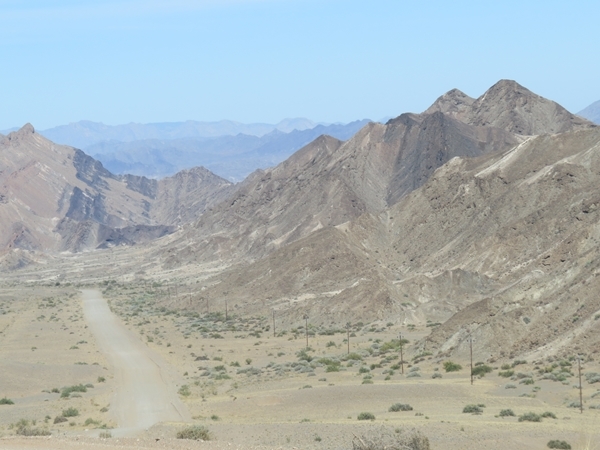 The Richtersveld was fabulous. 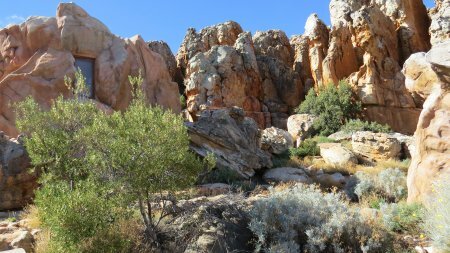 In the Cederberg I was in my element. 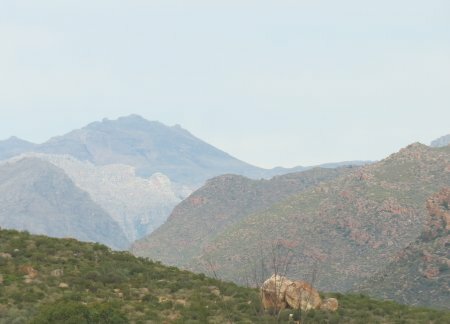 Mountains galore. 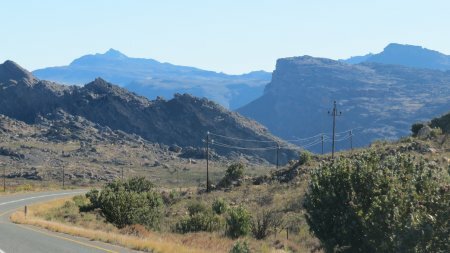 When we settled down, I just wanted to up and see more of the mountains. Great scenery. We will be back. Overall we had a great time. Which was as per expectations, because, after all, we were there together. 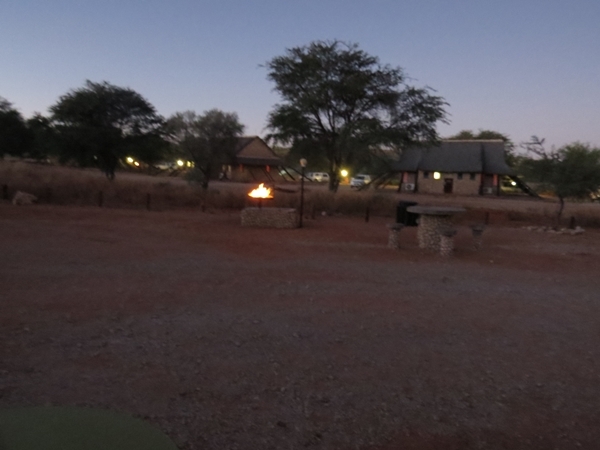 Even when the surroundings were blah, like at the Anib Lodge, we had fun and enjoyed ourselves. We have, I think, a deep reservoir of happiness that we can draw upon. Going anywhere with Anna is a joy. As was this trip. True, although it helps is you are surrounded by beauty. Going anywhere with the Innkeeper is a joy. As was this trip. So, on to pics. 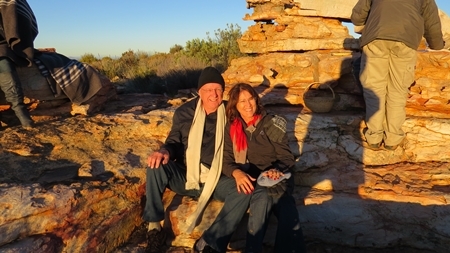 Cederberg Enterprising lodge owner in Namibia - backlit pics on half drums forming a sort of windmill with a solar panel providing light. 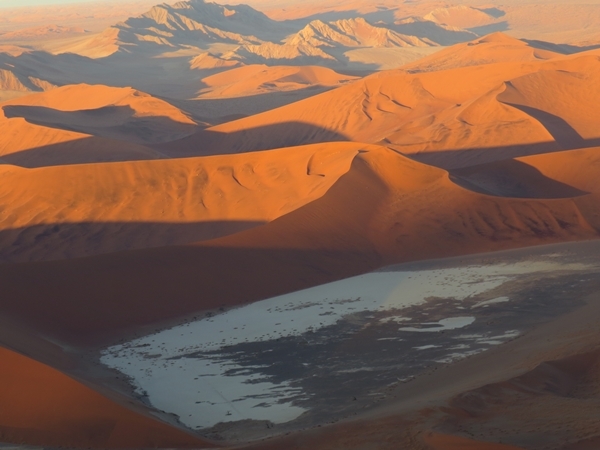 Sossusvlei fairy circles - still a mystery. 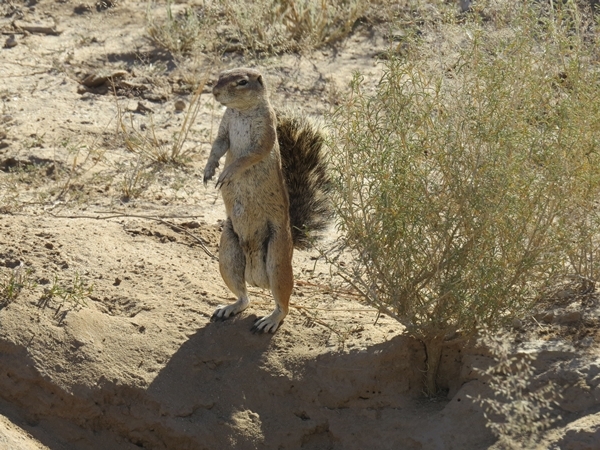 Franschhoek Groundsquirrels Route 62 In and near KaggaKamma. 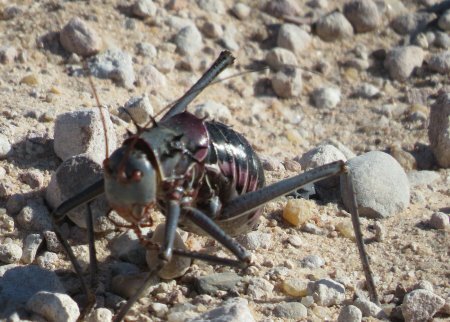 In the Kalahari these crickets were everywhere. We must have squished a gadzillion of them on the roads. 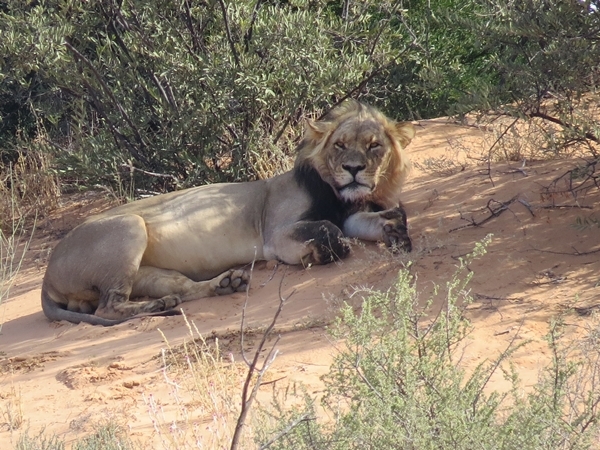 Lion in the Kgalagadi. 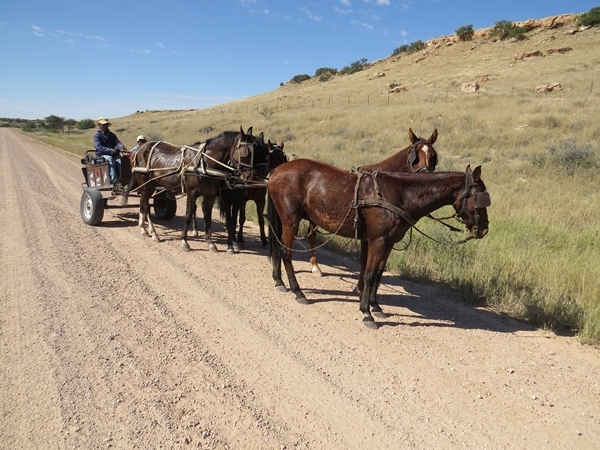 Won't see him dashing hither and thither along bad roads, will you? Far too sensible for that. 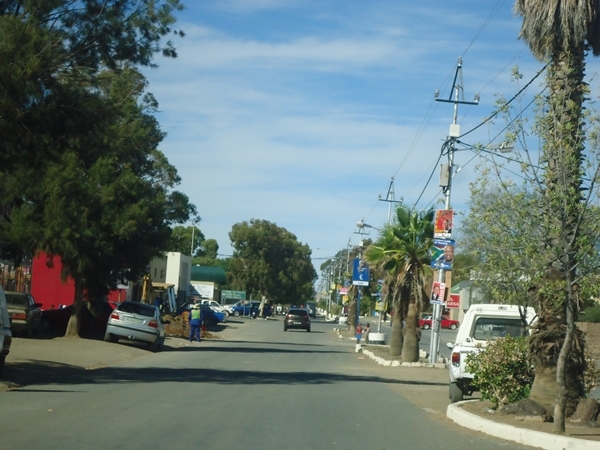 The main street of Loxton, on the way to Upington. 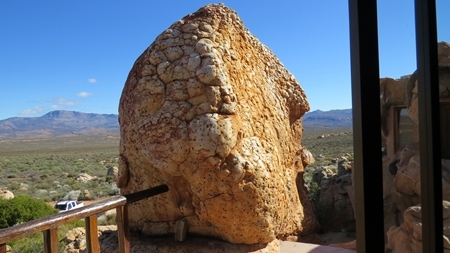 Anna getting a massage at KaggaKamma. 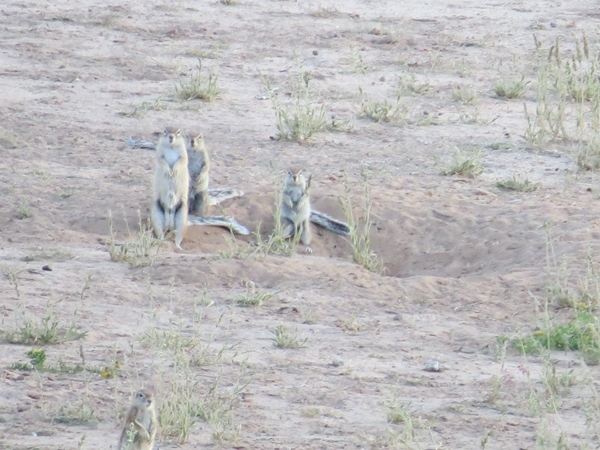 In the Kgalagadi, a flock of sparrows were feeding. 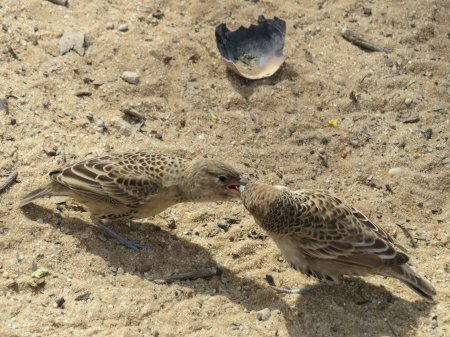 The one on the right, presumably a youngster, was shivering its feathers and being fed by the rest. Why the shivering, I don't know. Maybe it is Sparrowese for "Feed me! Feed me!" 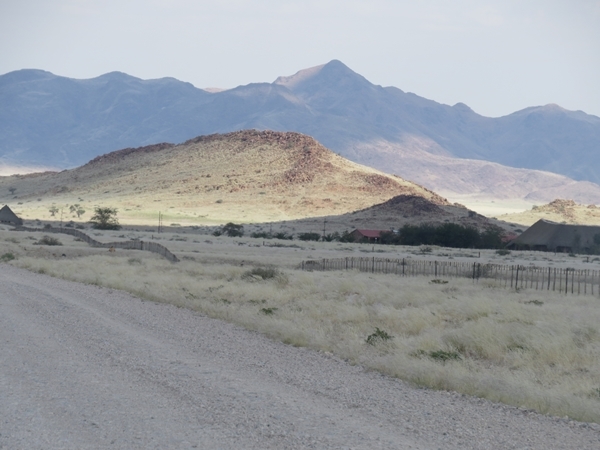 Leaving Sossusvlei. On the way to Tulbach. 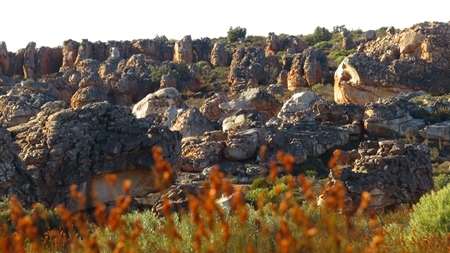 In the Cederberg. 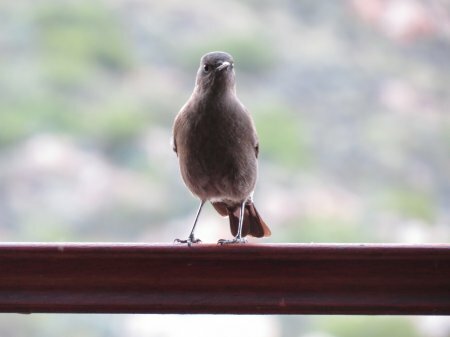 Bird at Mount Ceder. 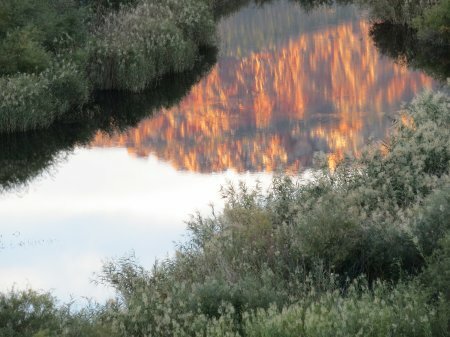 Reflection at Mount Ceder. 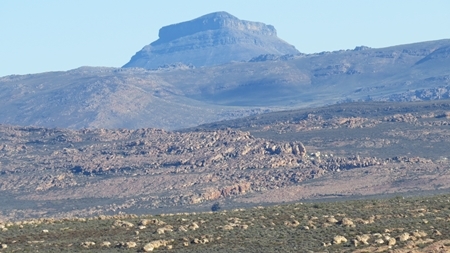 Mount Ceder. 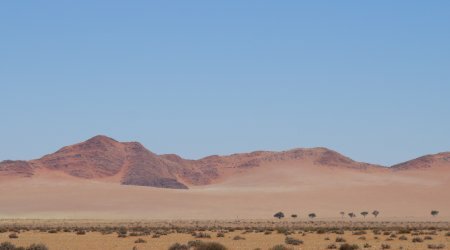 Sossusvlei. 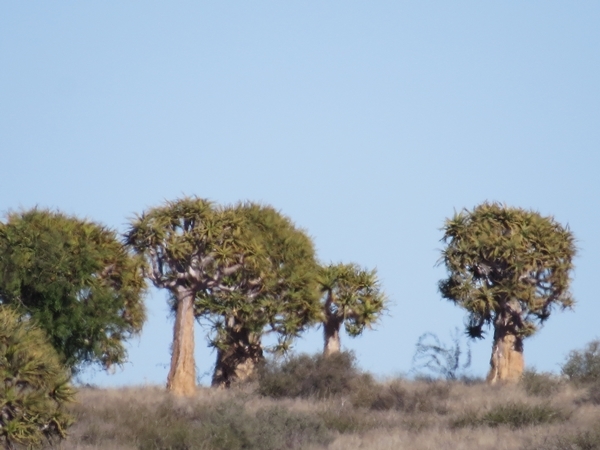 Fish river trees. 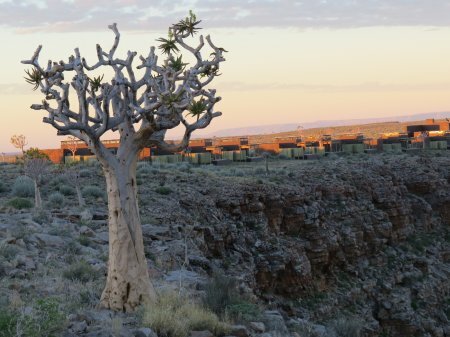 Trees at Sosusvlei. 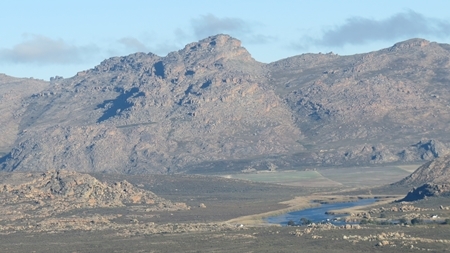 The helicoptertjie. Note that the Innkeeper is praying. 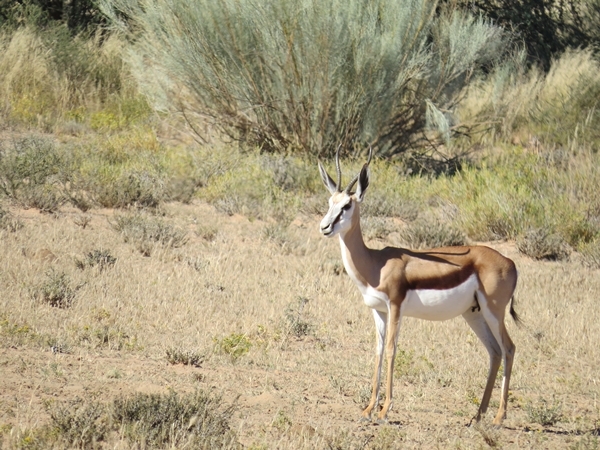 Springbok at the water hole at the Kalahari Tented Camp. 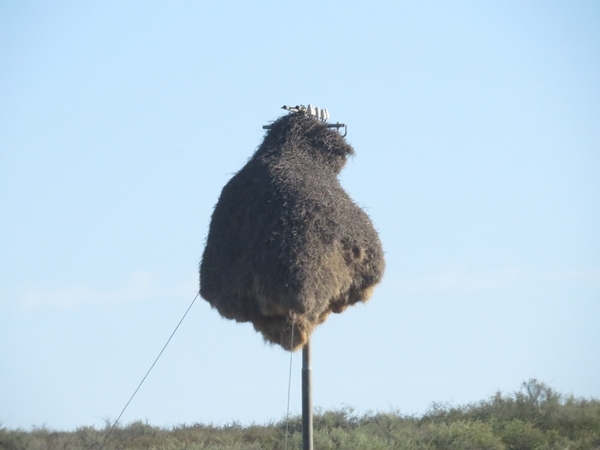 Weaver nest in the Kgalagadi. 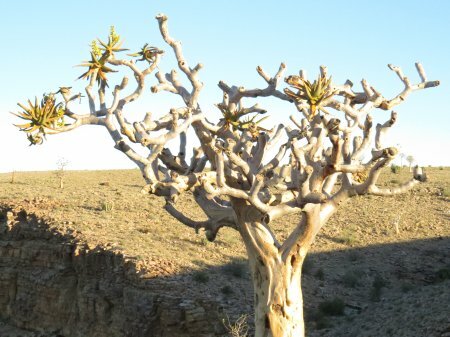 Tree near the Fish River Canyon. 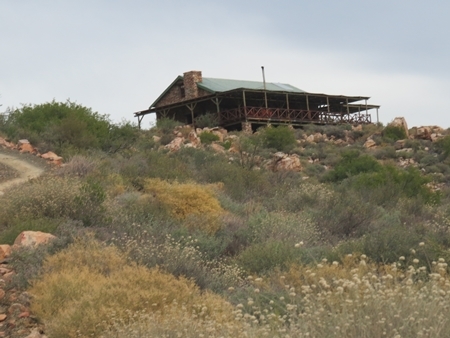 The Fish River Lodge. The Kalahari Tented Camp and the Innkeeper's fire. Thing of beauty, ain't it? And, just to prove the point, the fire at Nossob. You may print this and keep it to hand next time you need to light a fire. Just as inspiration, you know. Anna plans to complete the research on next year's holiday. Germany, I am told, it will be. Indeed, my dear Germany next year. Until then, totsiens!